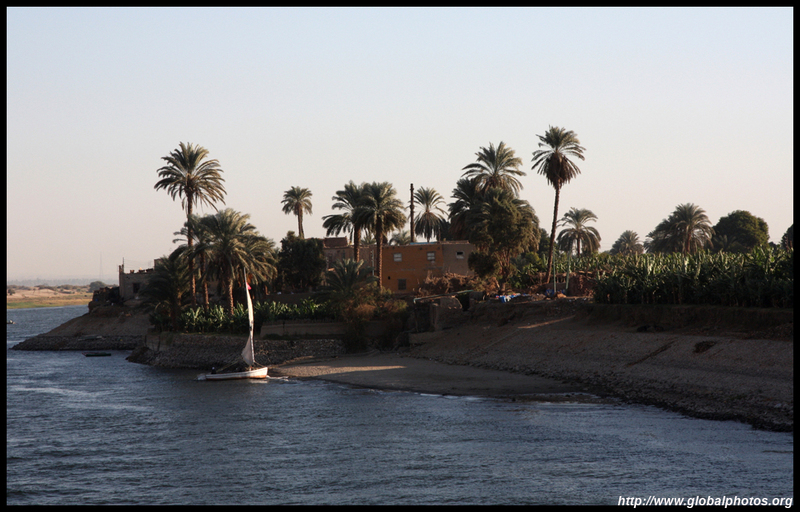 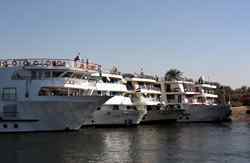 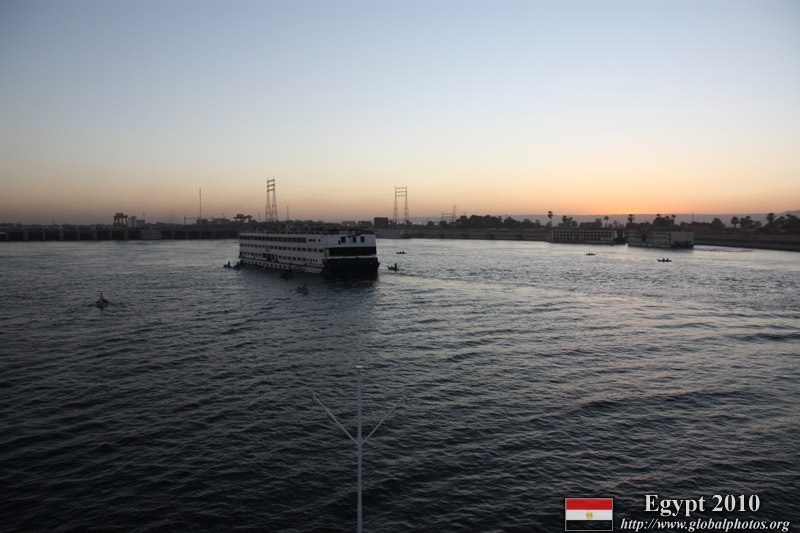 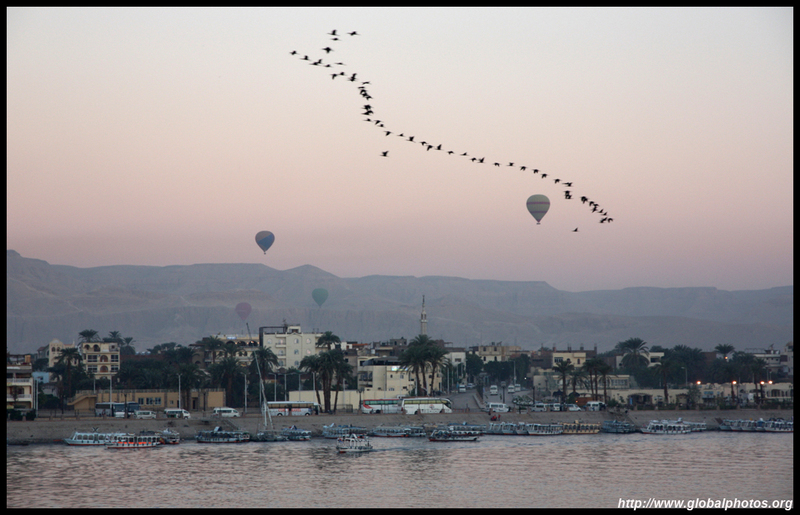 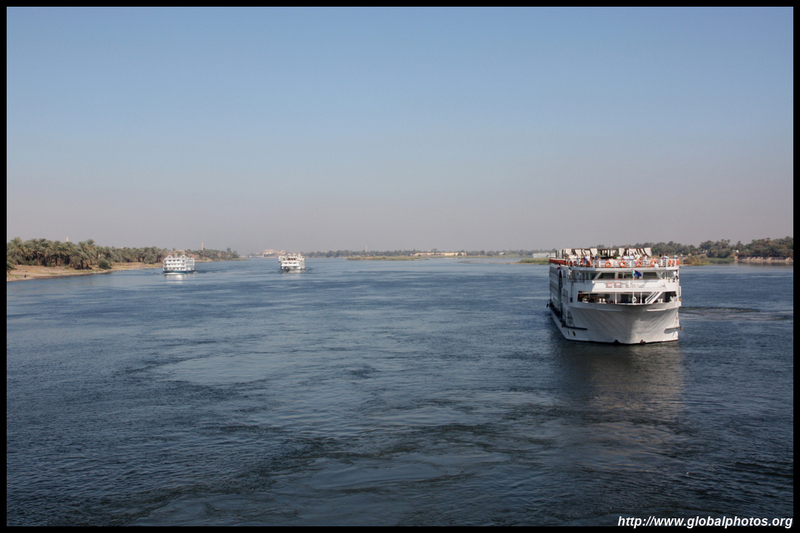 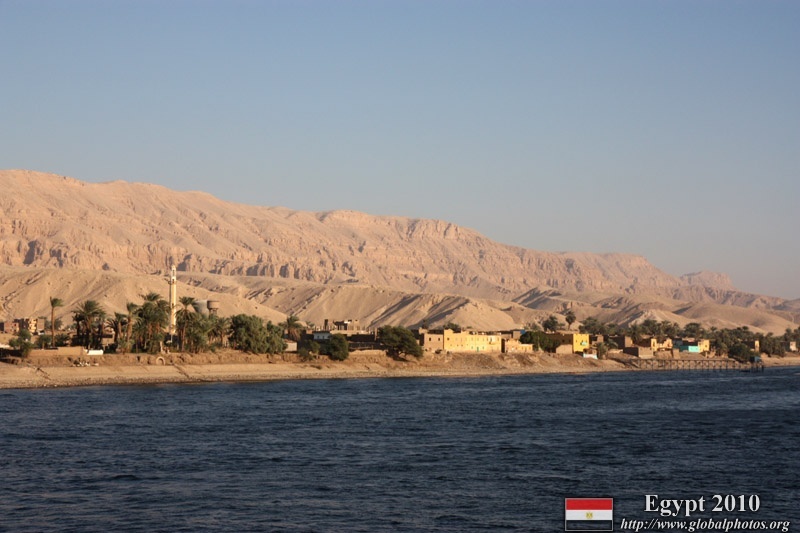 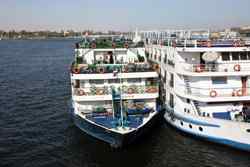 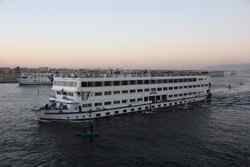 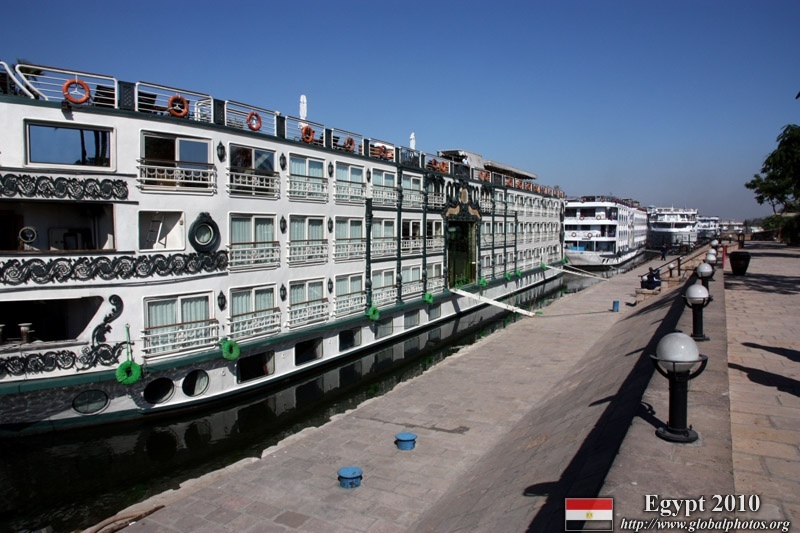 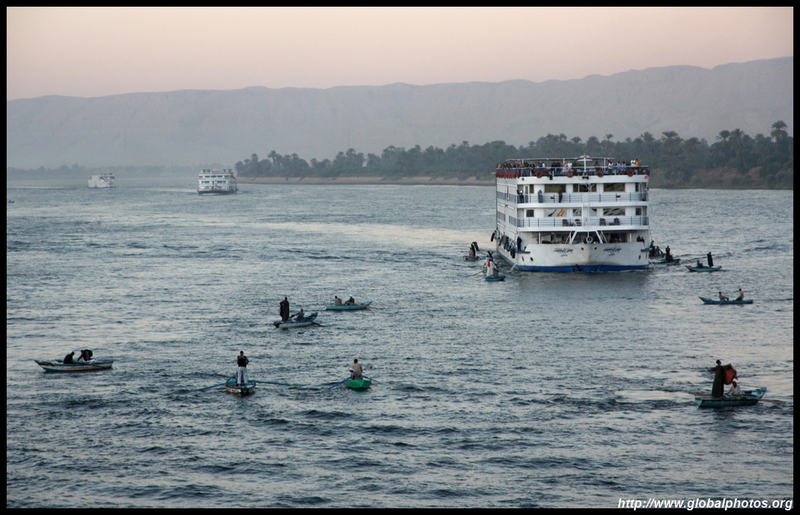 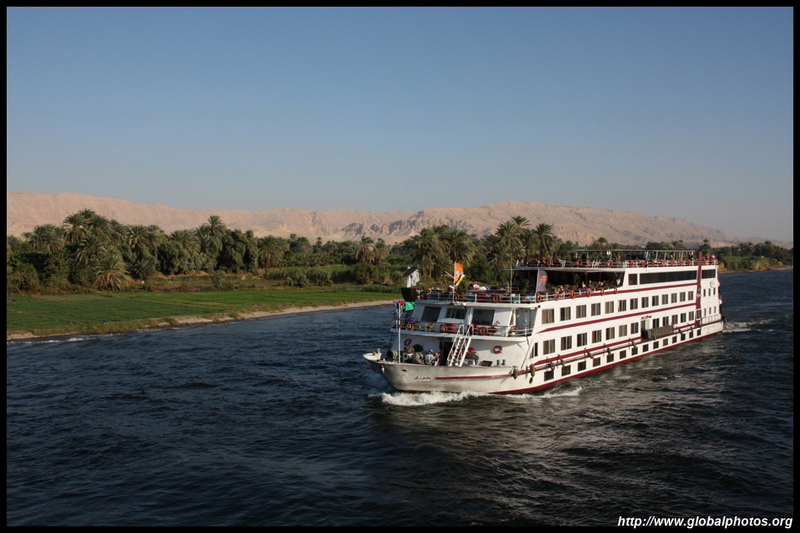 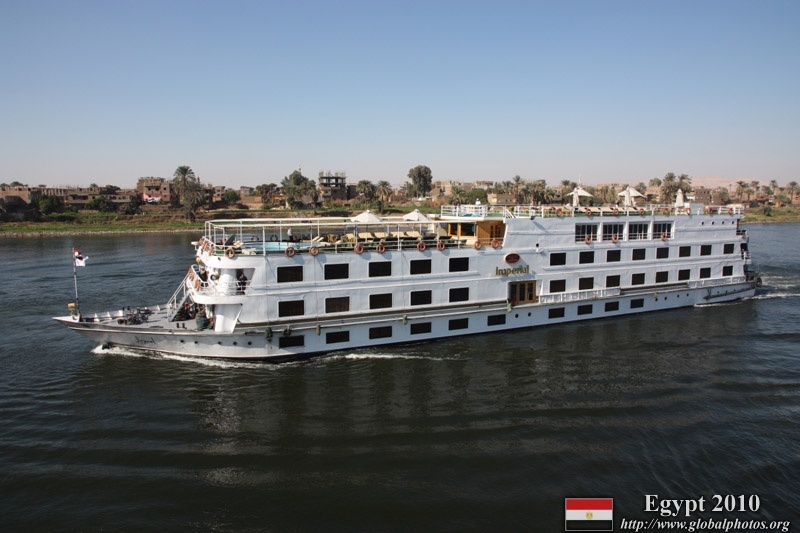 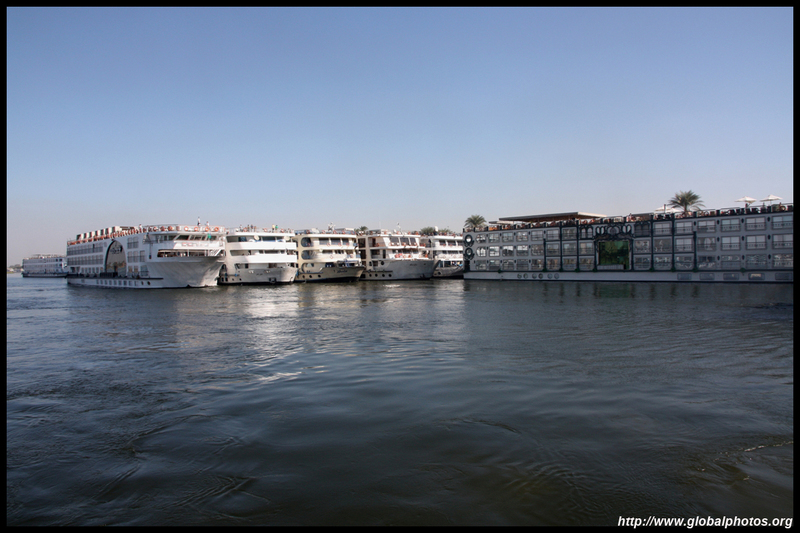 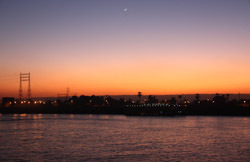 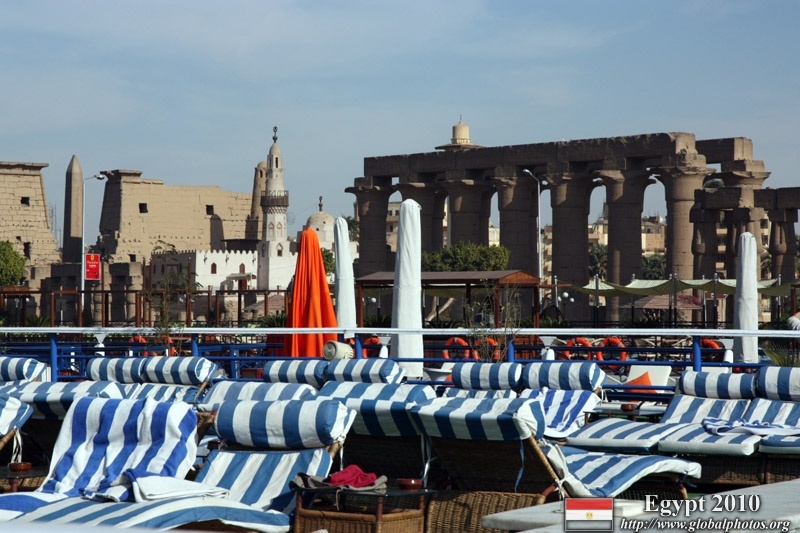 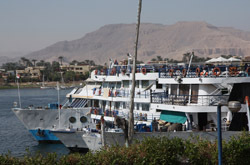 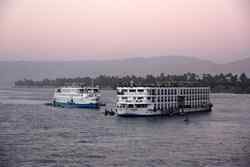 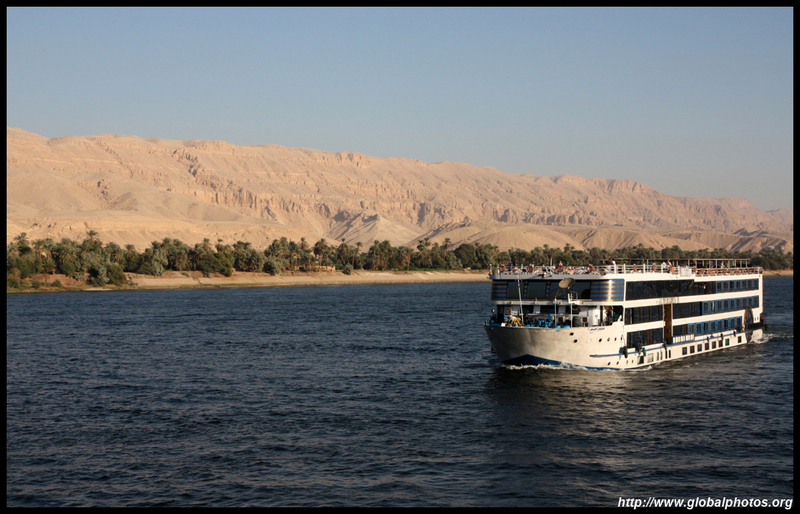 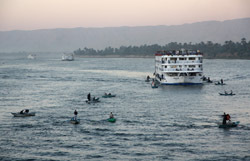 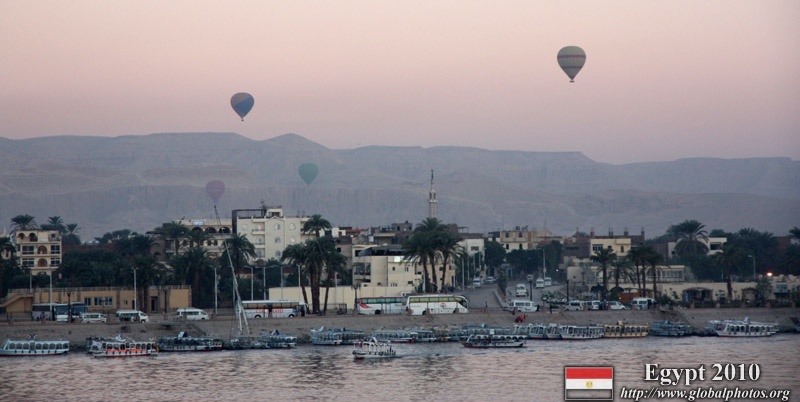 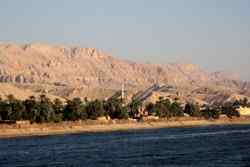 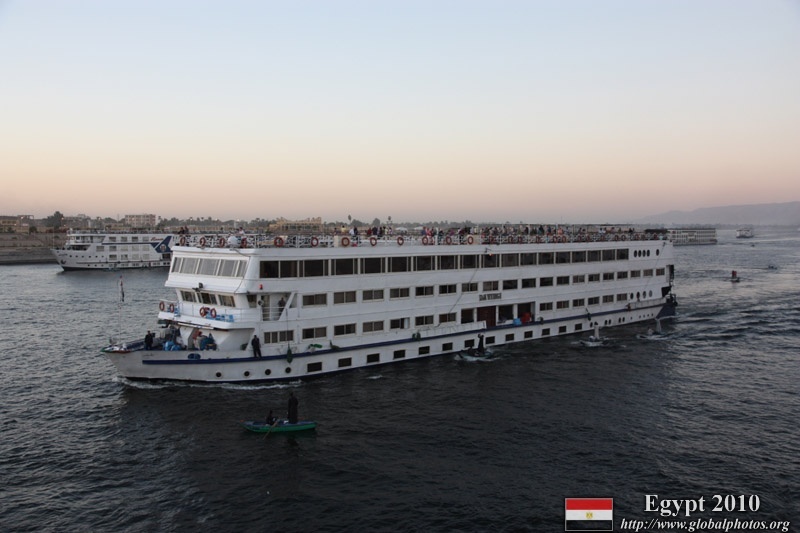 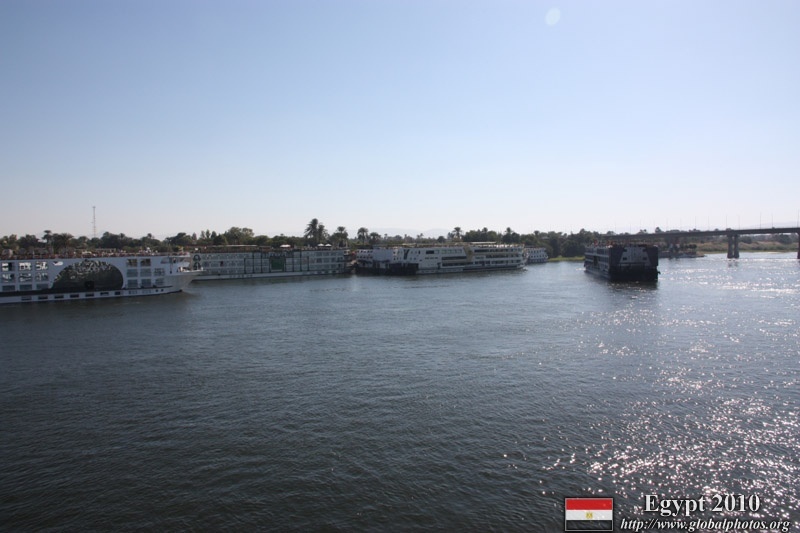 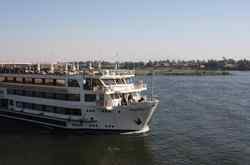 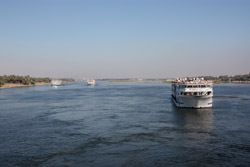 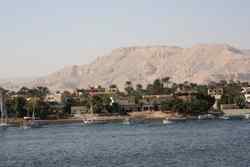 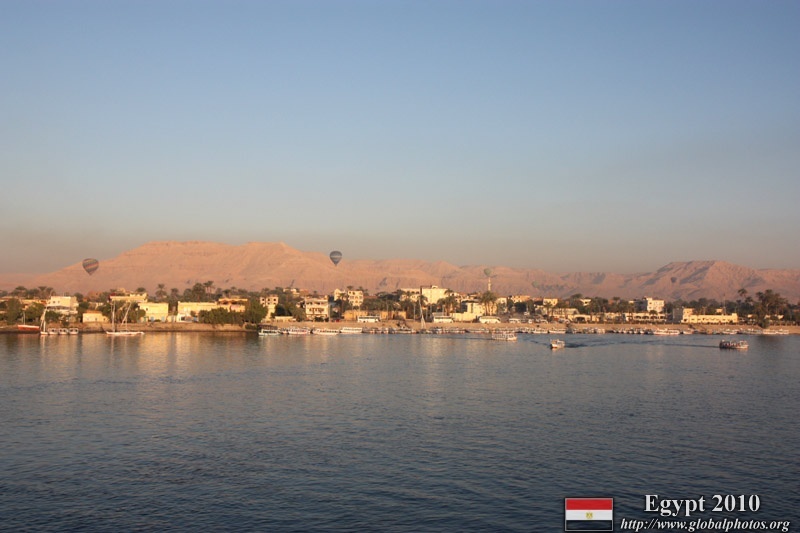 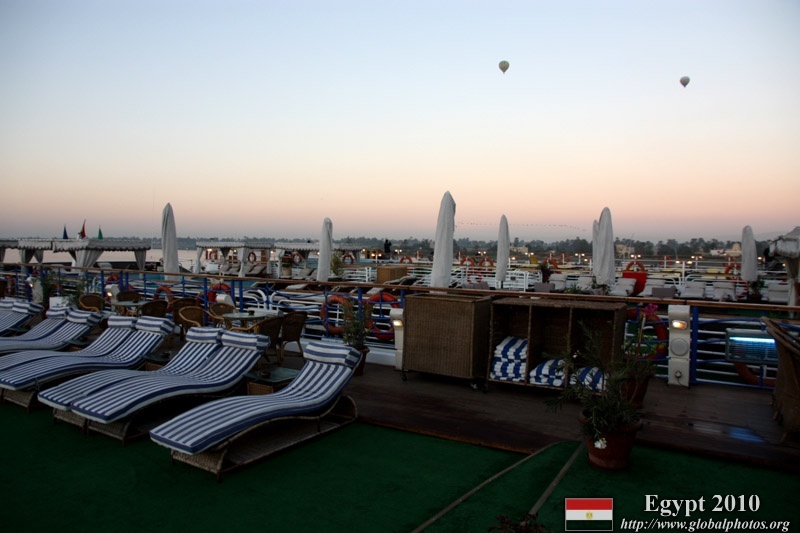 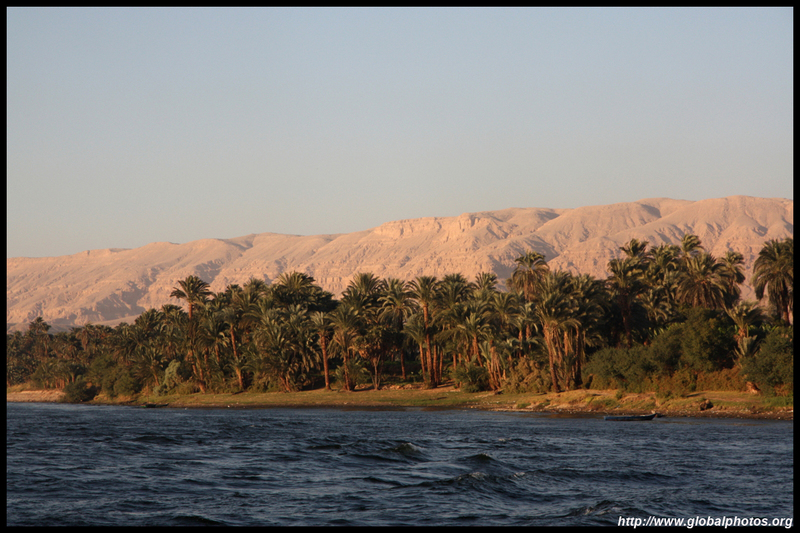 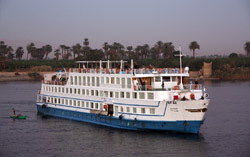 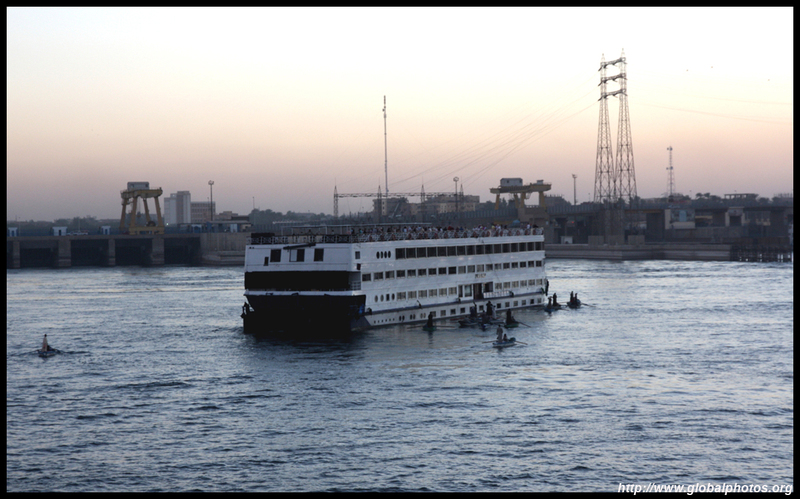 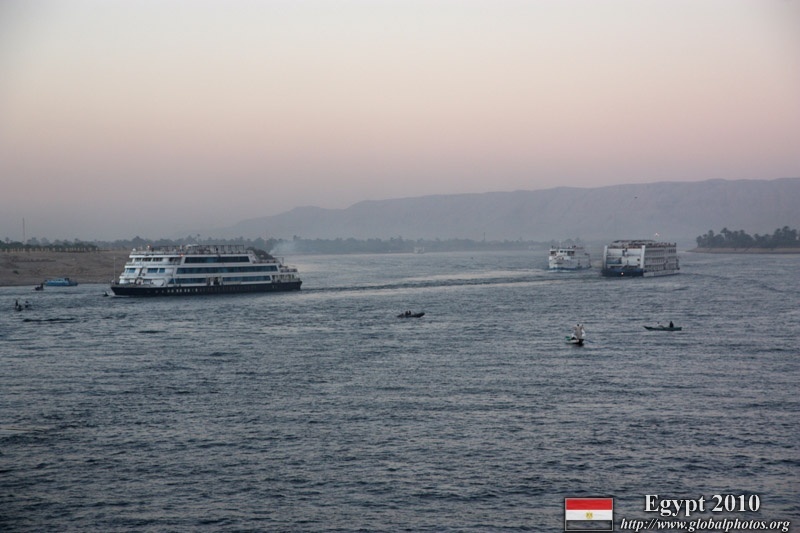 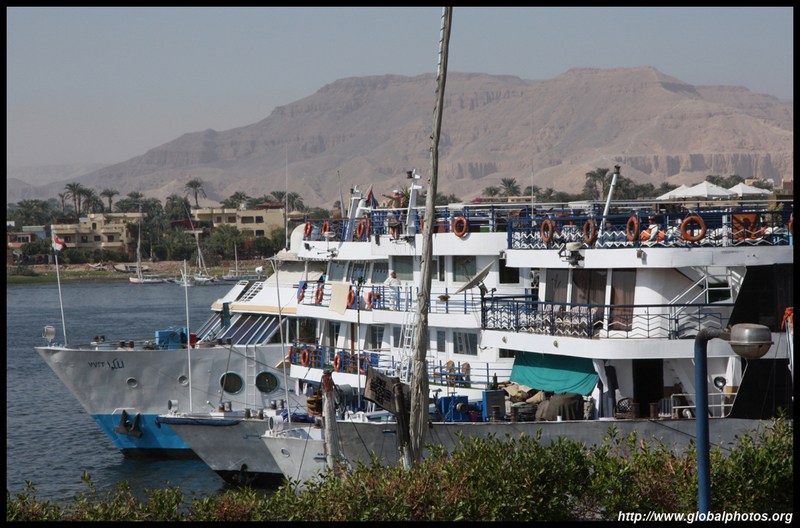 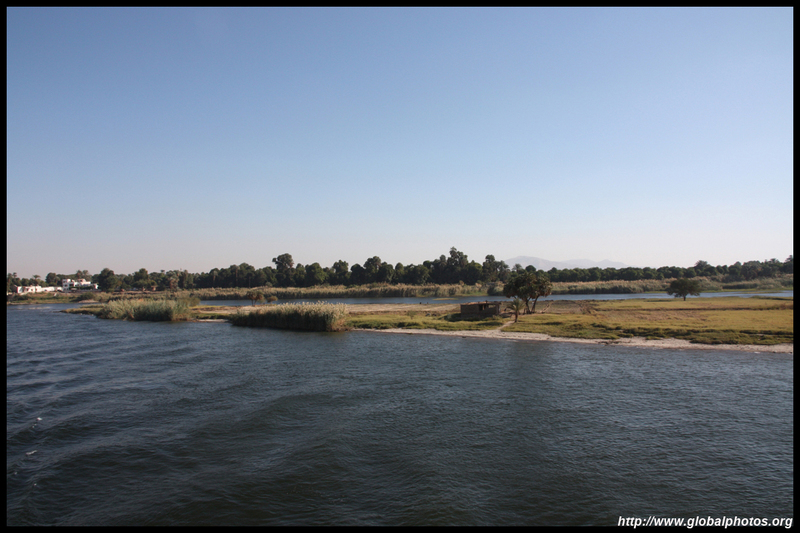 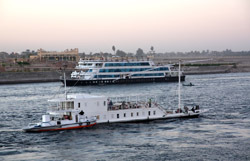 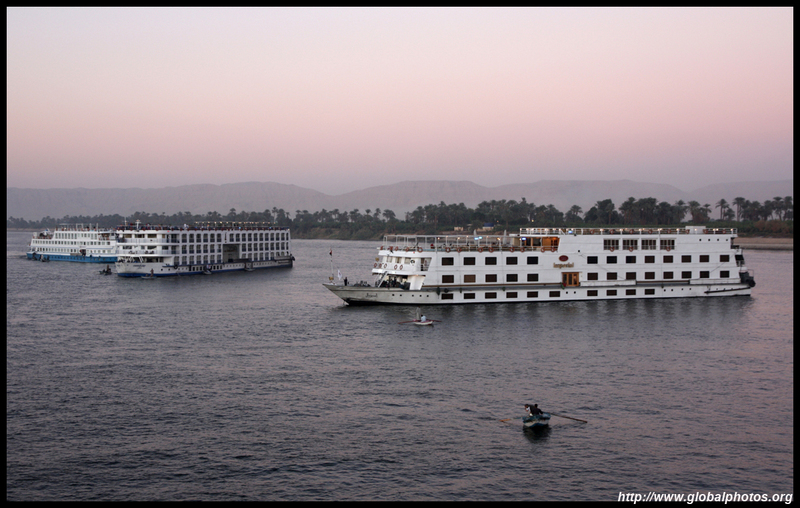 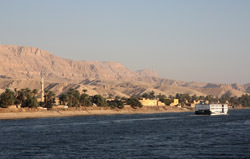 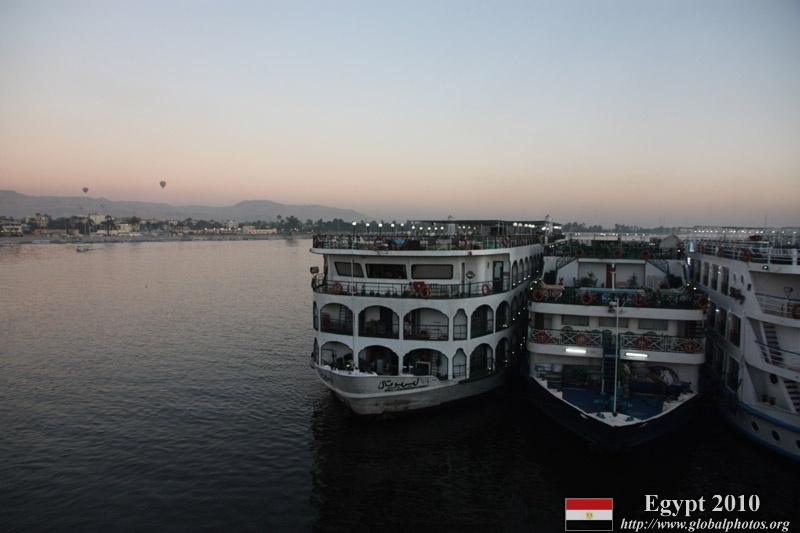 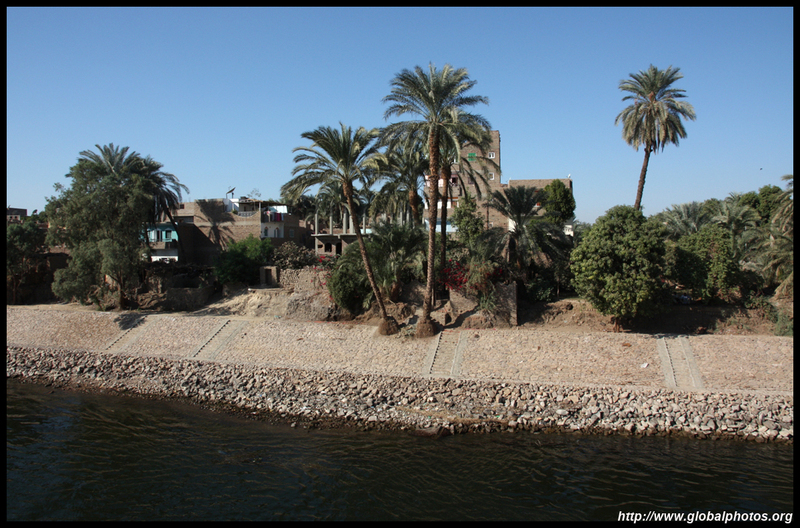 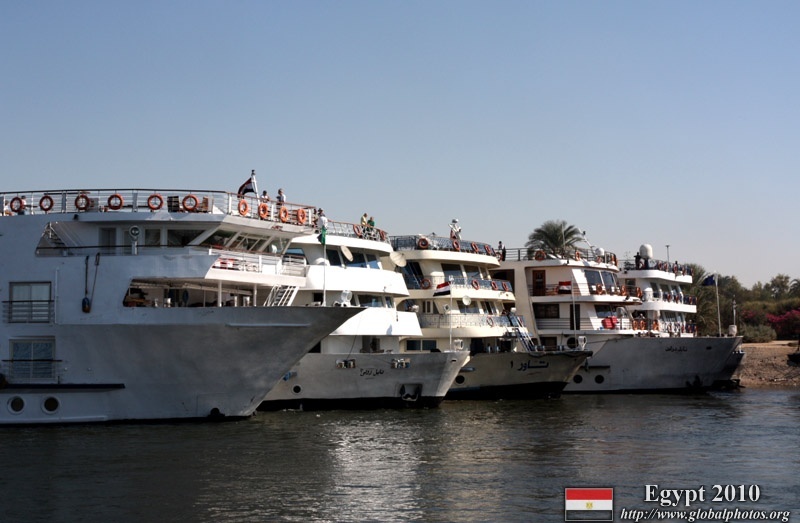 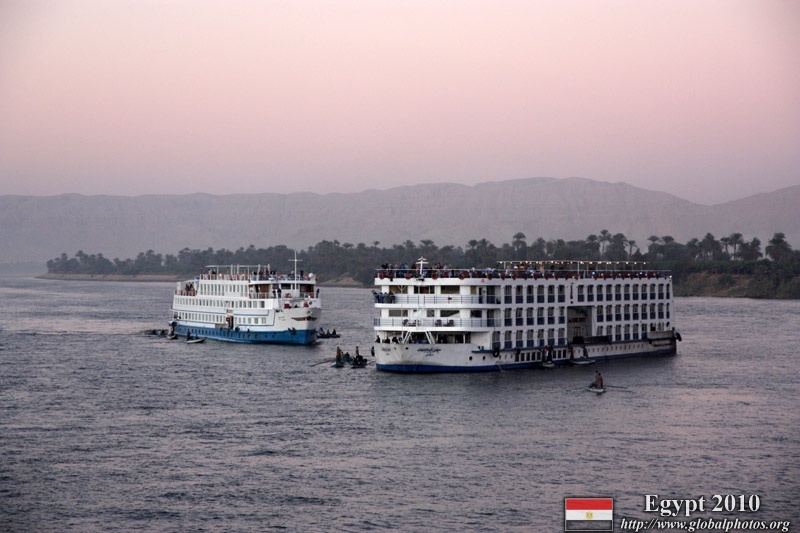 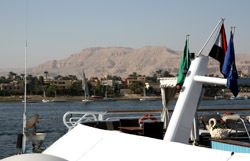 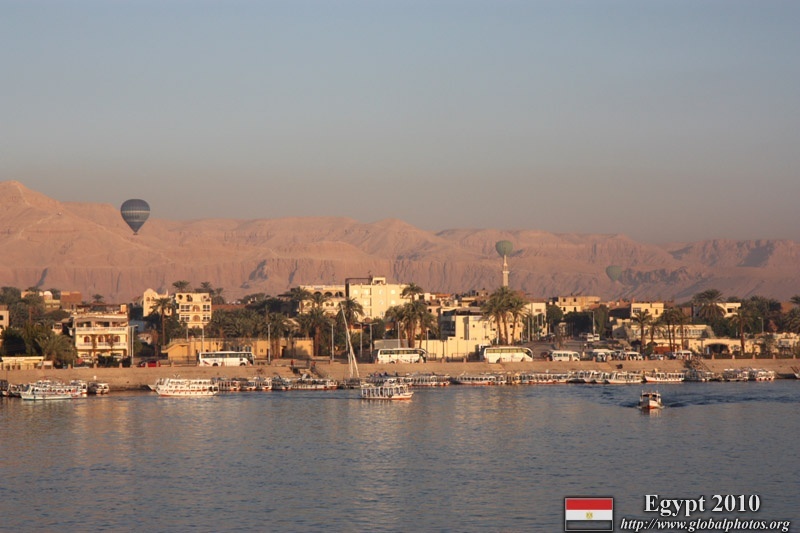 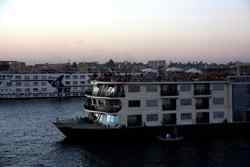 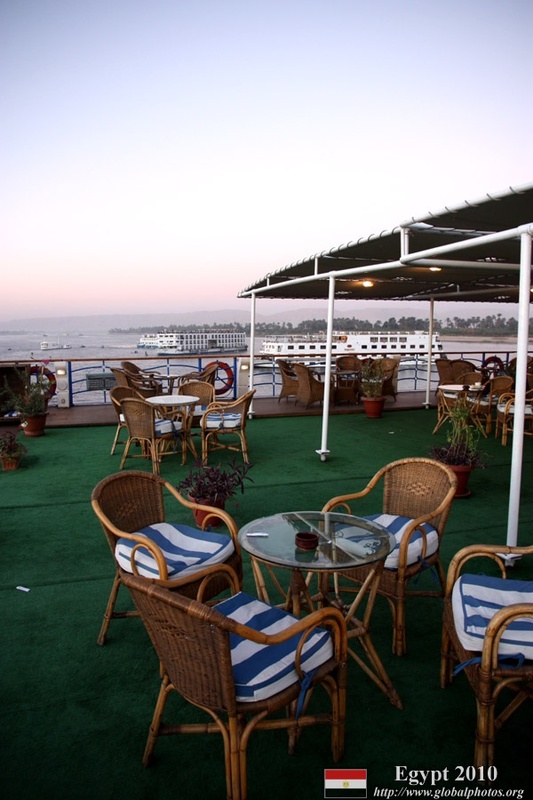 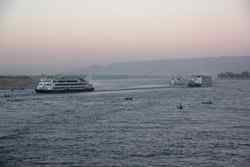 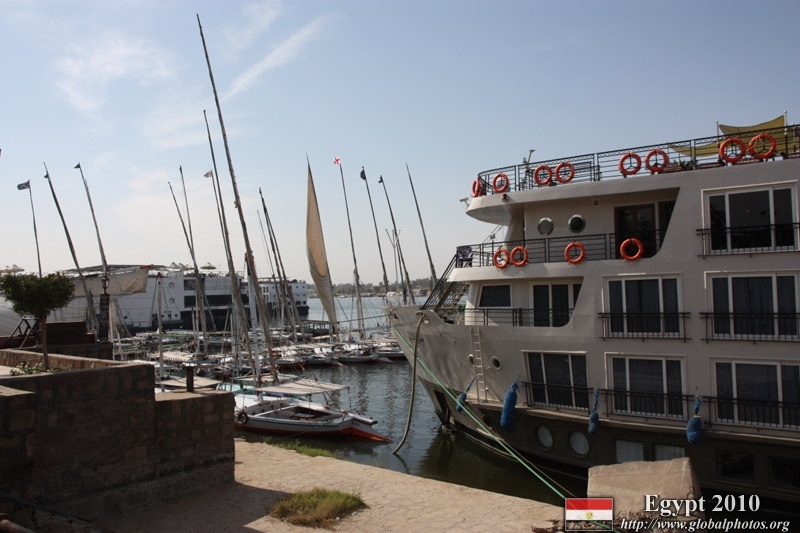 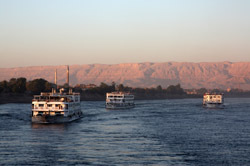 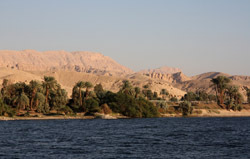 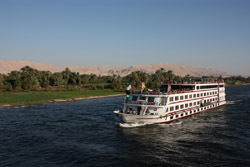 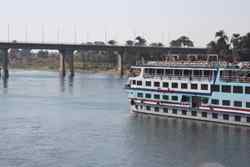 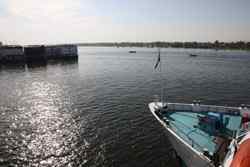 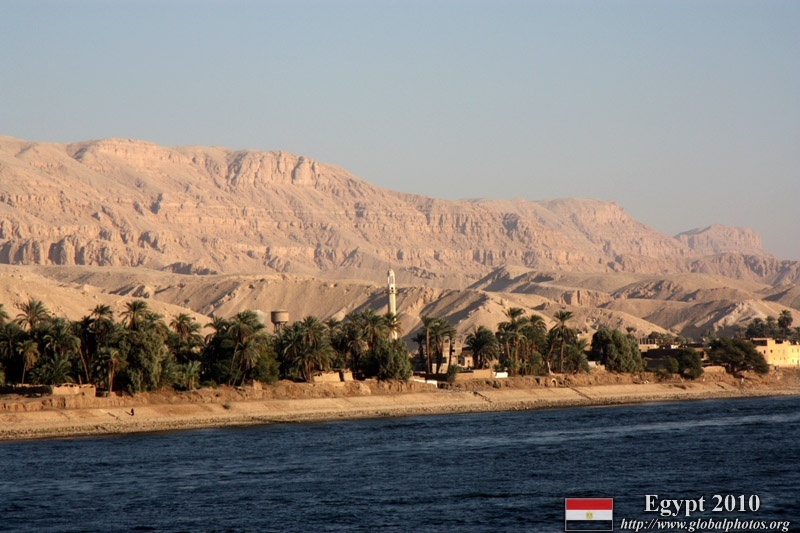 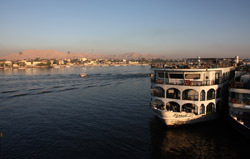 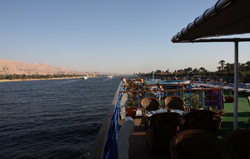 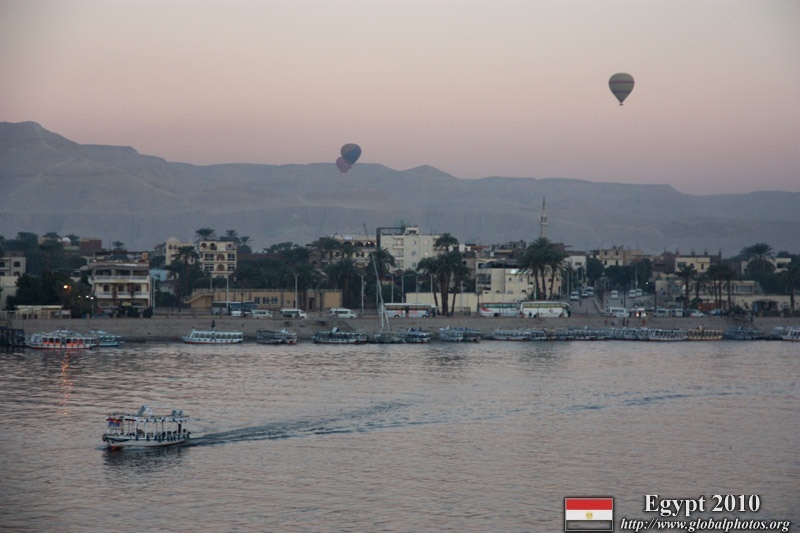 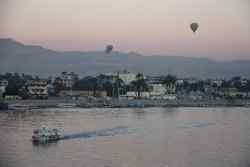 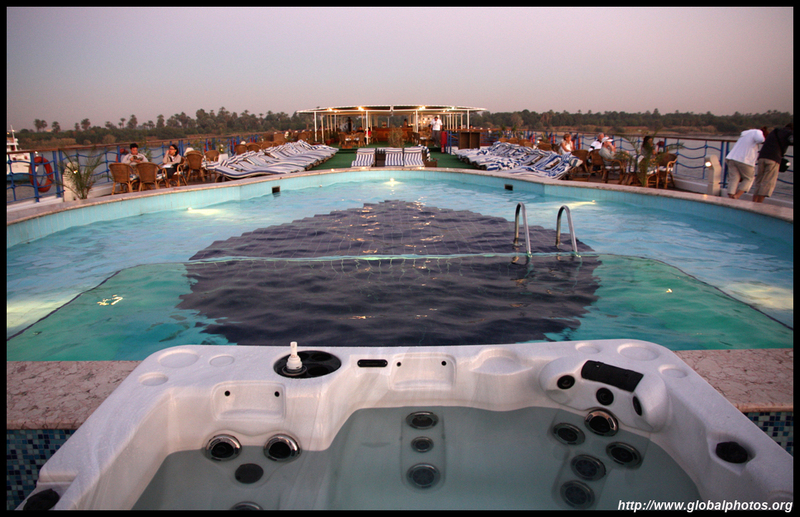 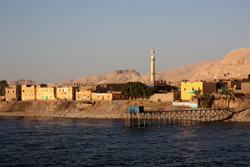 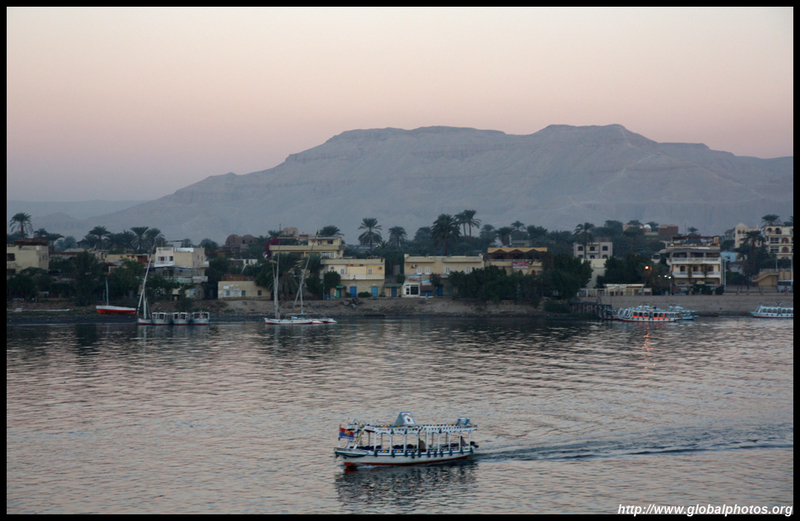 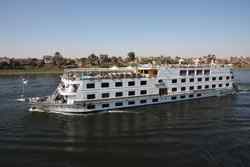 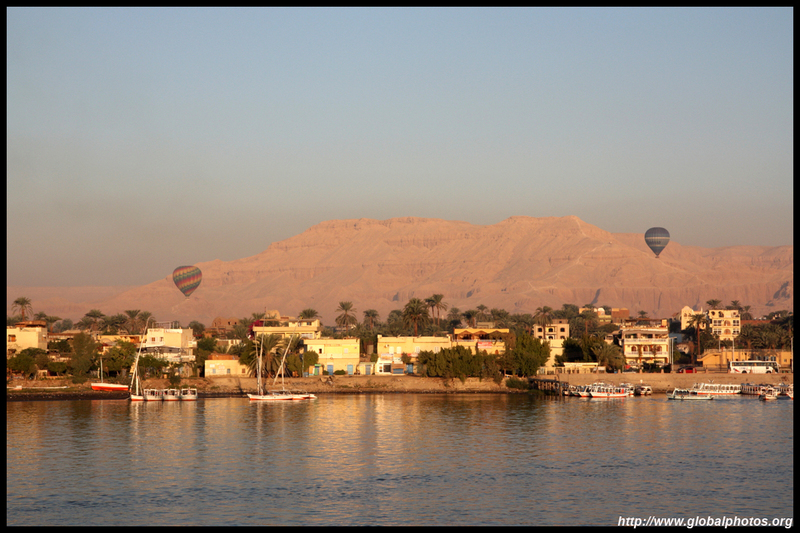 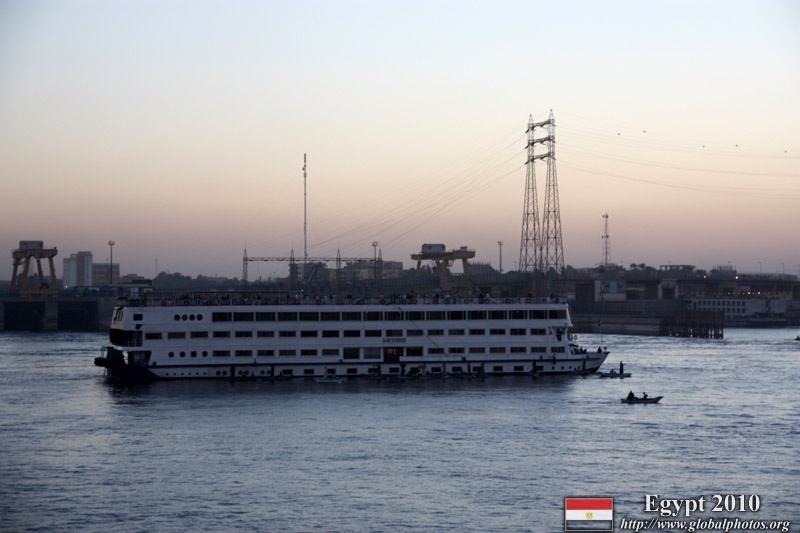 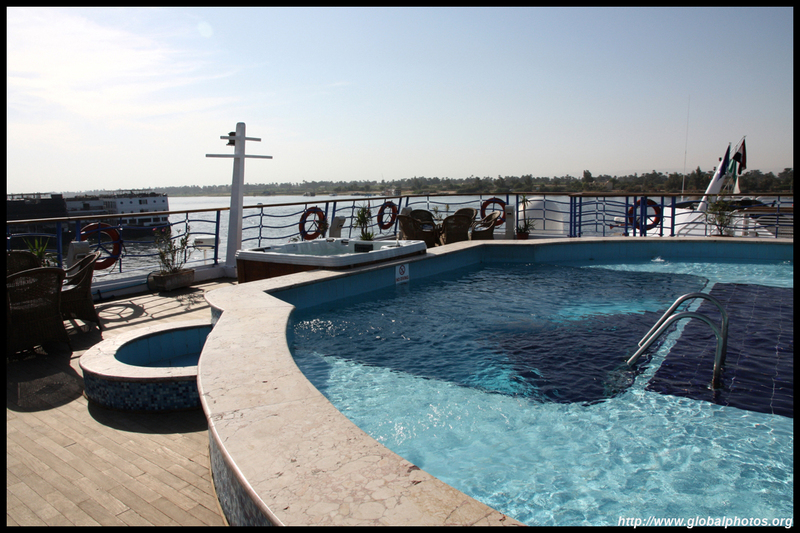 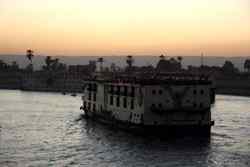 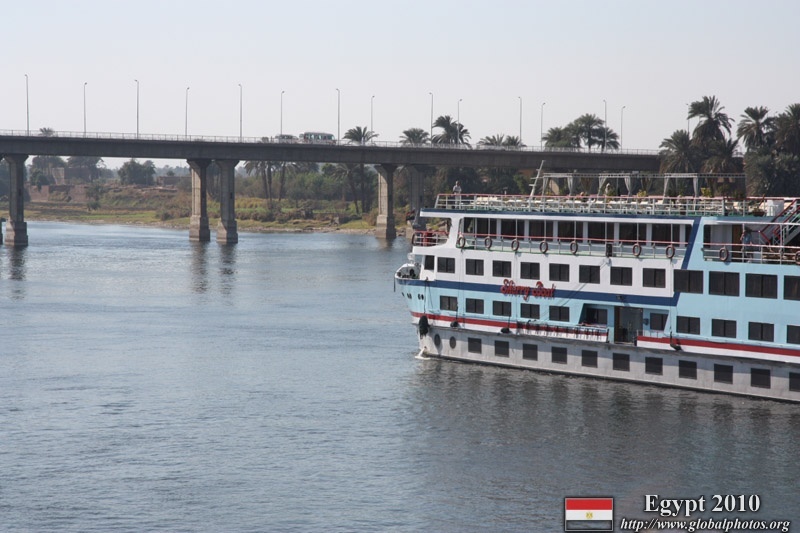 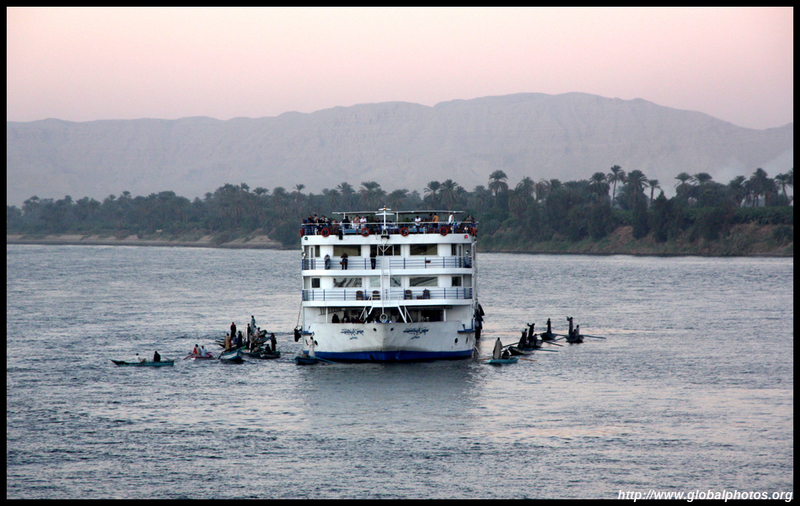 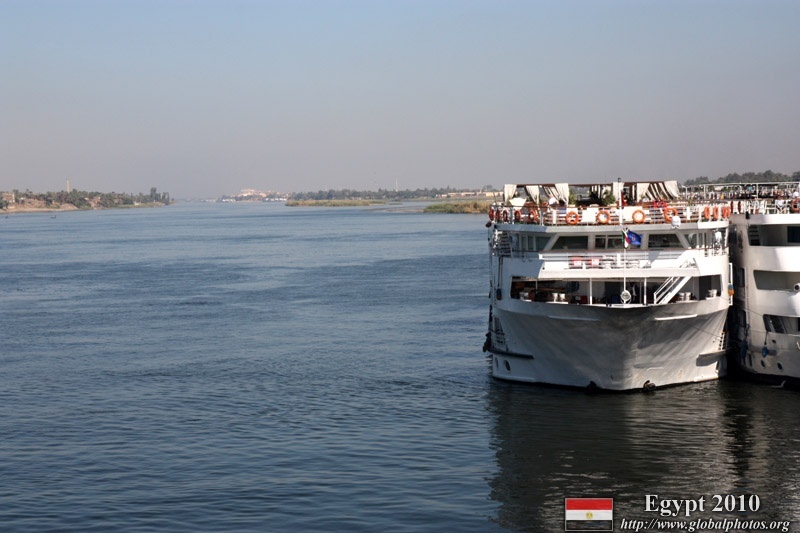 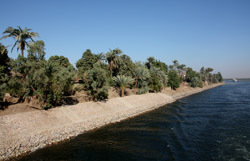 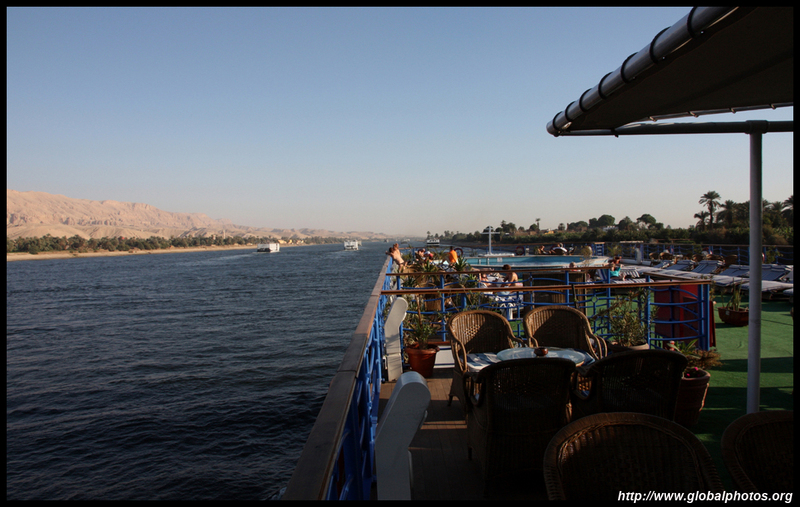 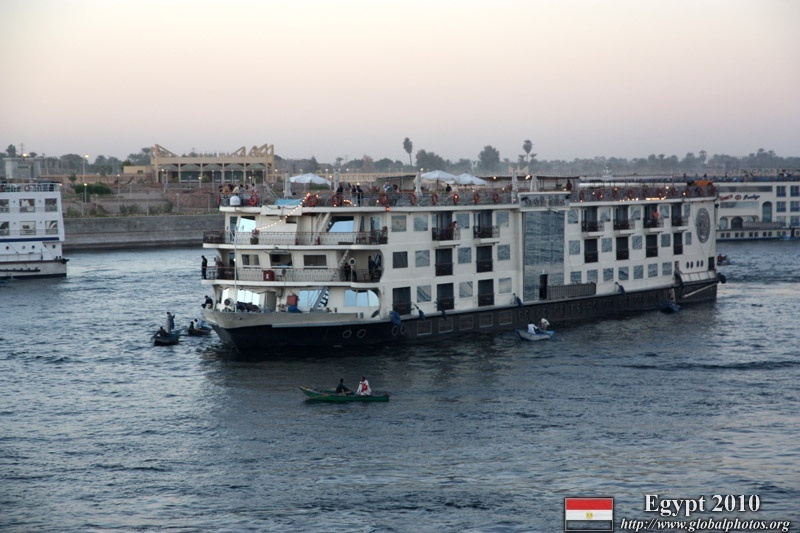 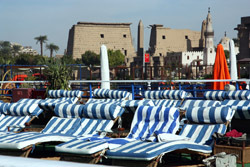 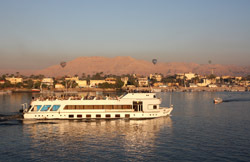 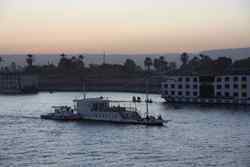 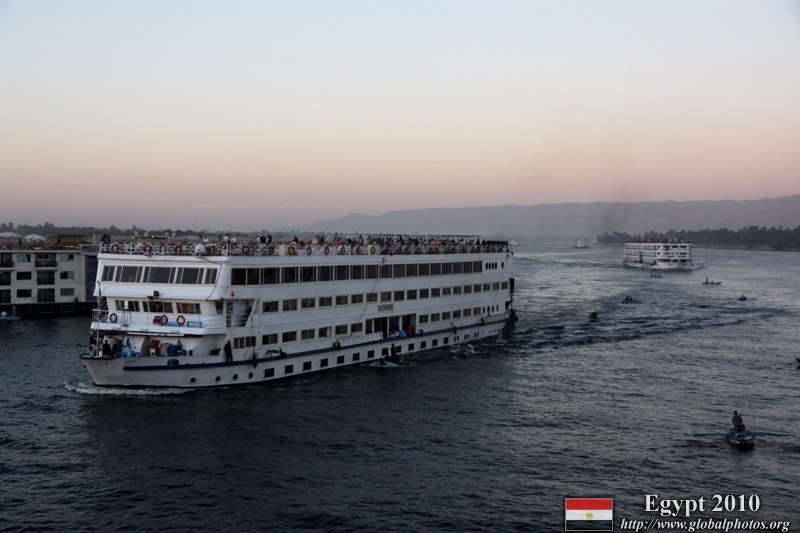 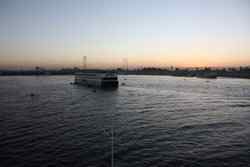 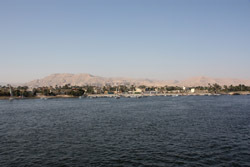 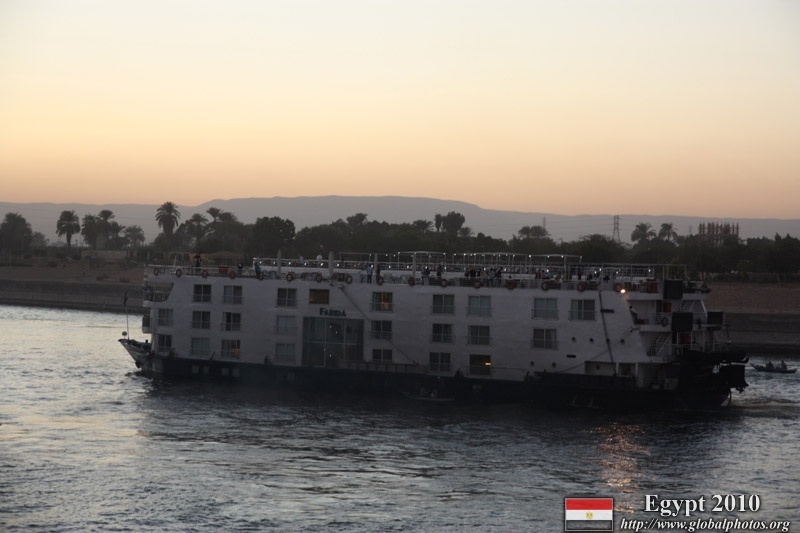 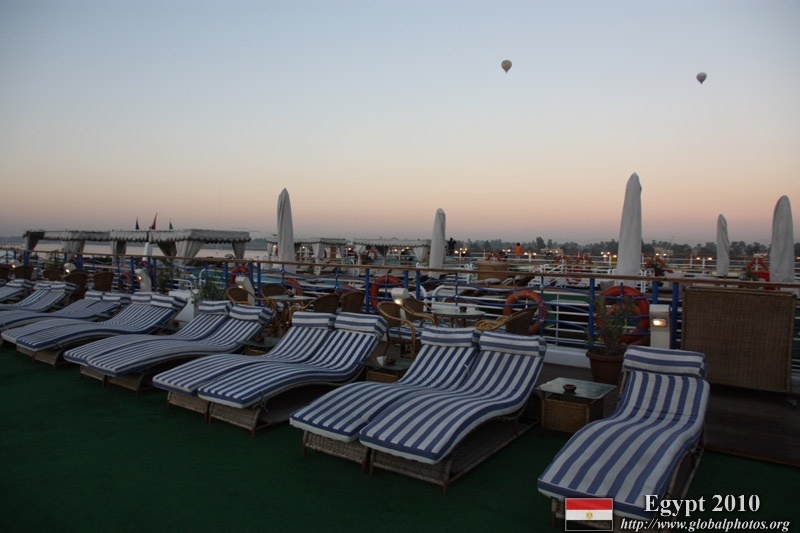 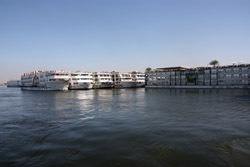 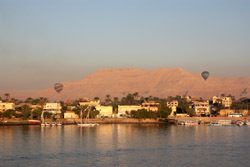 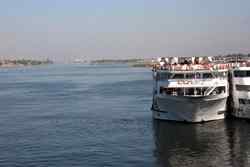 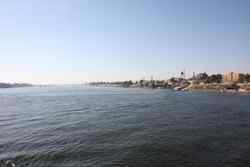 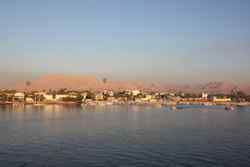 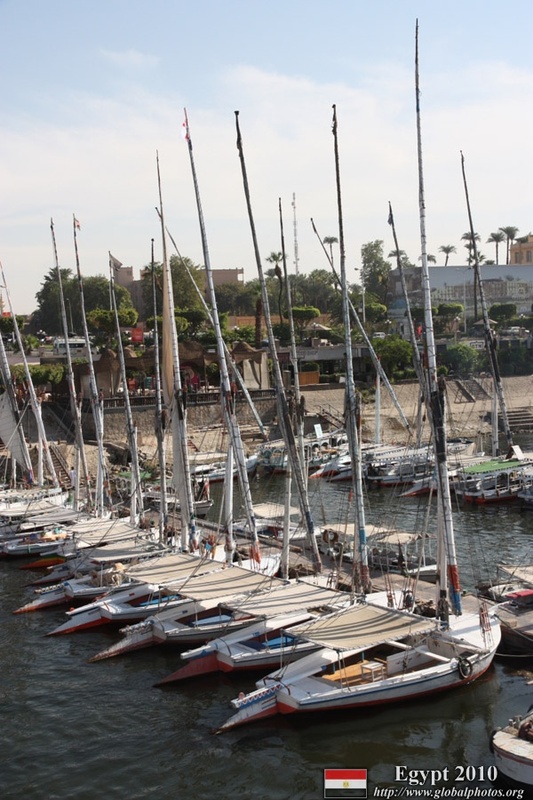 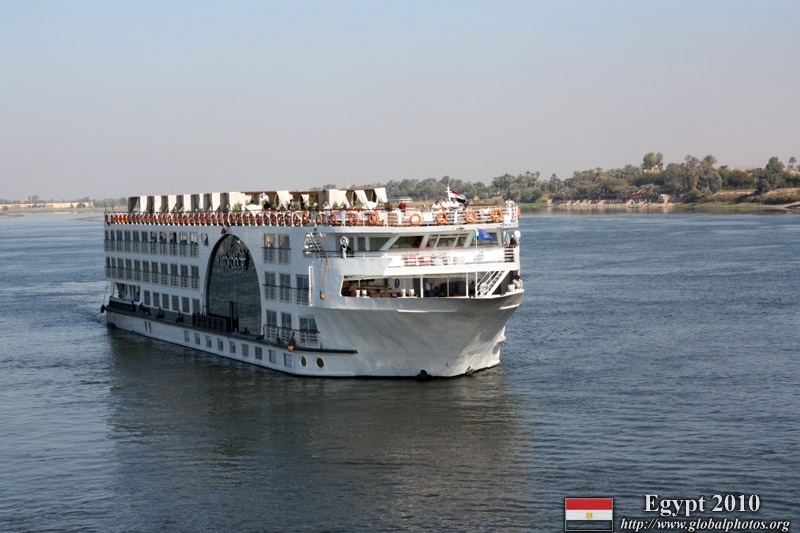 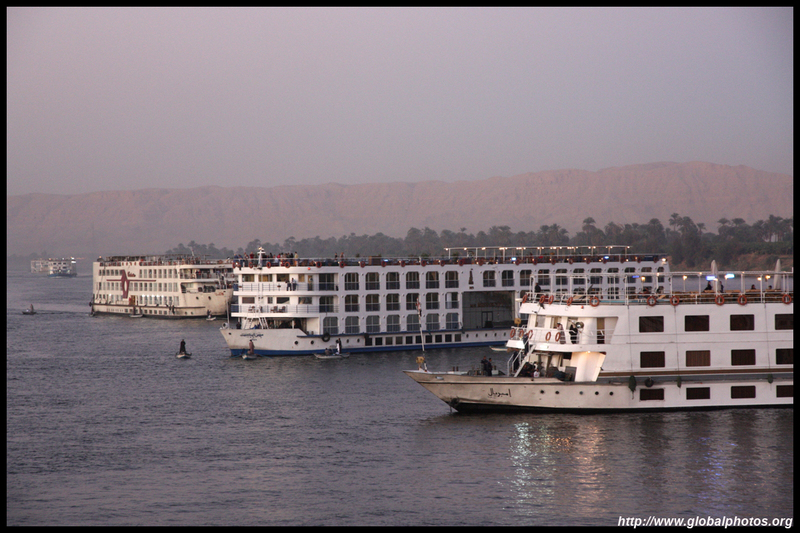 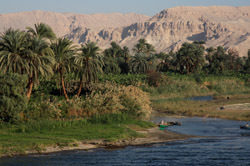 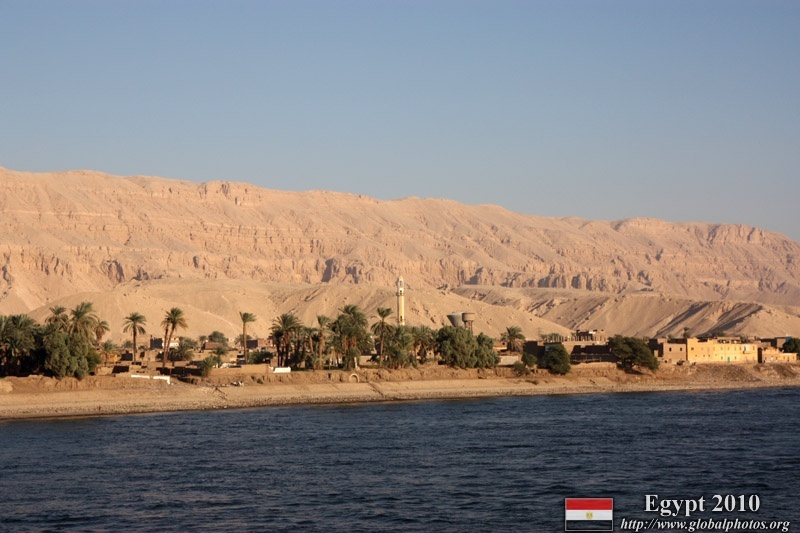 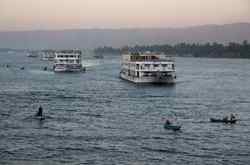 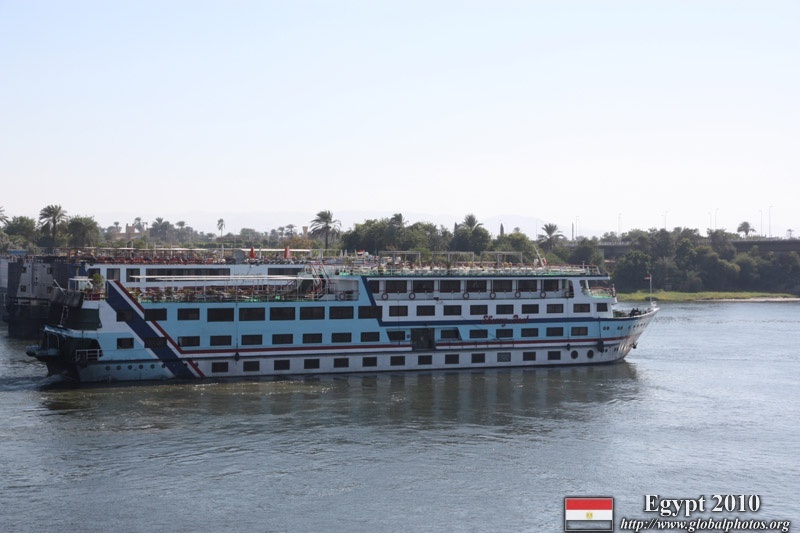 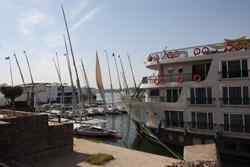 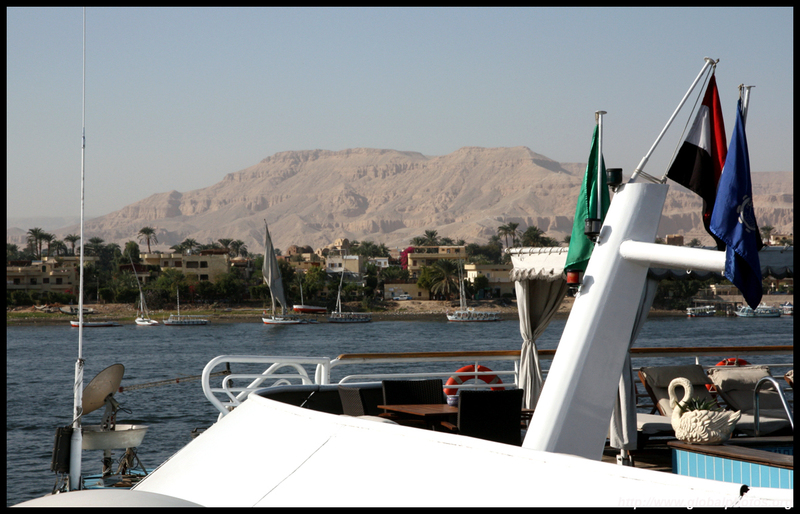 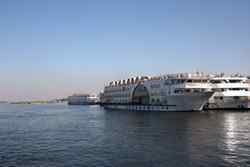 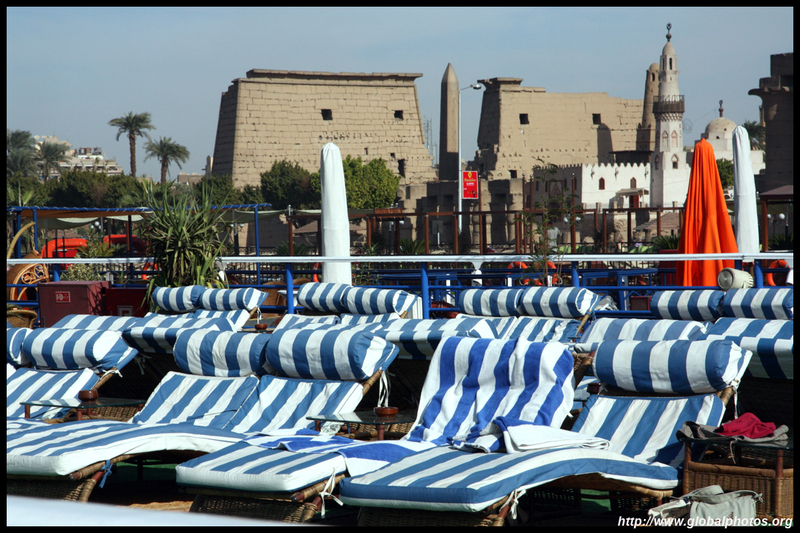 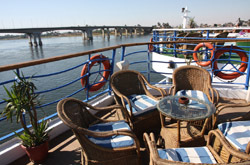 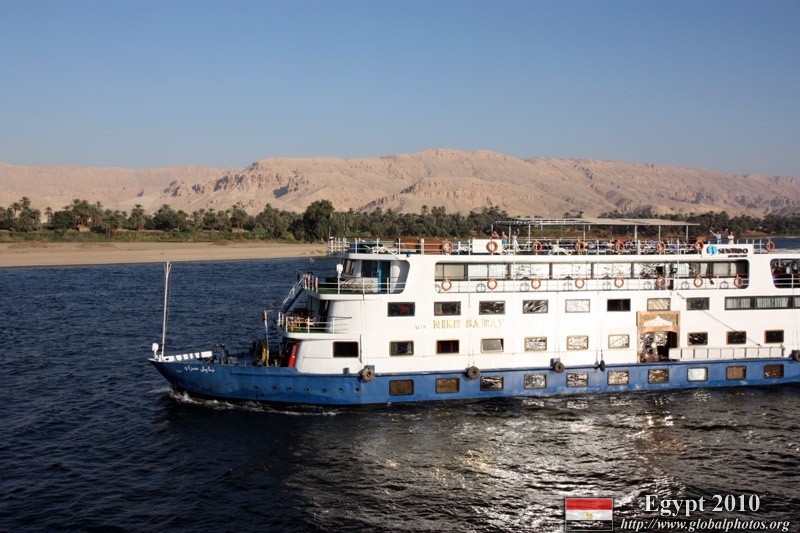 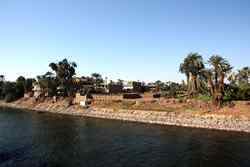 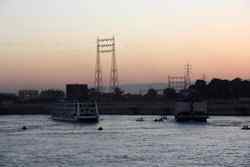 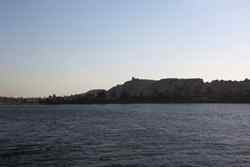 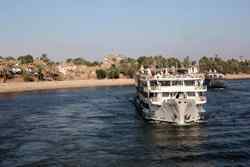 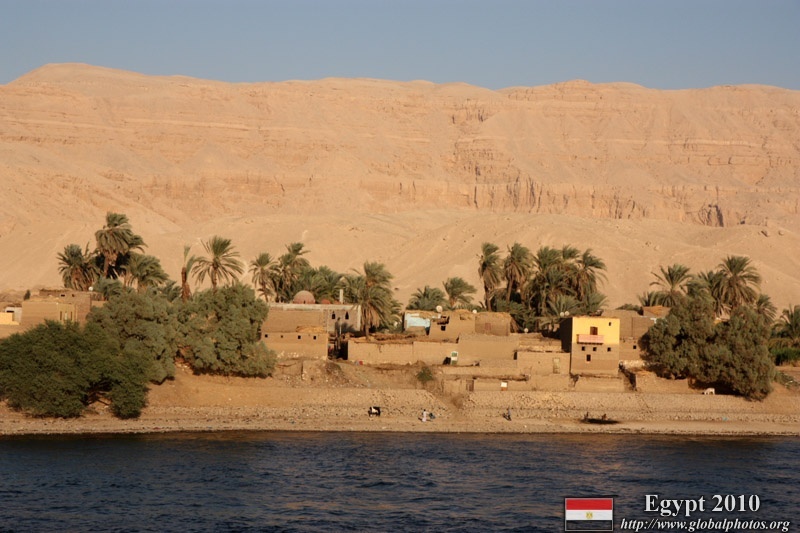 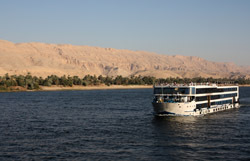 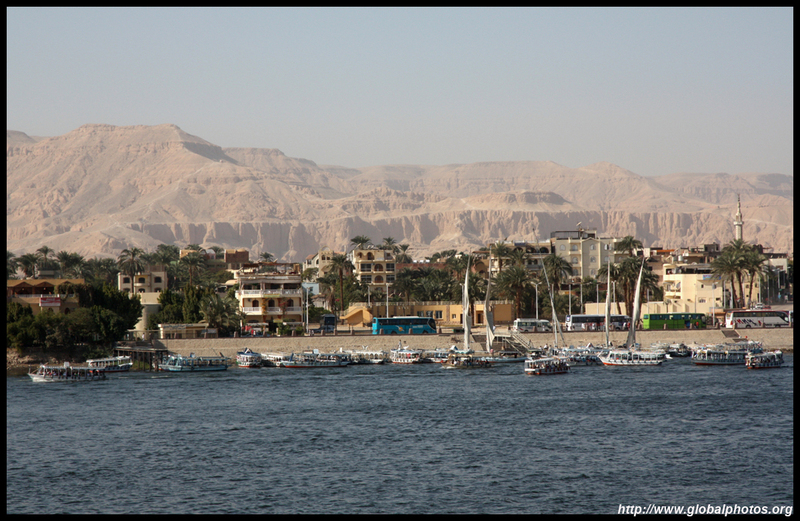 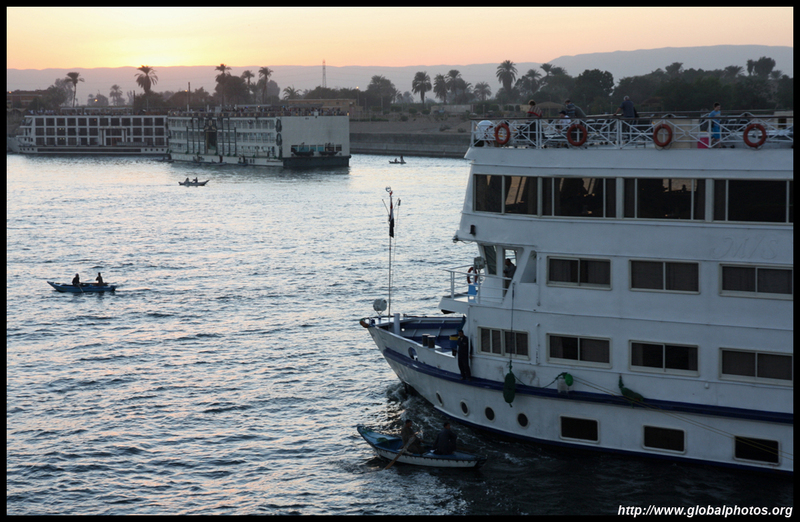 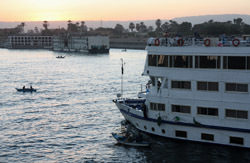 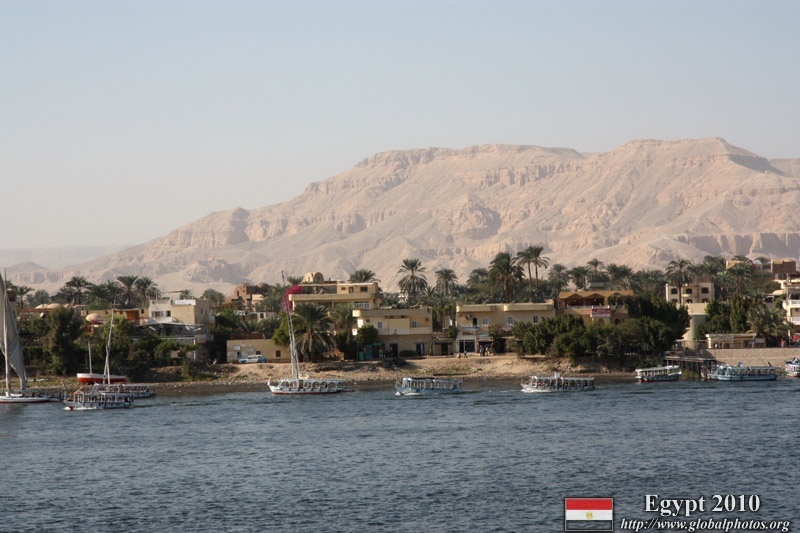 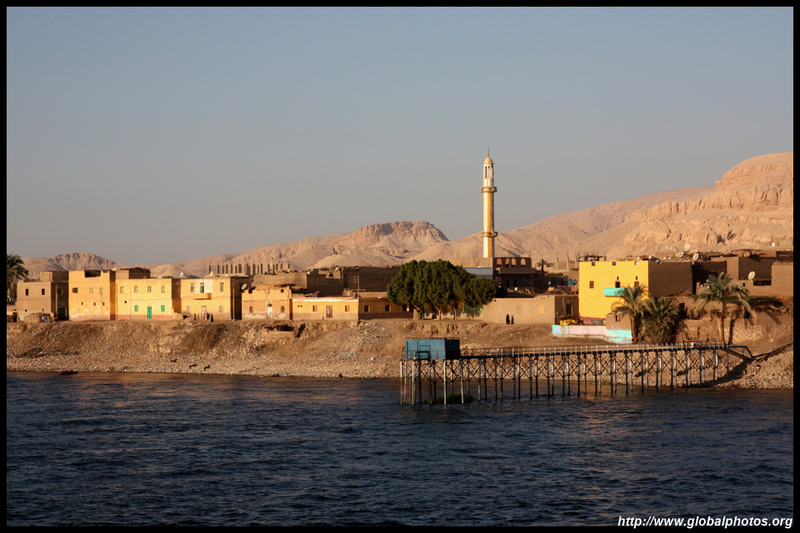 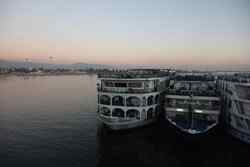 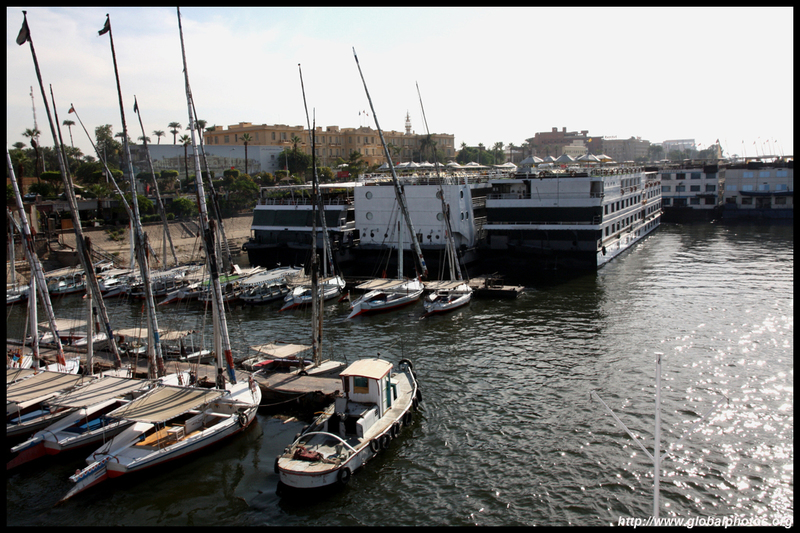 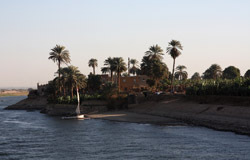 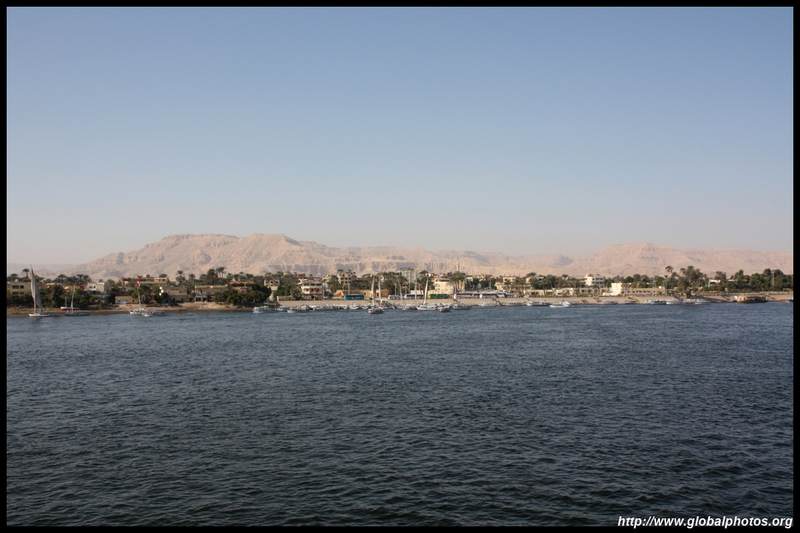 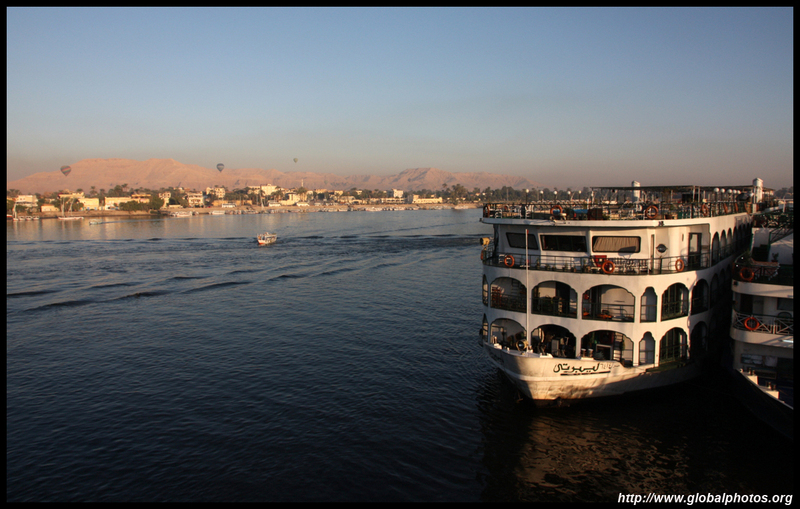 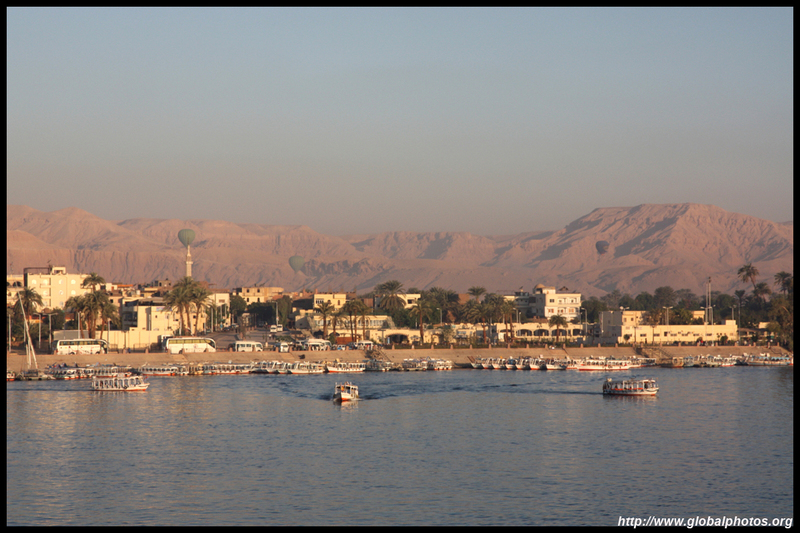 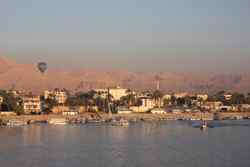 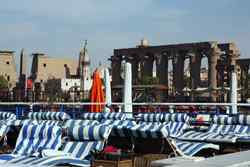 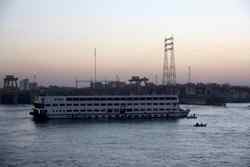 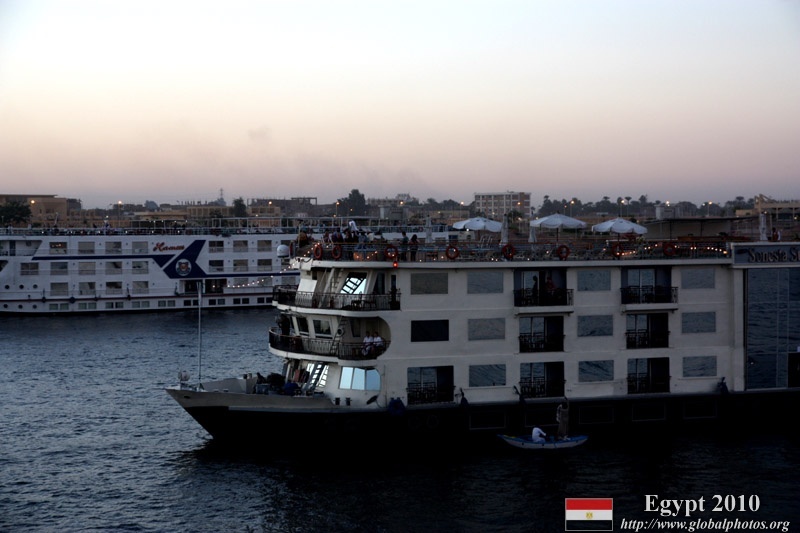 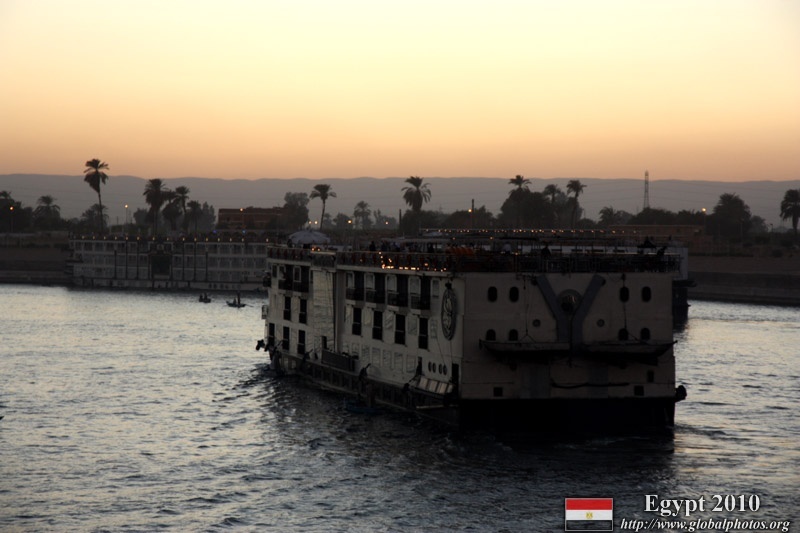 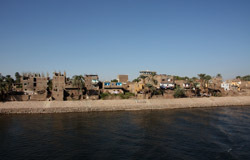 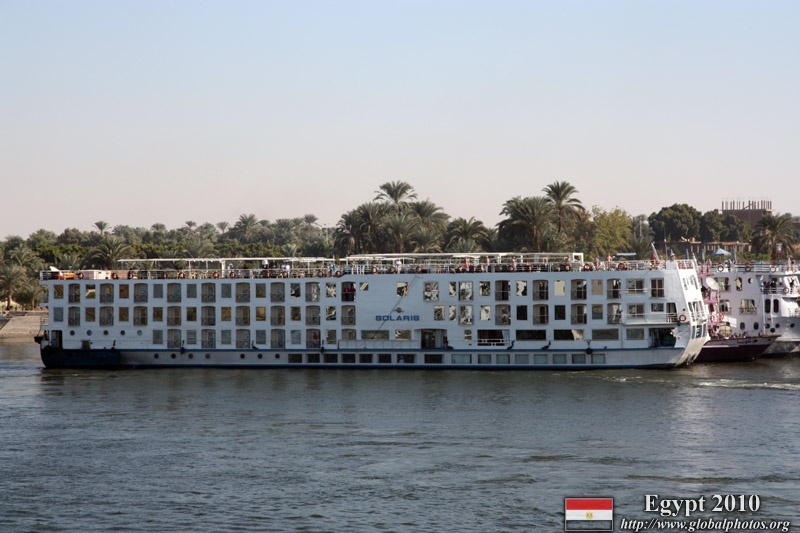 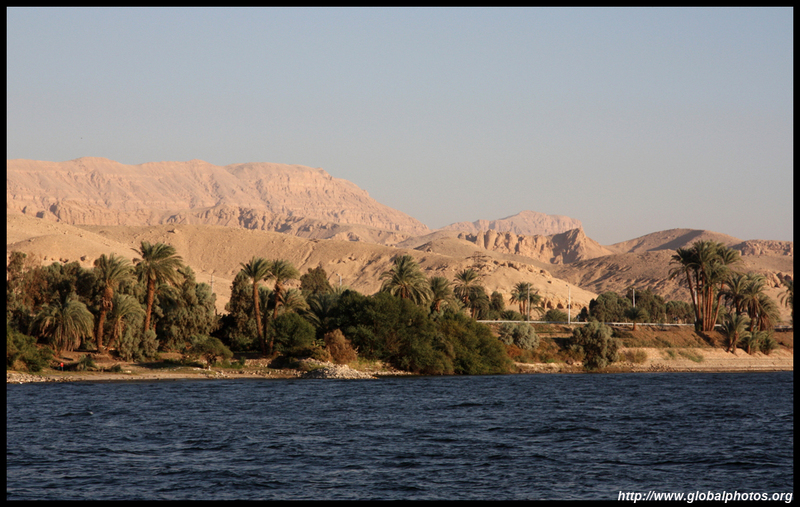 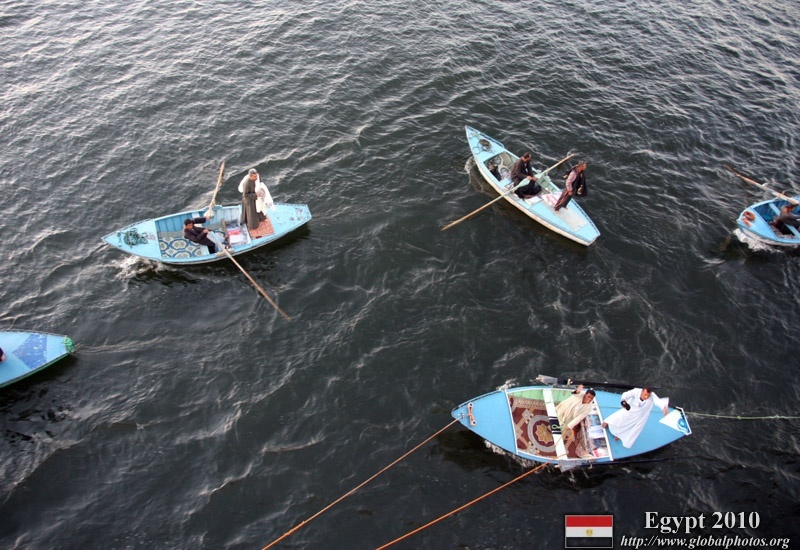 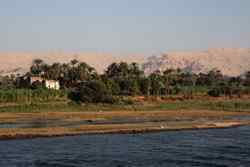 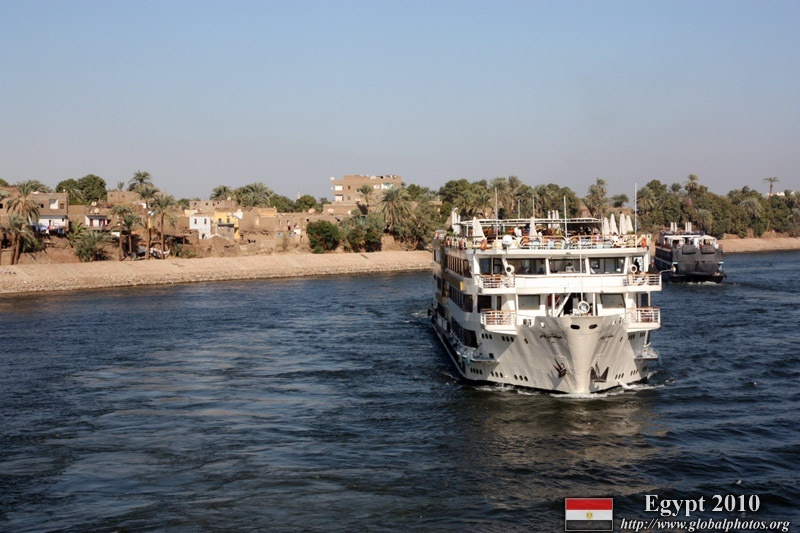 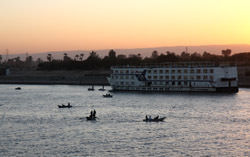 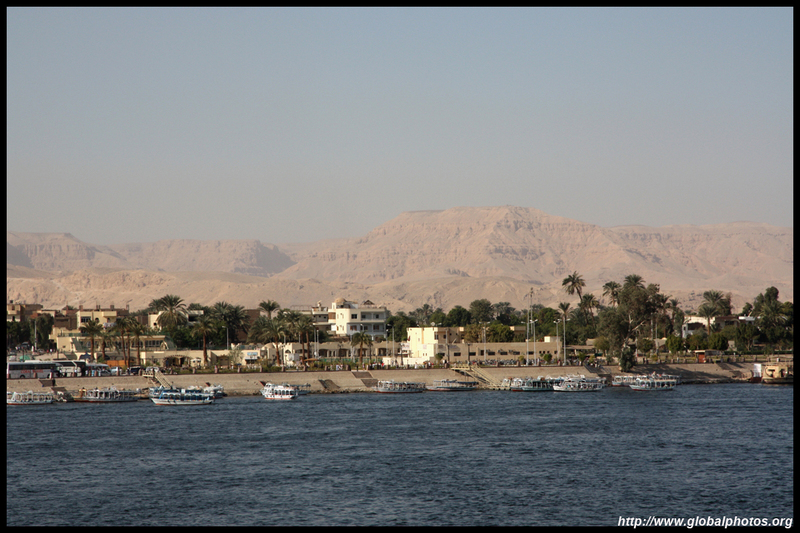 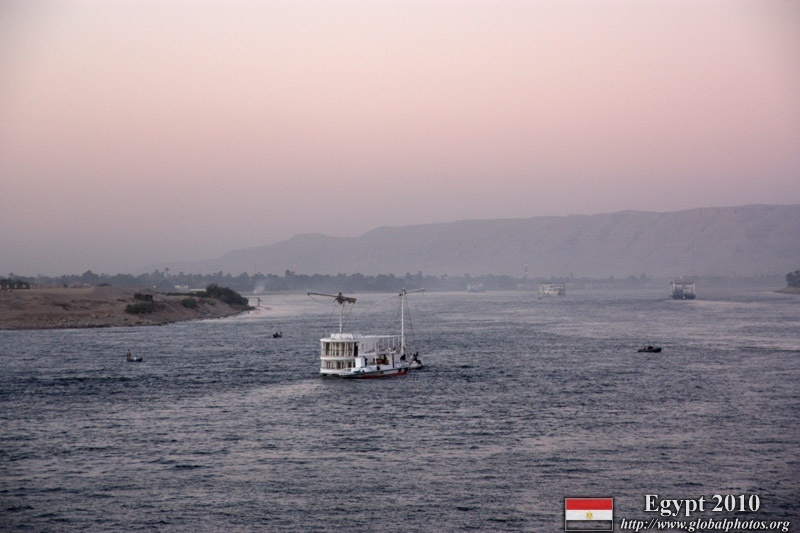 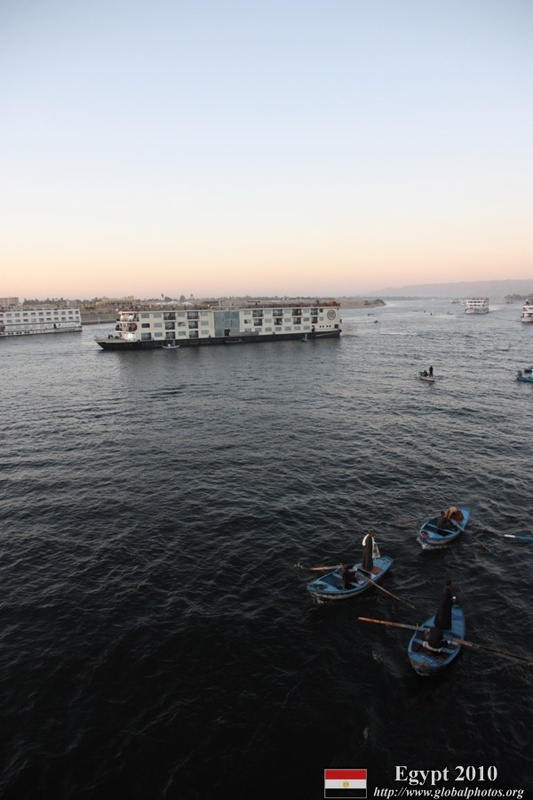 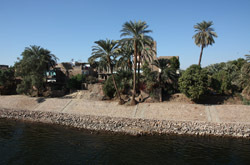 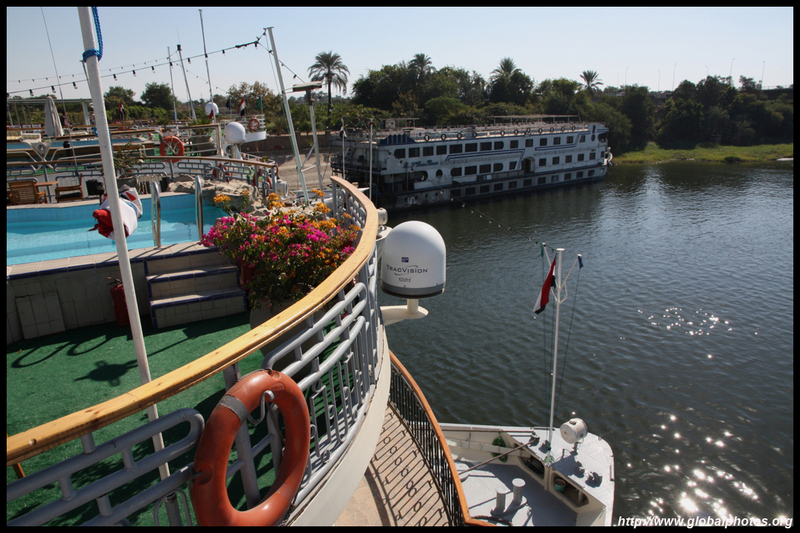 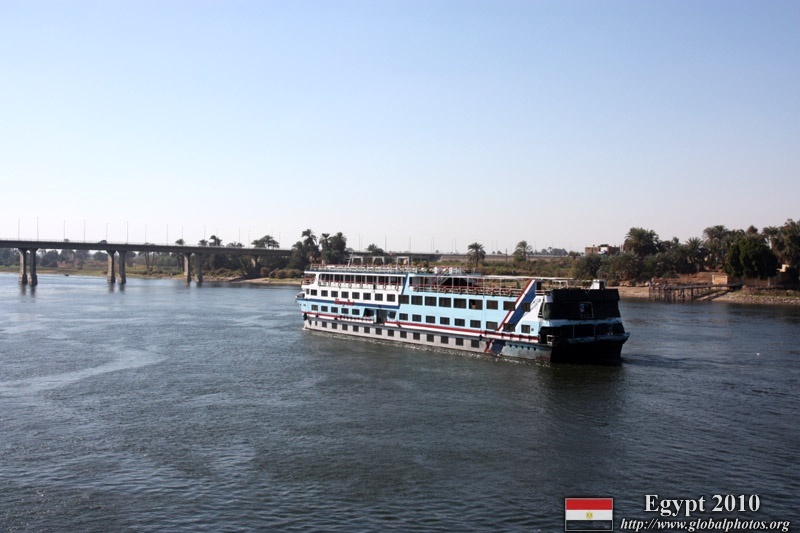 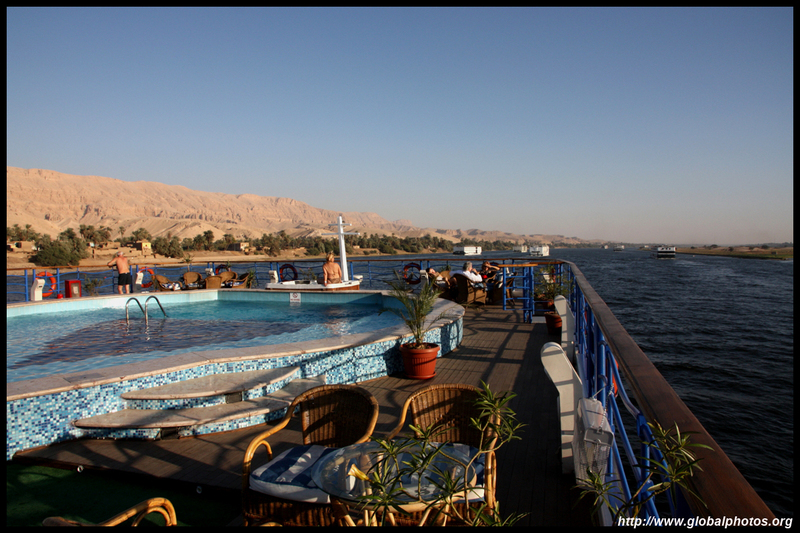 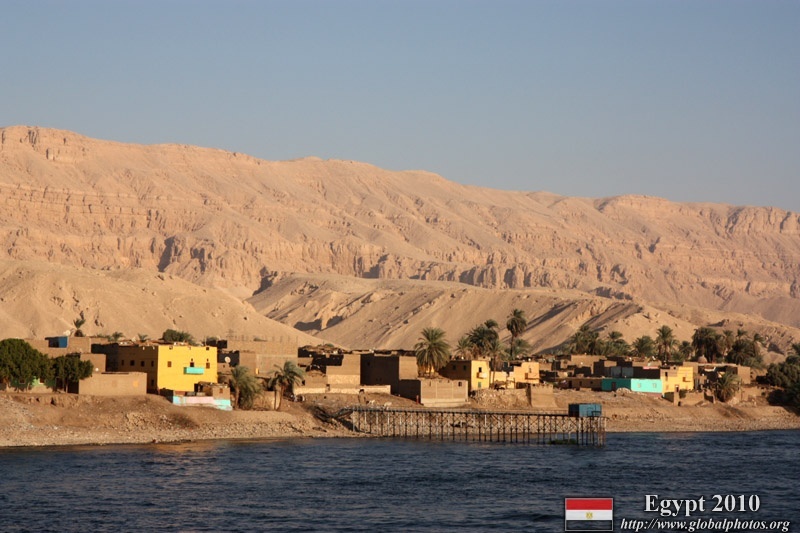 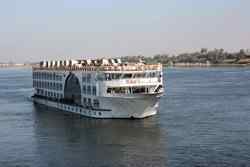 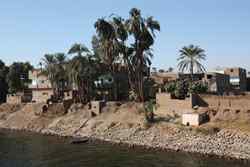 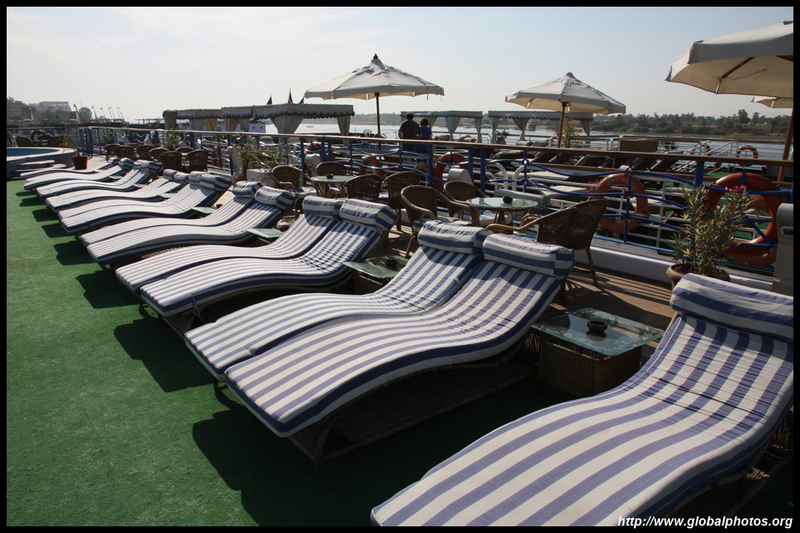 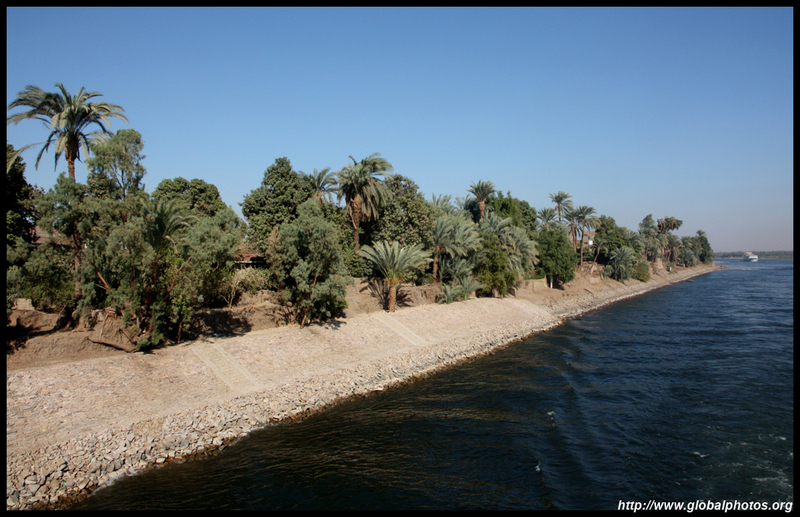 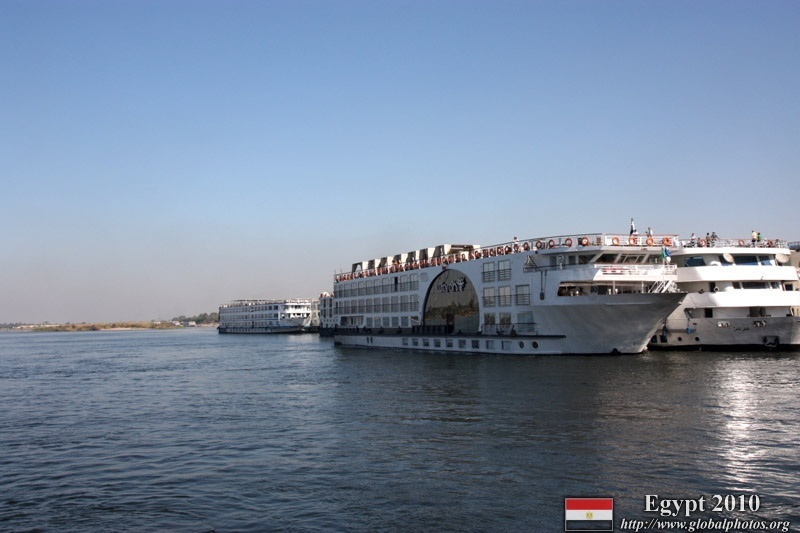 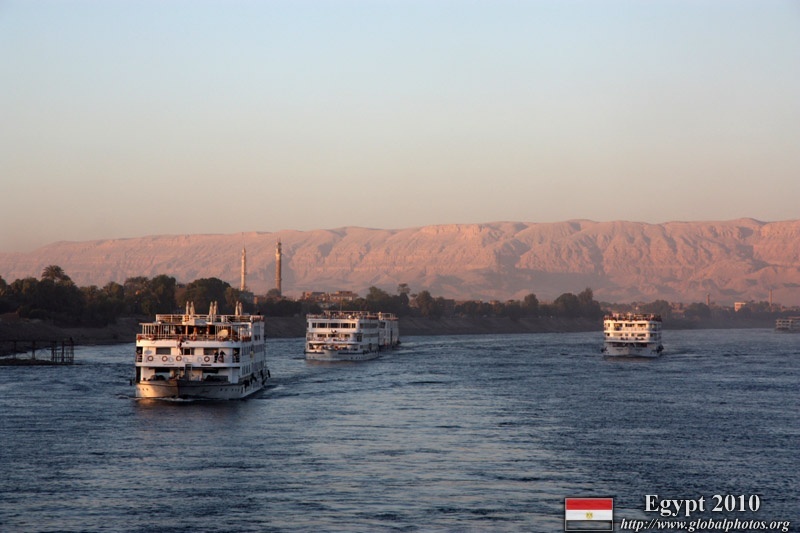 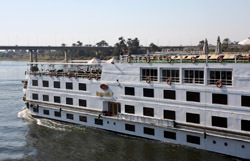 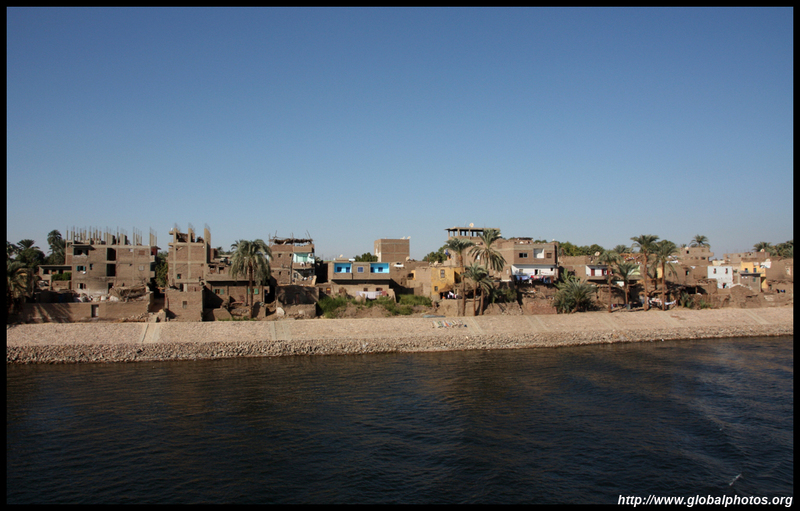 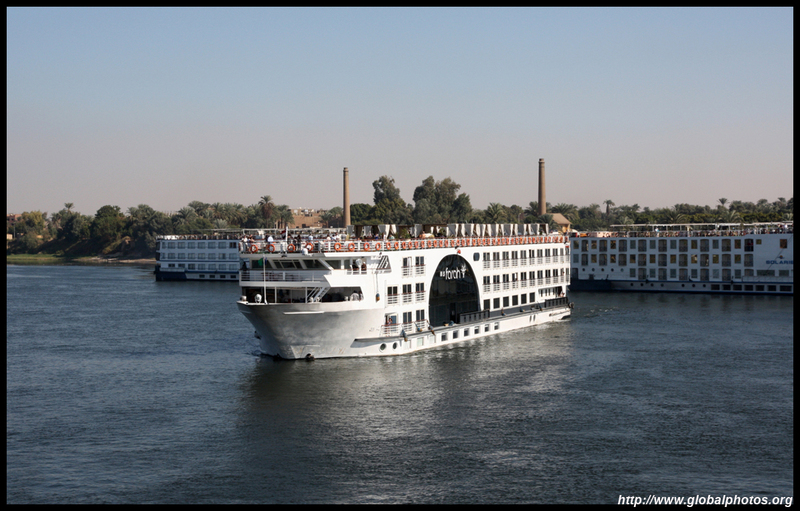 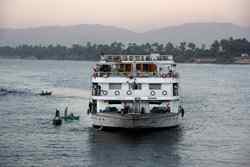 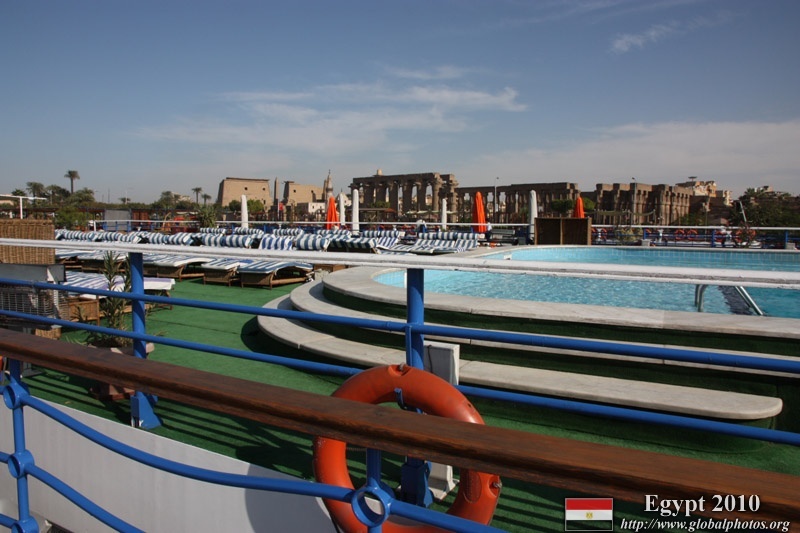 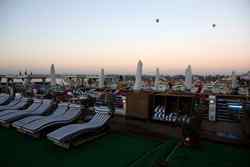 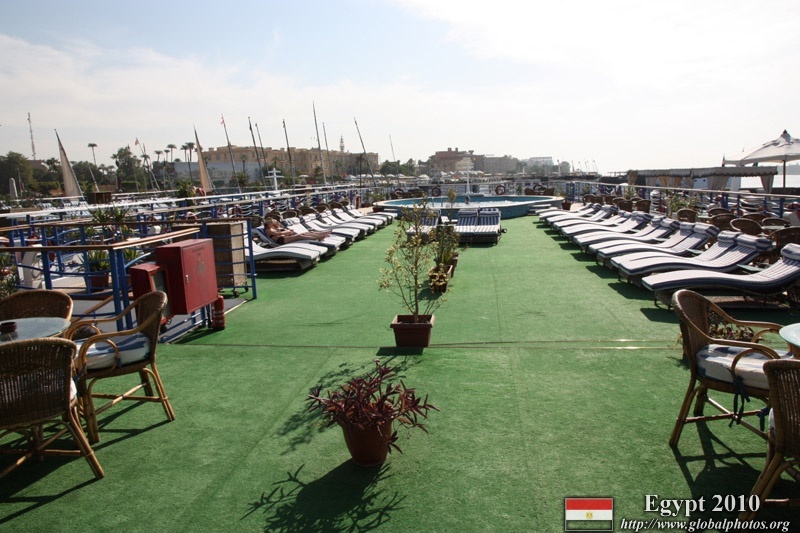 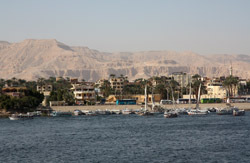 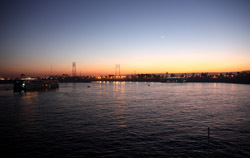 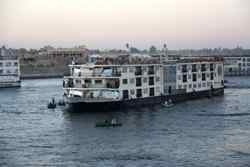 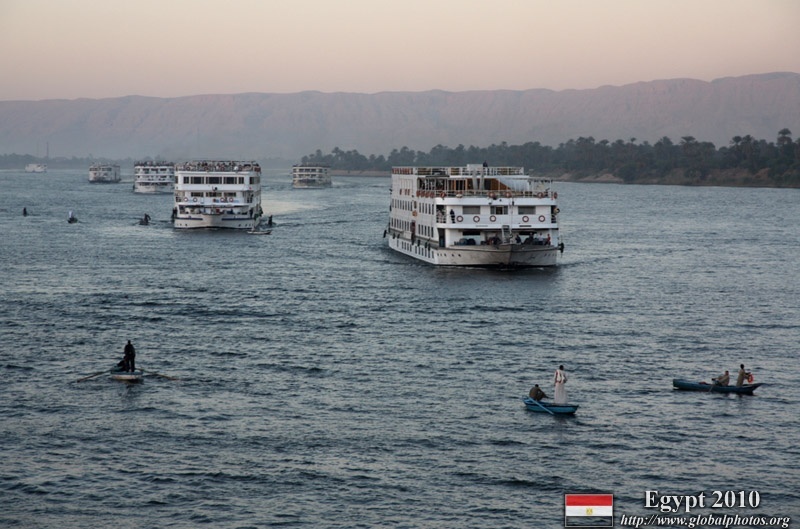 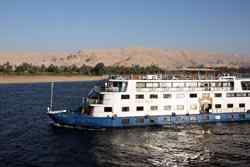 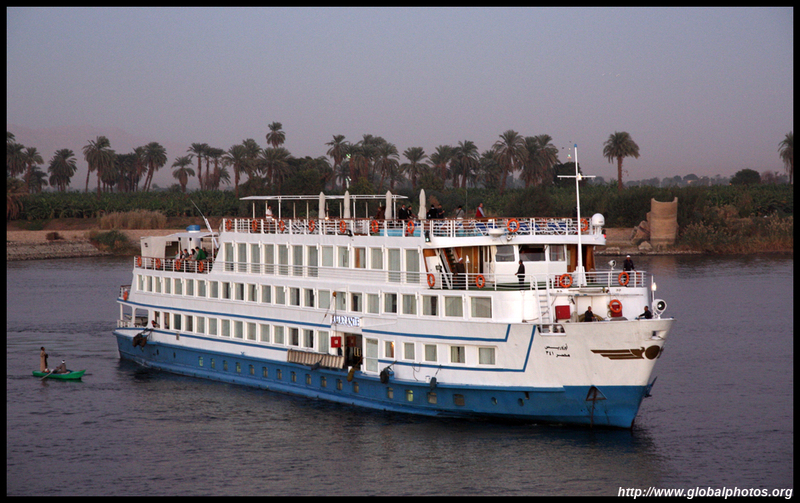 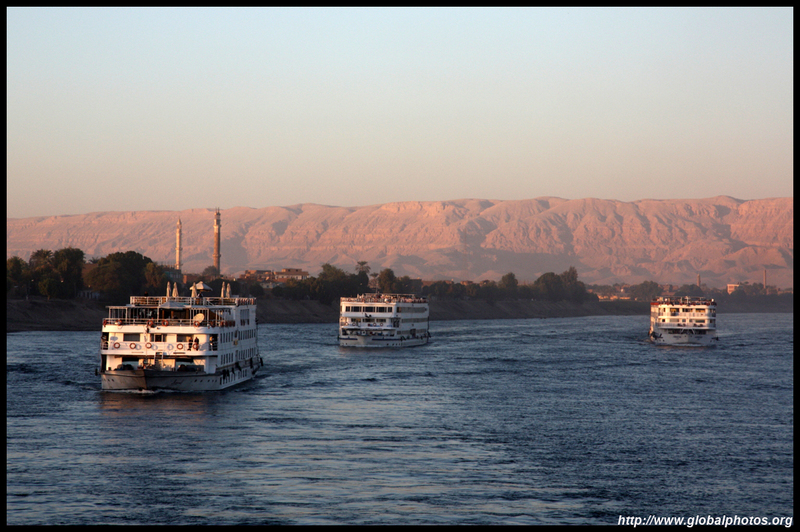 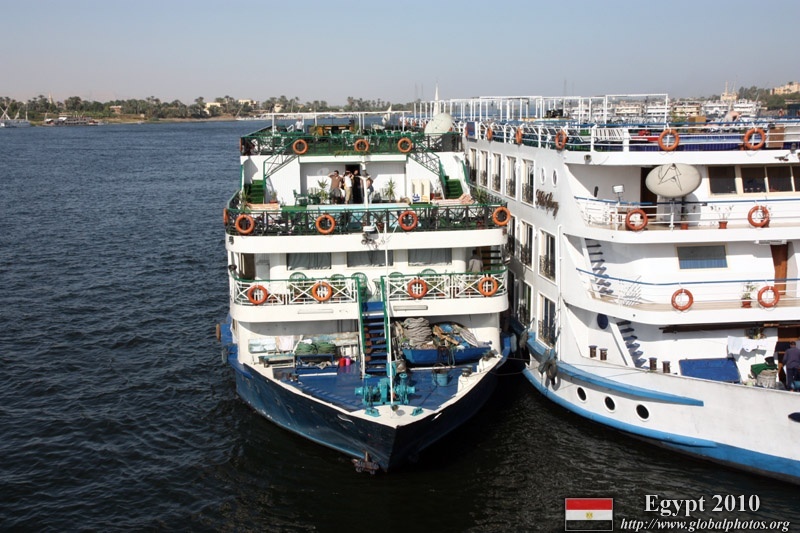 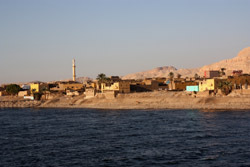 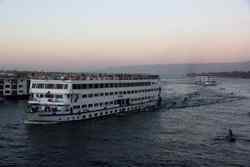 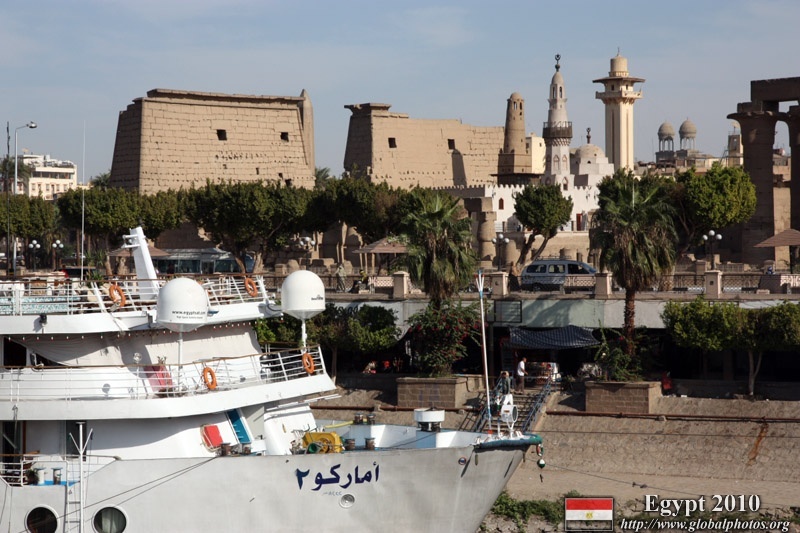 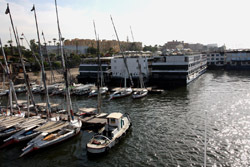 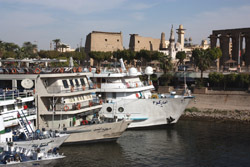 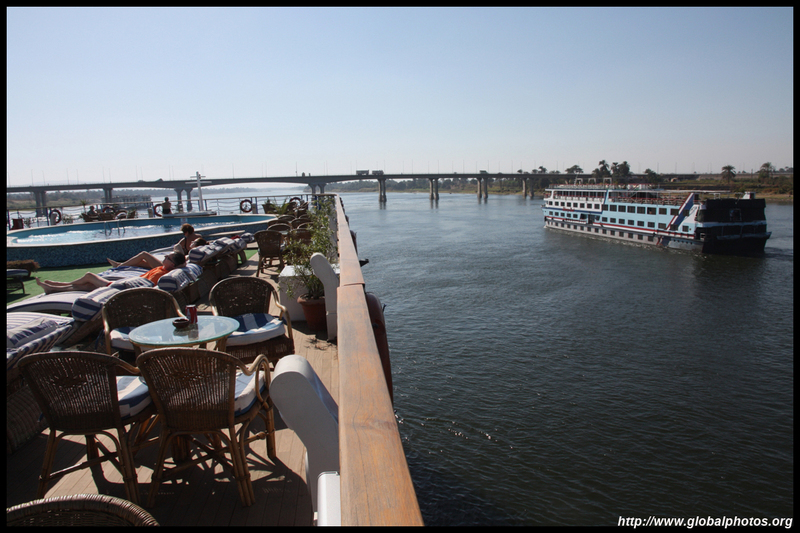 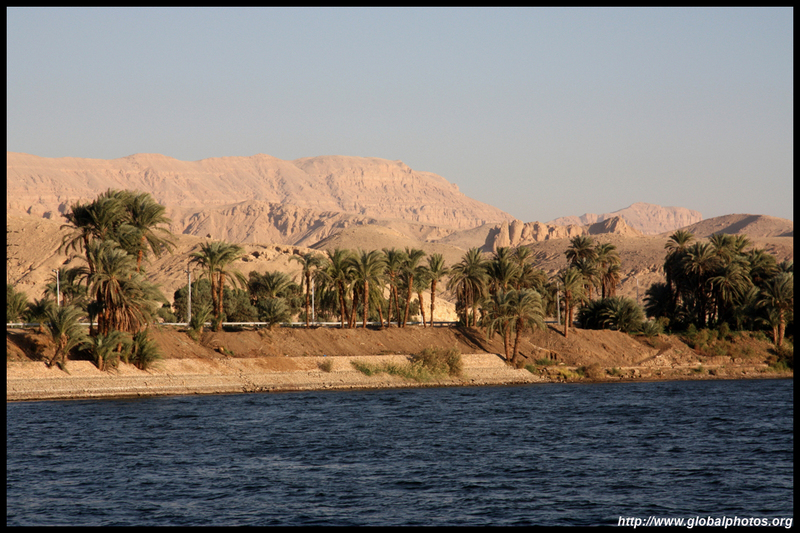 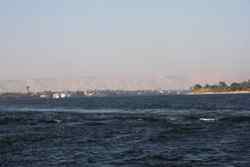 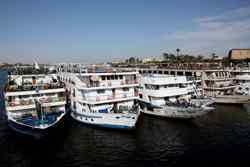 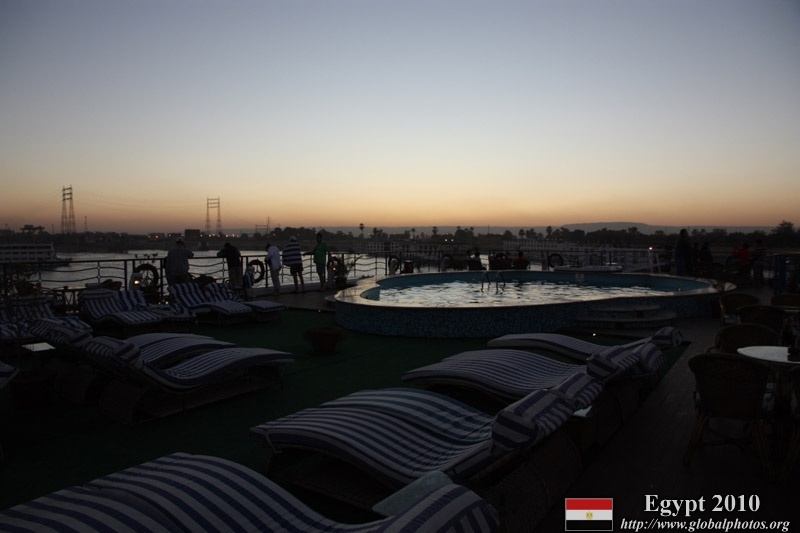 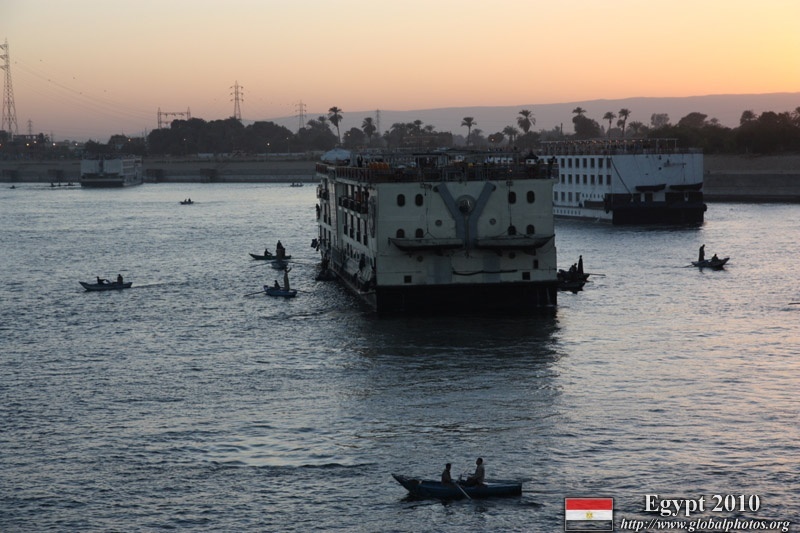 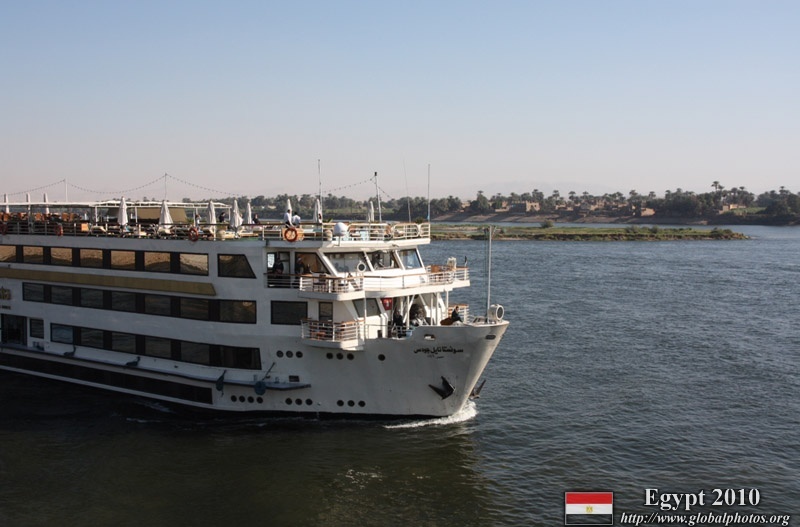 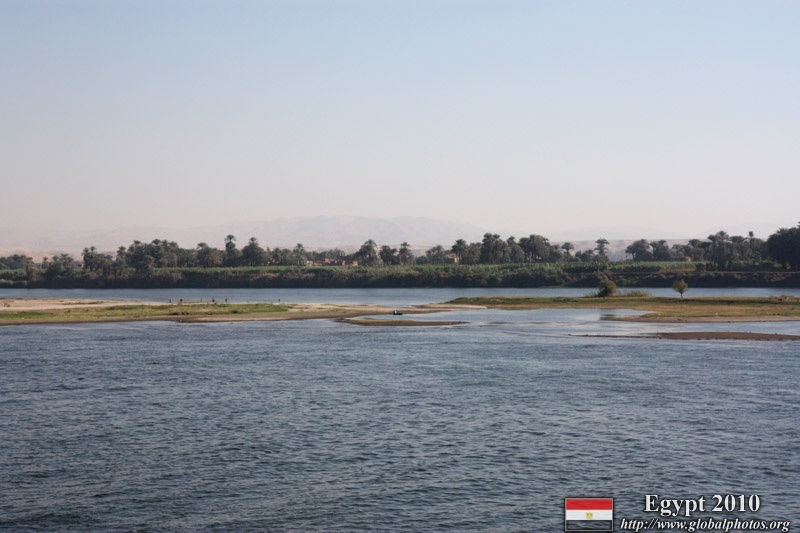 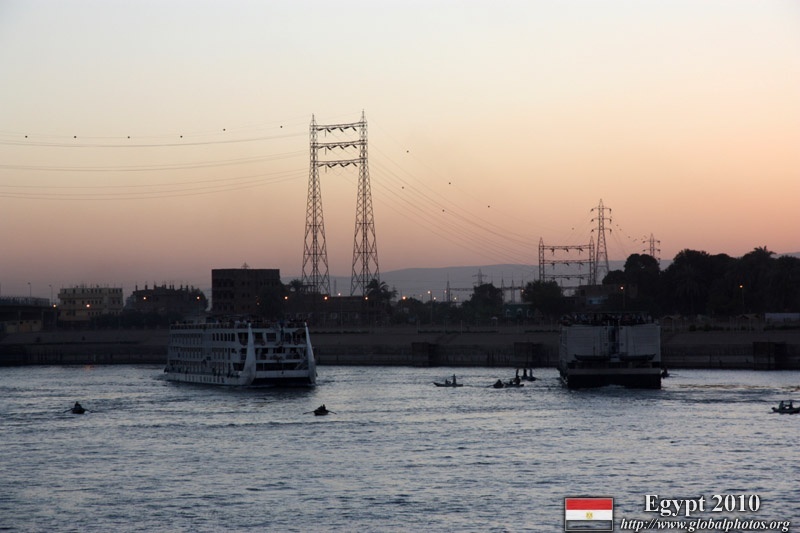 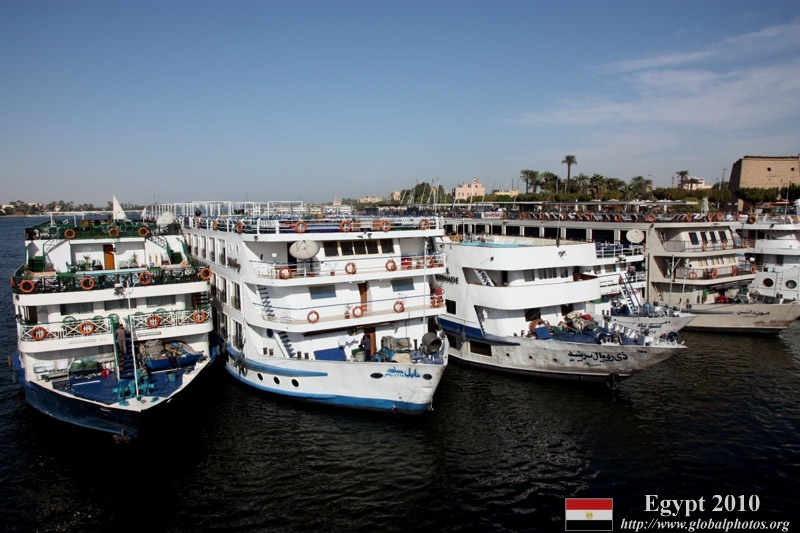 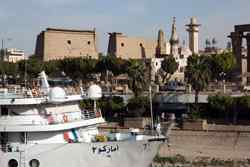 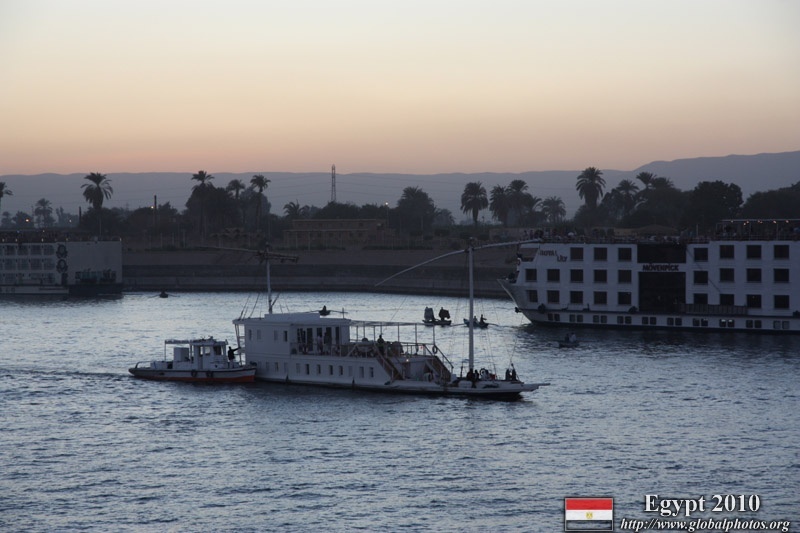 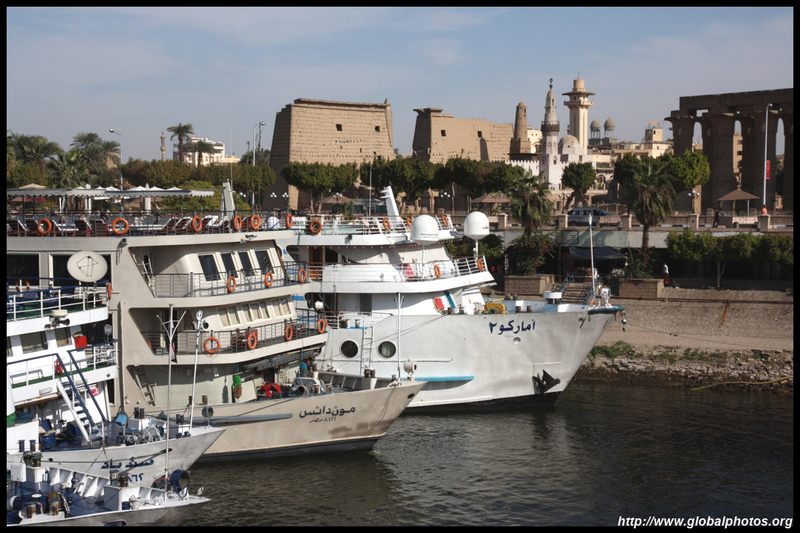 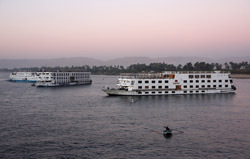 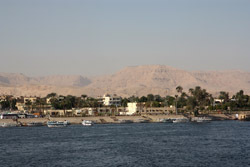 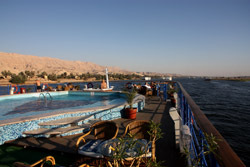 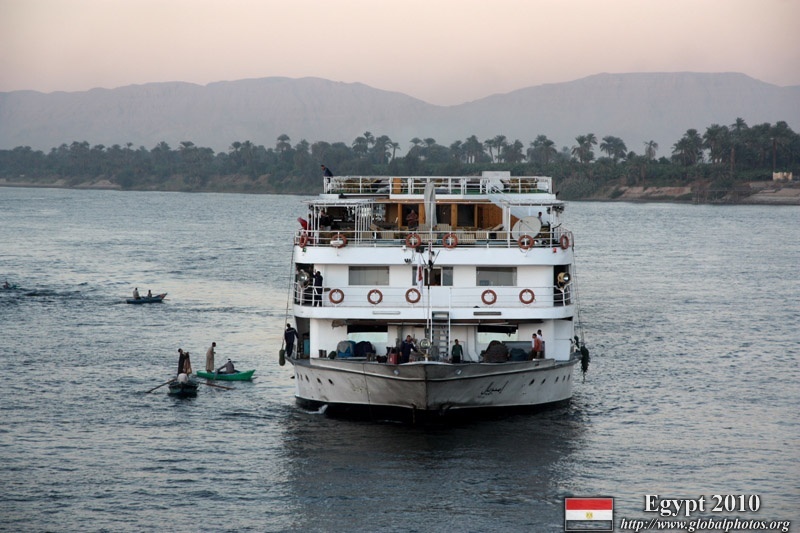 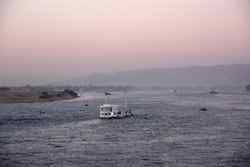 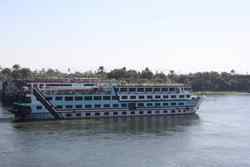 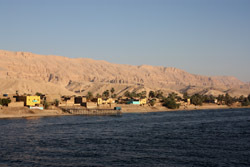 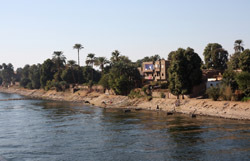 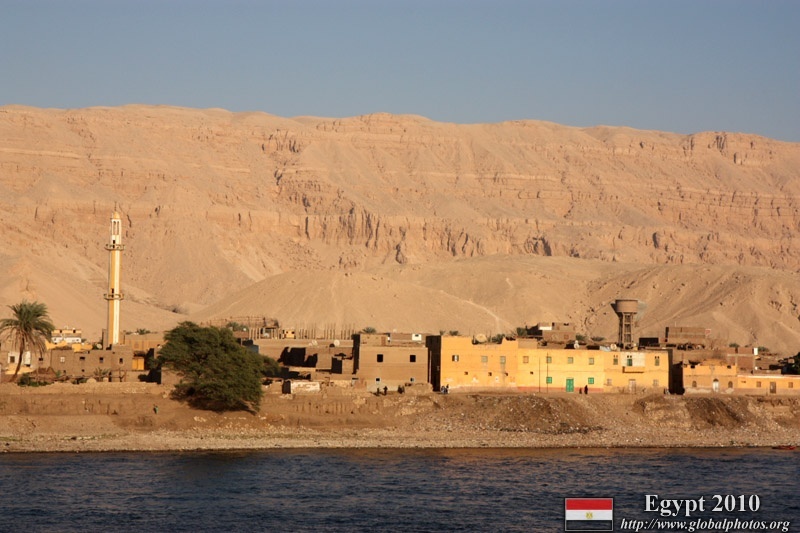 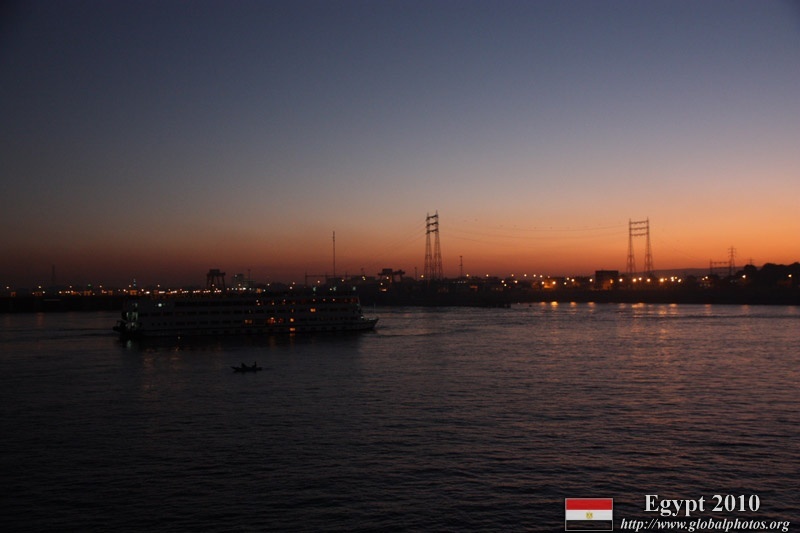 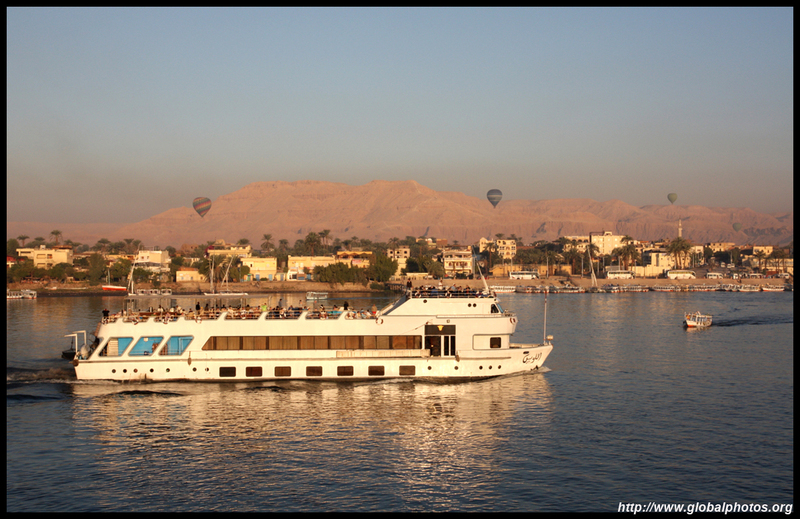 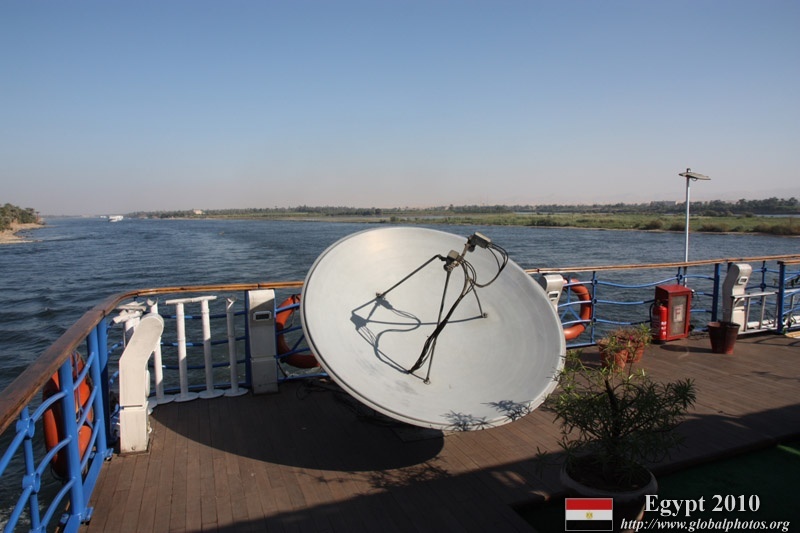 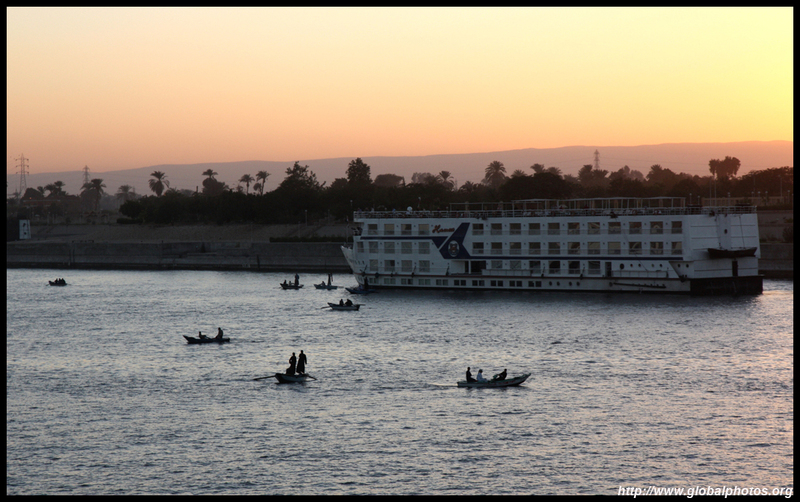 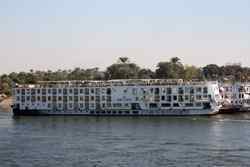 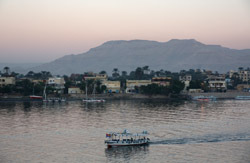 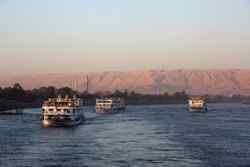 @ Luxor - Cruise boats ply the Nile River between Luxor and Aswan. 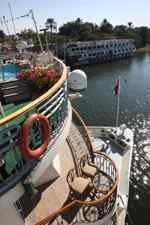 These are not very big cruise ships like those that sail the Caribbean and the Mediterranean, but cozier ships of about 4-5 stories. 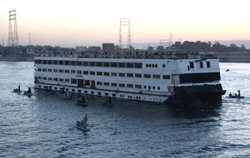 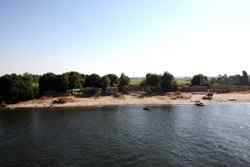 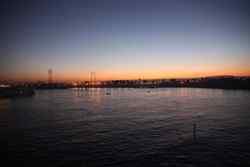 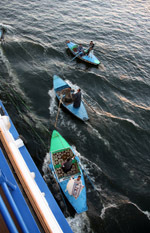 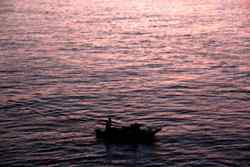 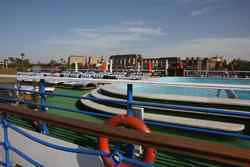 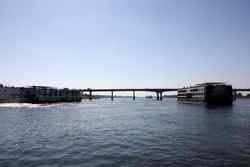 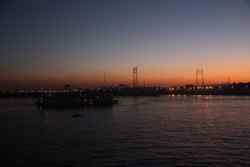 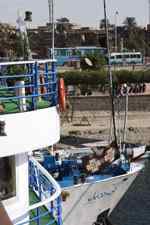 Since there are so many ships and the docking room is limited, boats park one after another, and passengers go through other boats to reach land. 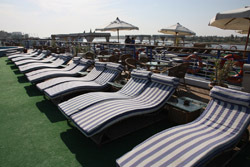 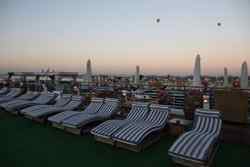 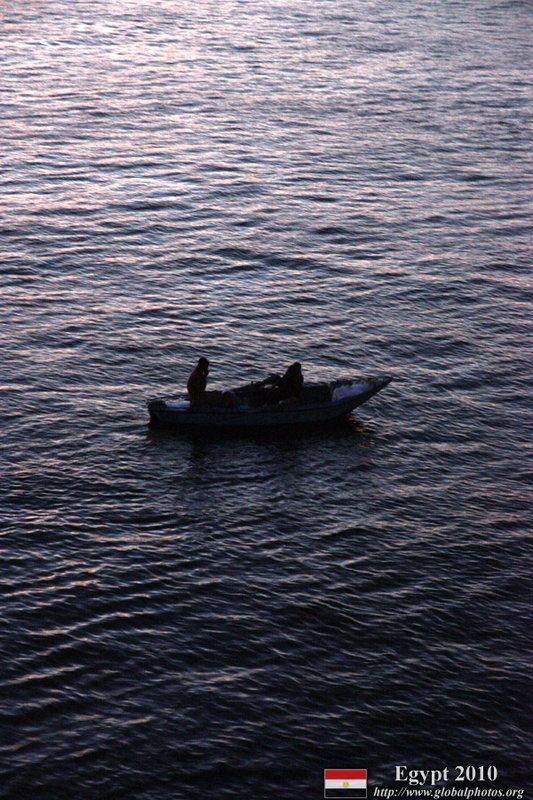 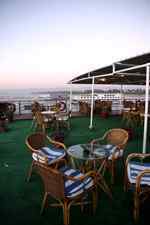 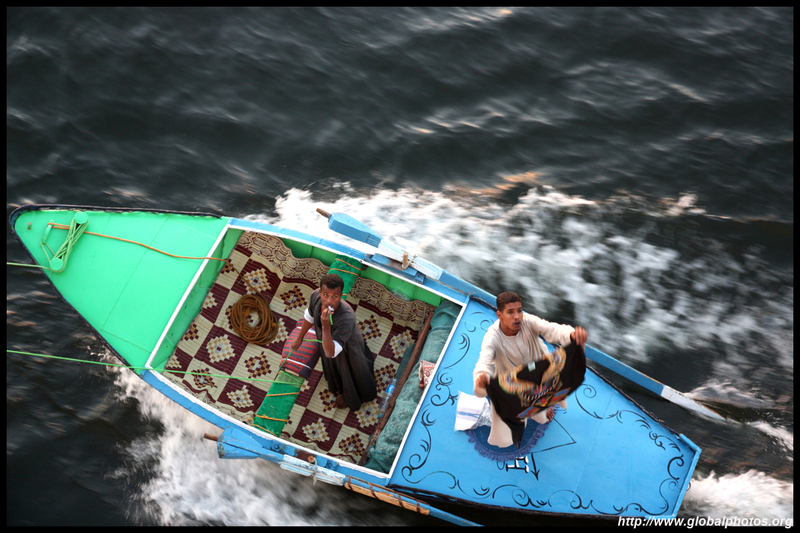 Boats typically have a sun deck for passenegers to capture some rays and also enjoy a few drinks. 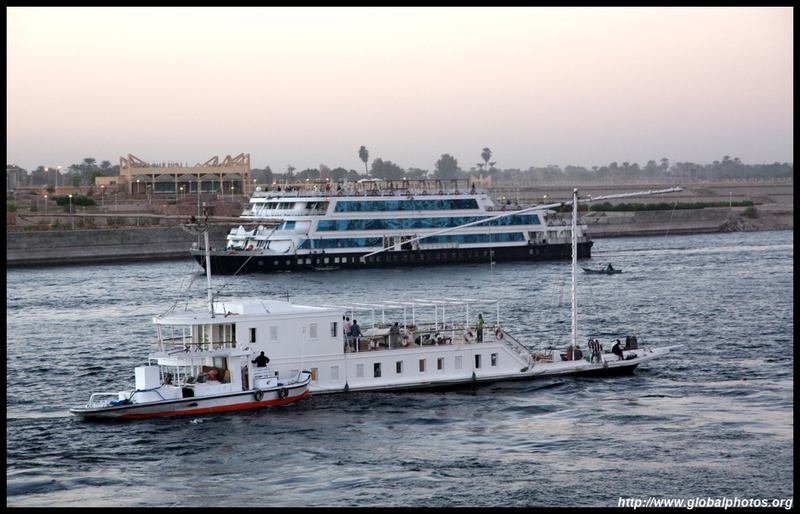 We were lucky to capture a docking space next to the Luxor Temple. 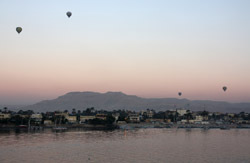 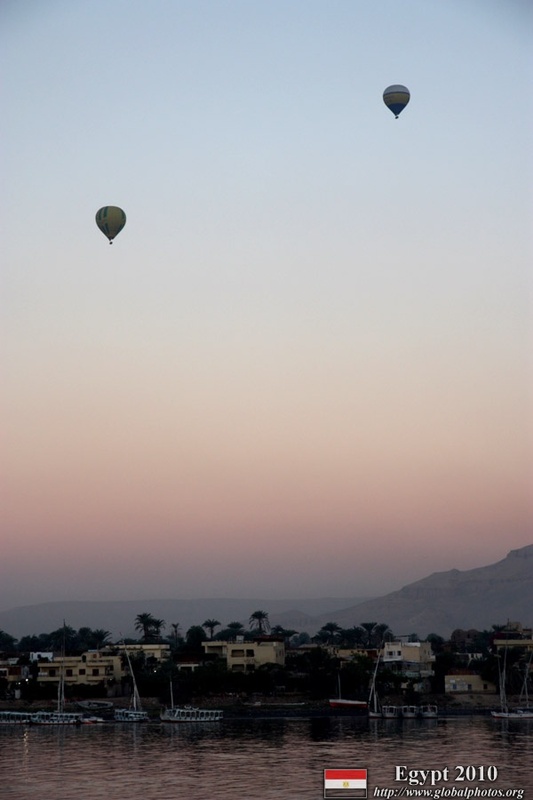 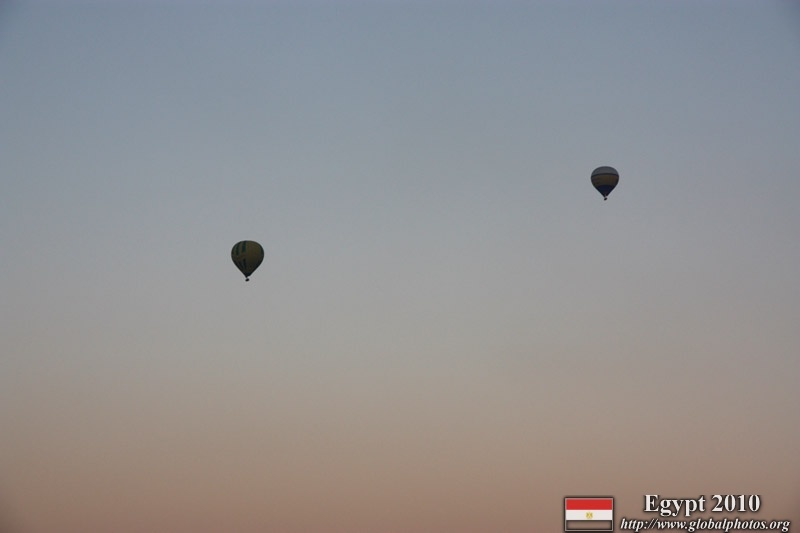 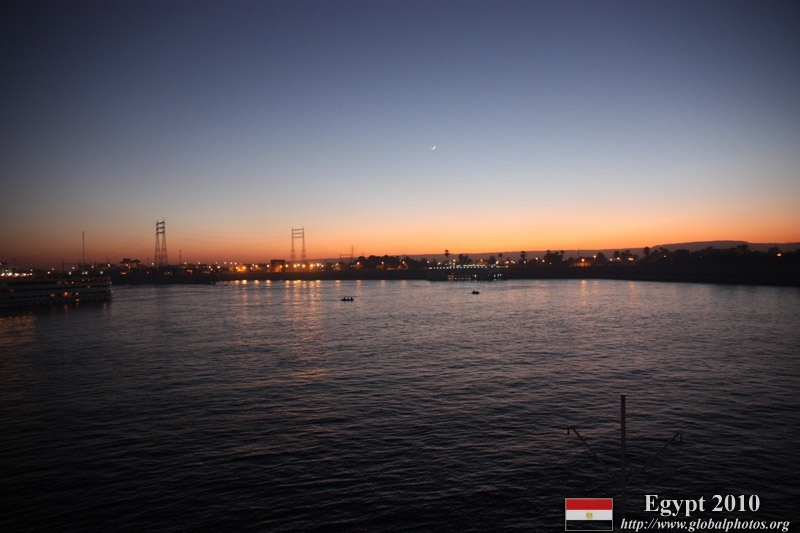 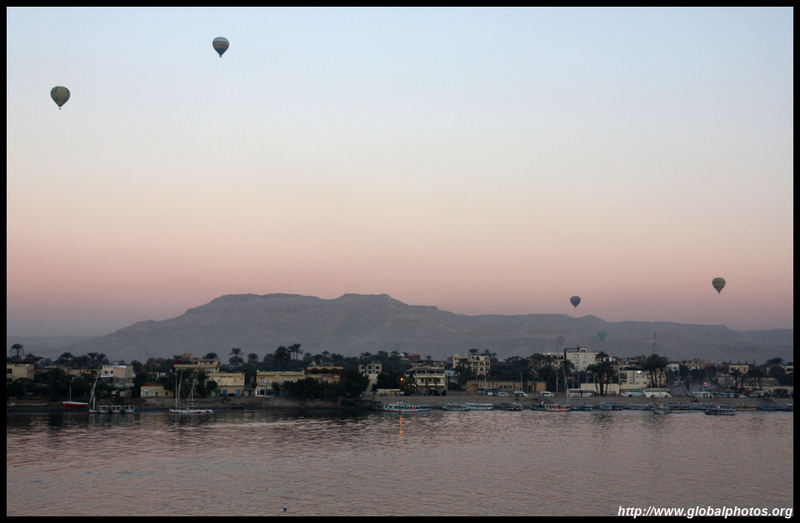 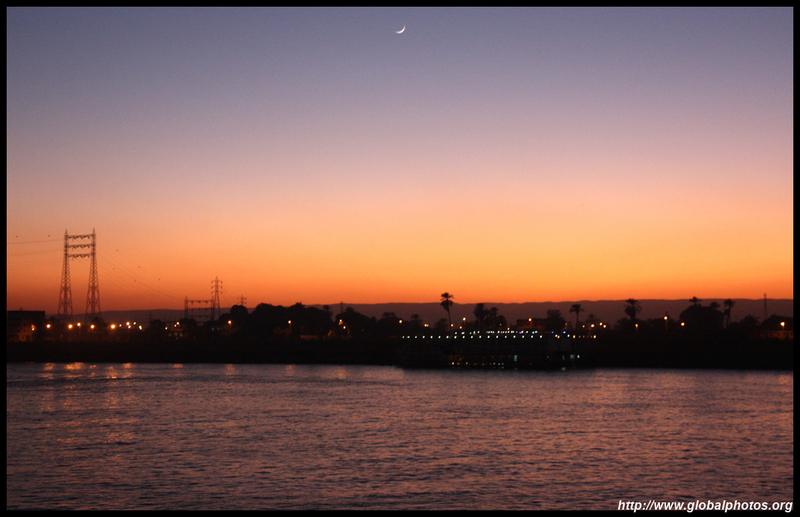 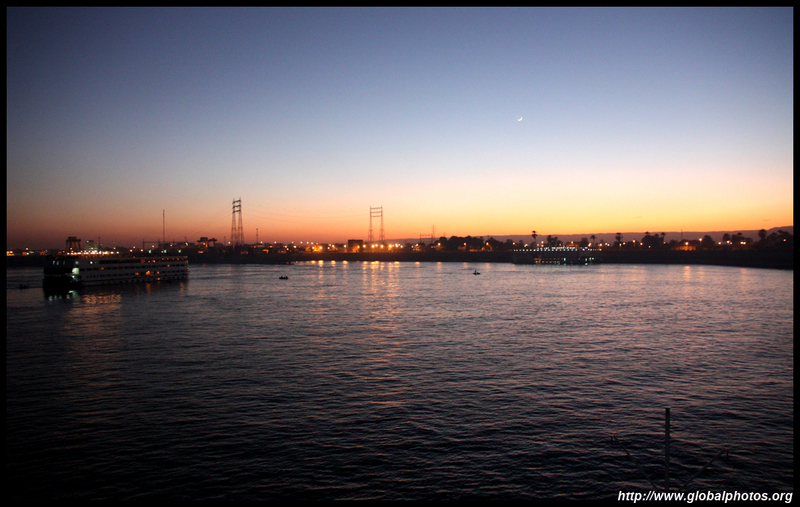 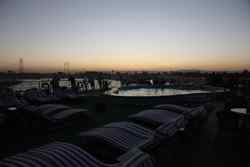 Luxor's sunrise is quite magical. 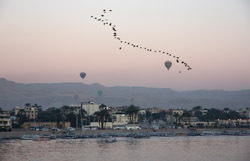 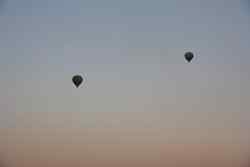 Not only are the colours lovely, the sky was full of hot-air balloons. 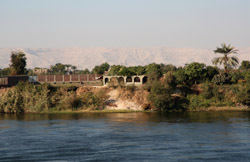 Looking at the West Bank, where the dead rest. 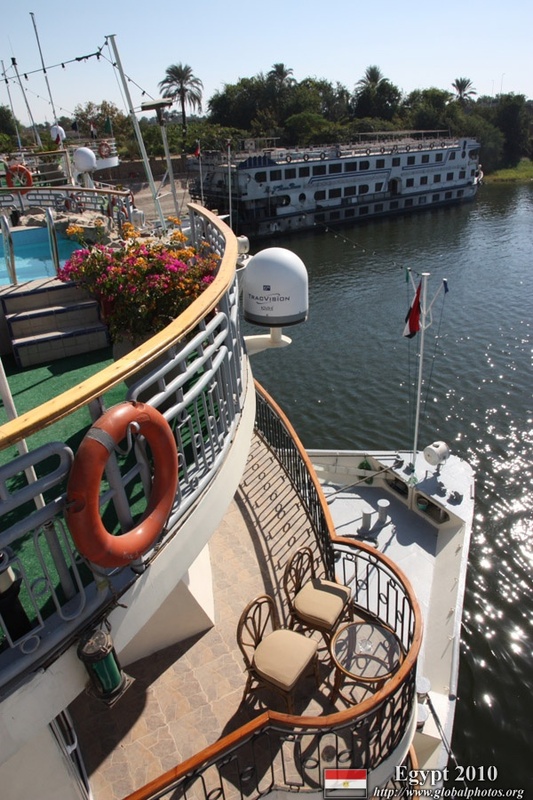 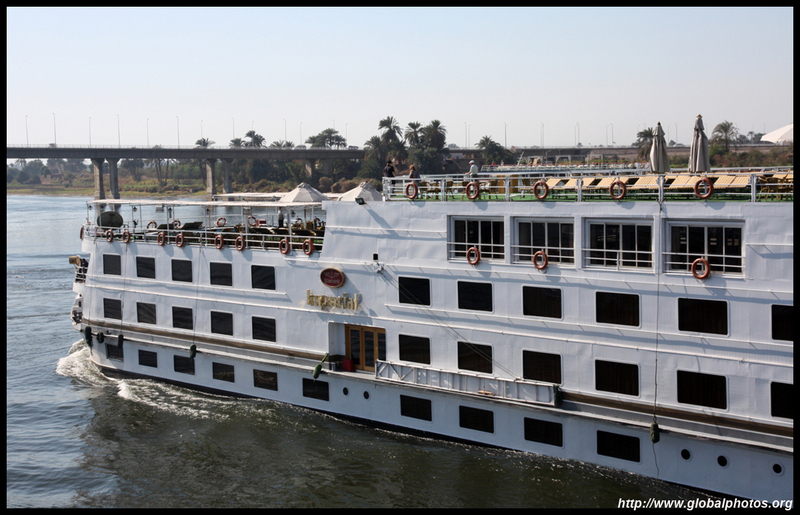 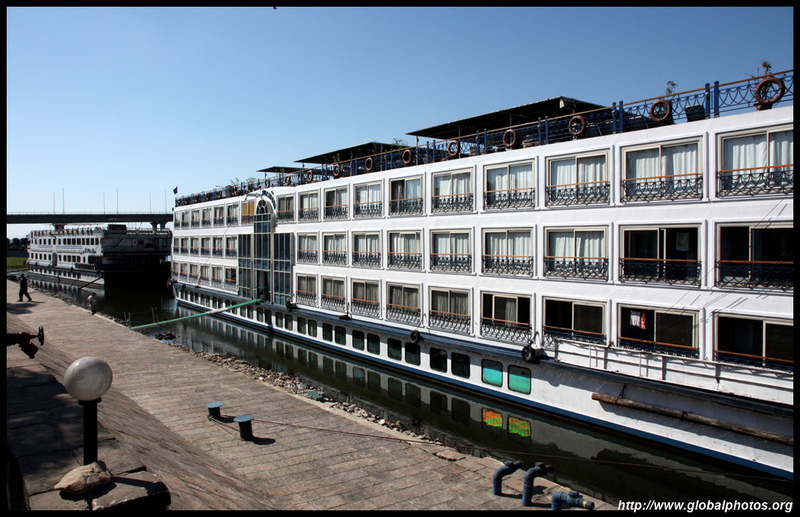 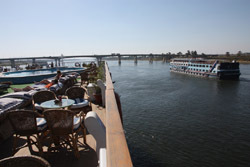 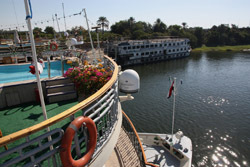 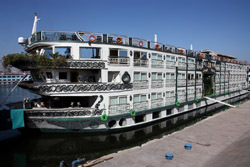 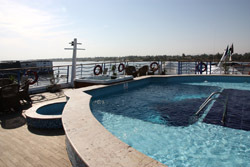 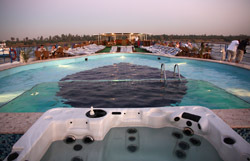 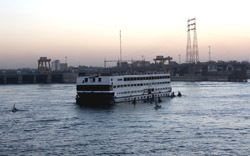 Each room has its wide window that can open so passengers can enjoy the Nile breeze and watch the riverside's activity. 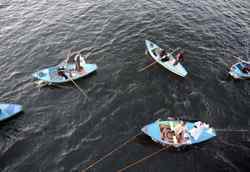 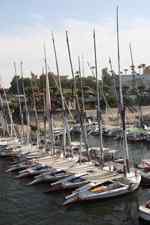 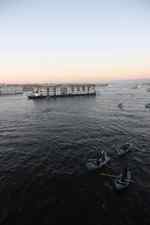 The series of boats took off, one by one. 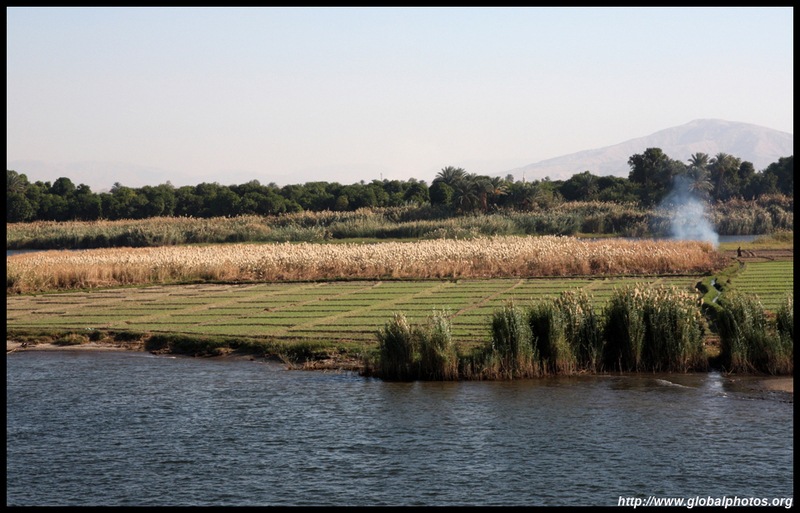 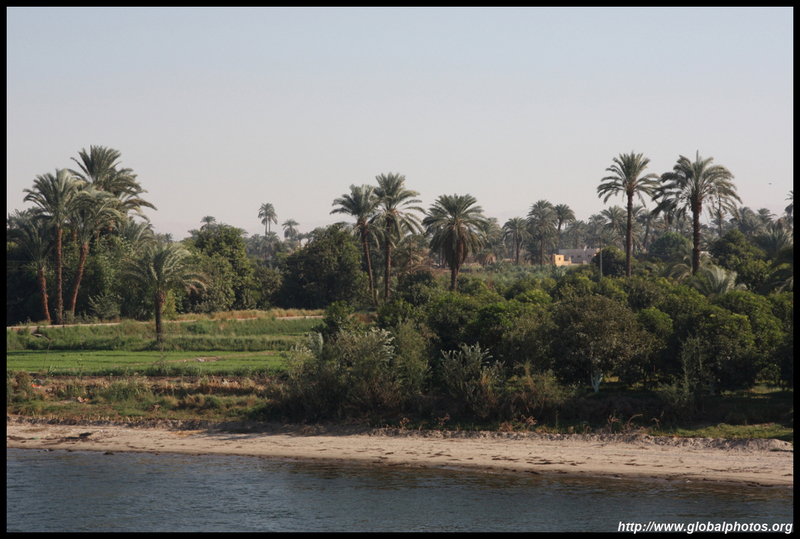 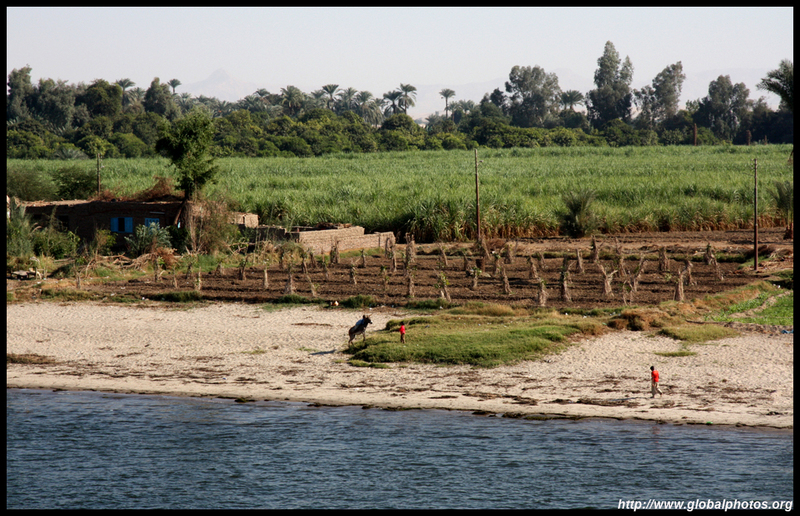 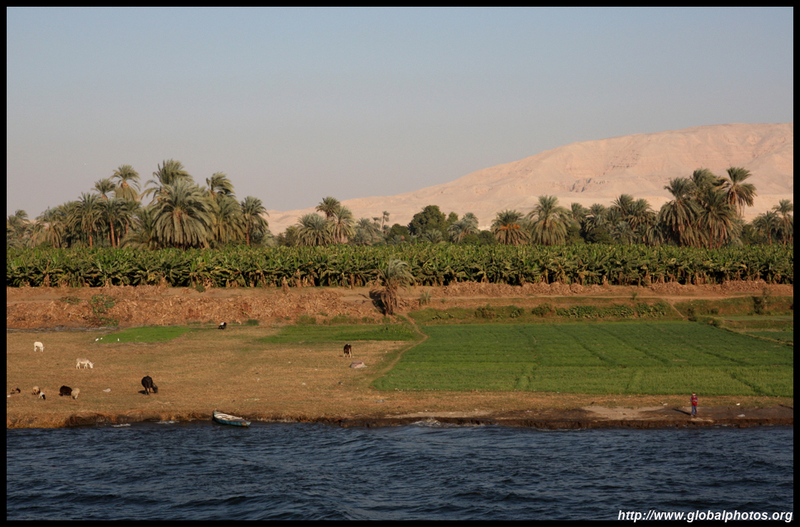 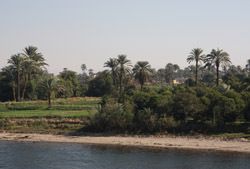 The Nile's banks are quite lush and green. 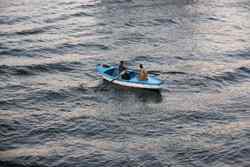 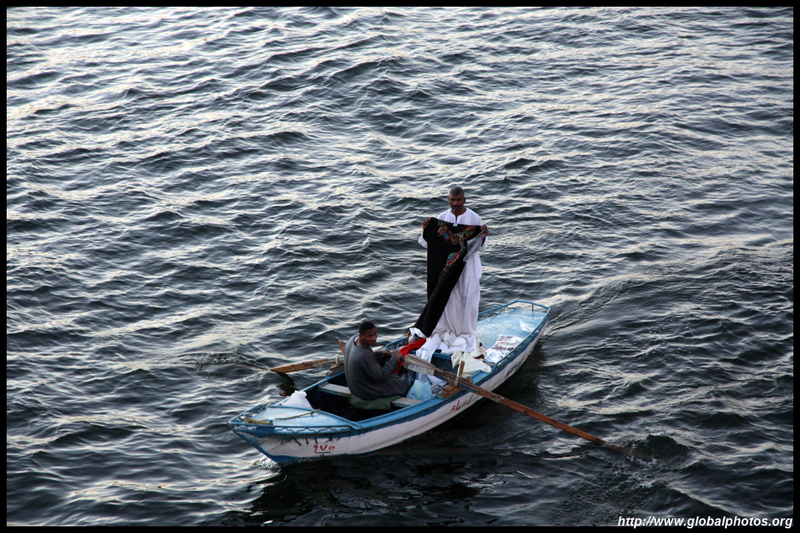 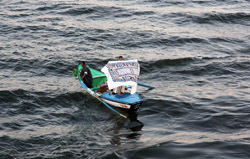 The locals are quite enthusiastic as the boats passed by, waving and screaming their greetings. 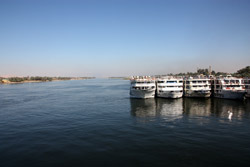 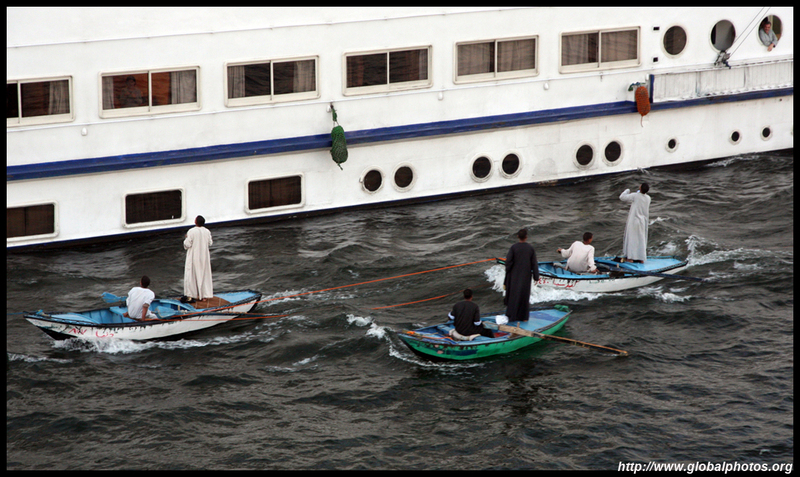 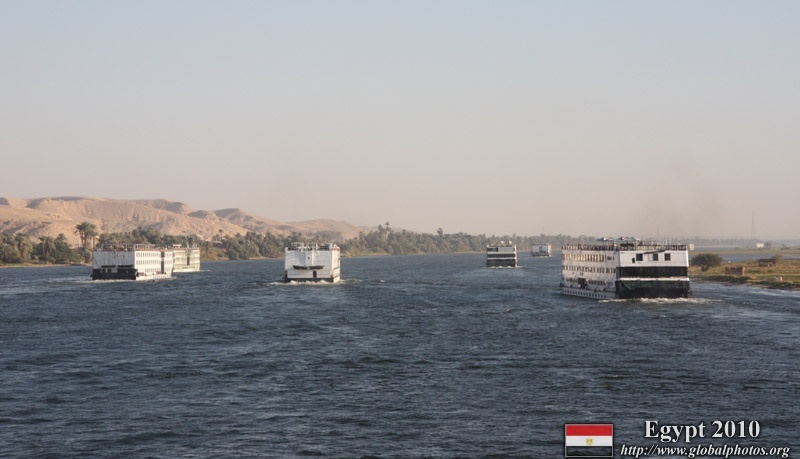 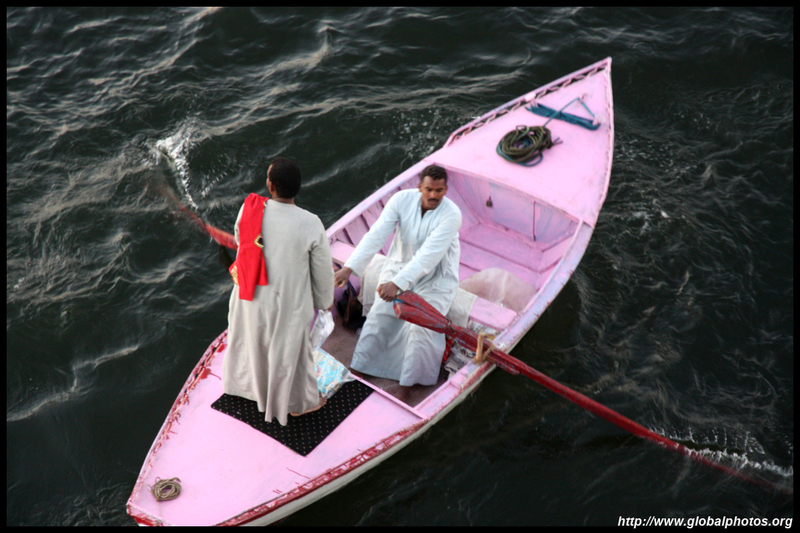 The Nile cruise itinerary is not too busy. 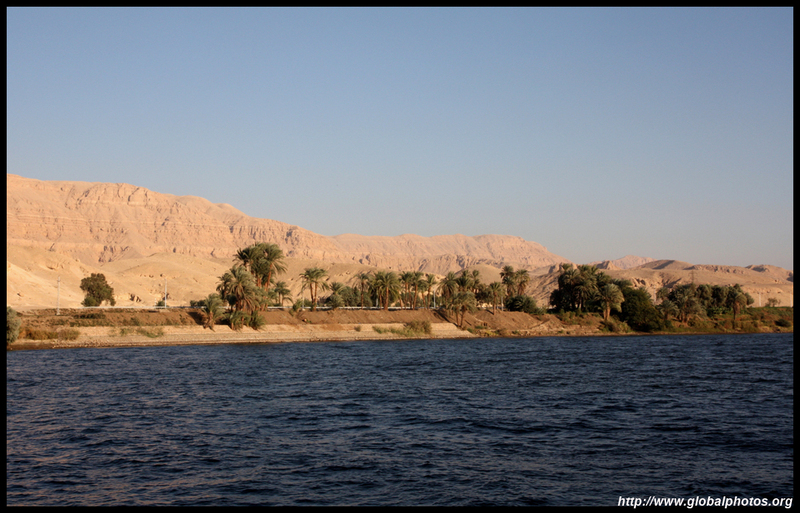 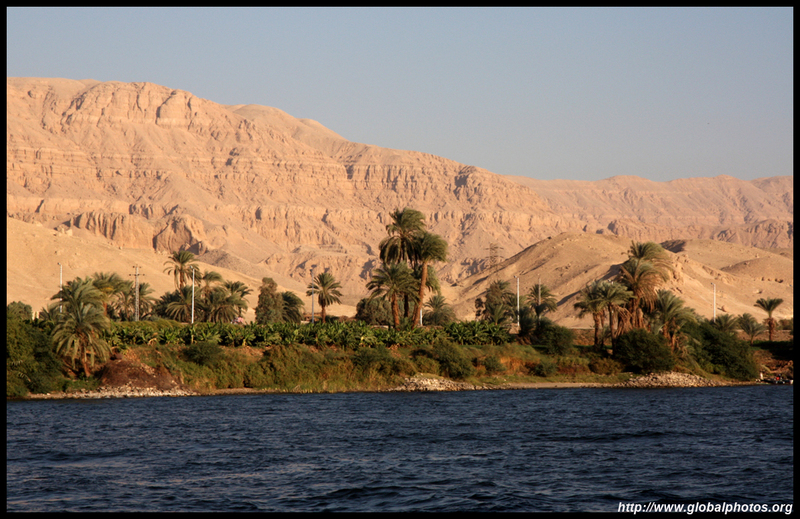 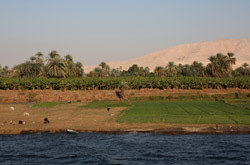 After a morning exploring the Valley of Kings, it was time to relax on the boat for a couple of hours. 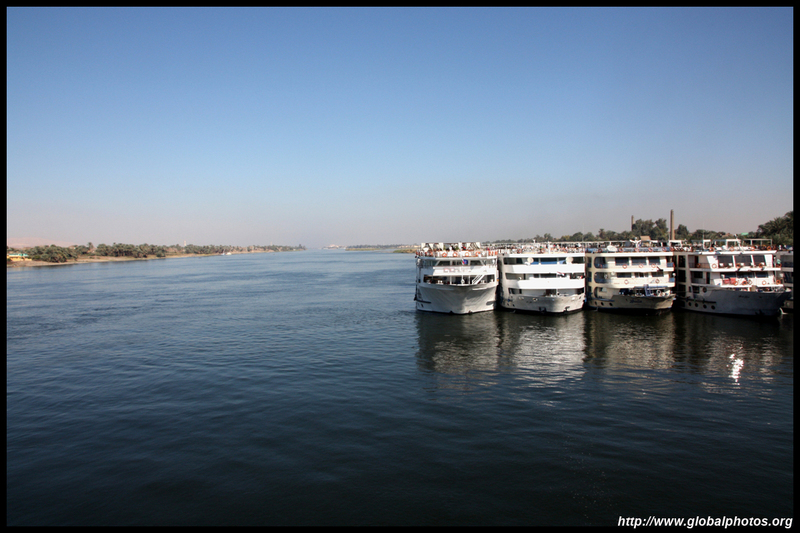 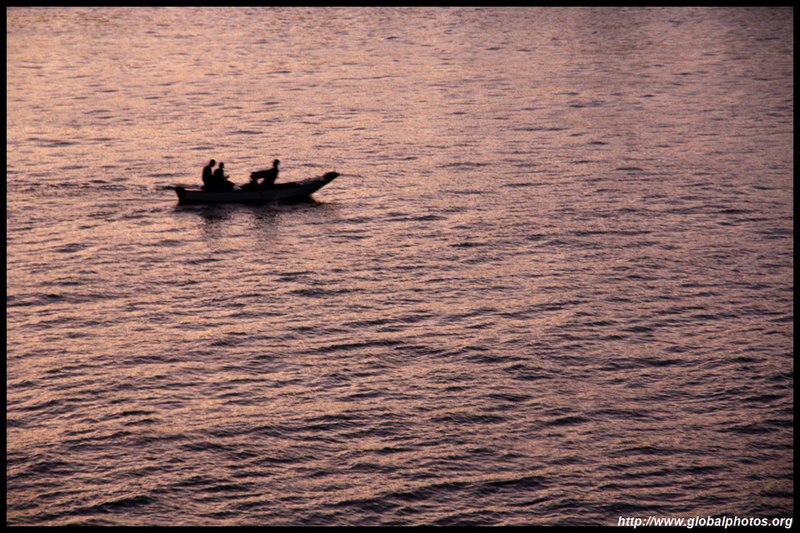 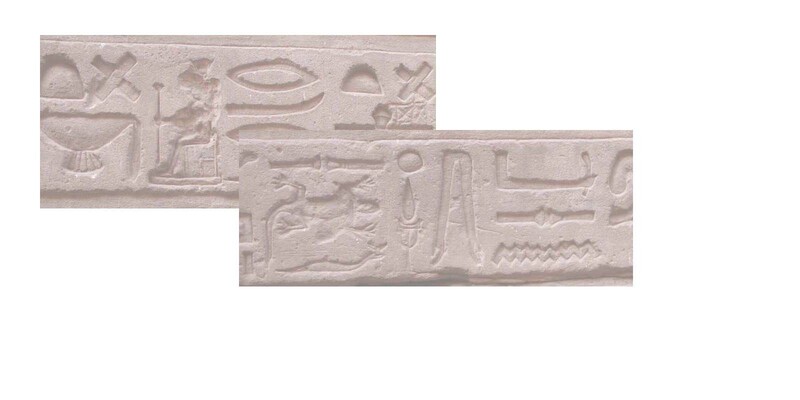 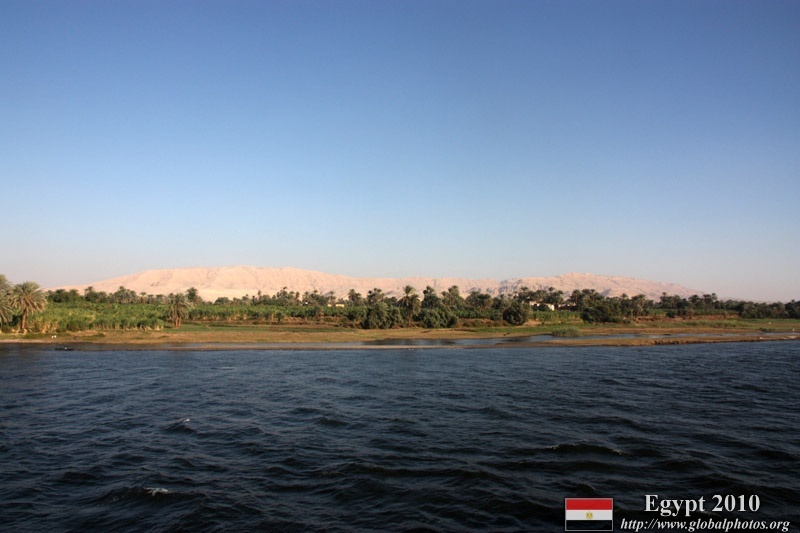 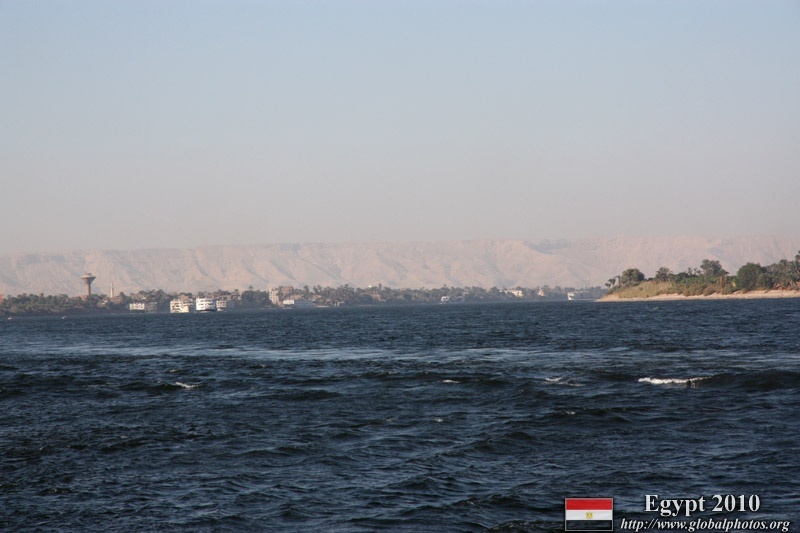 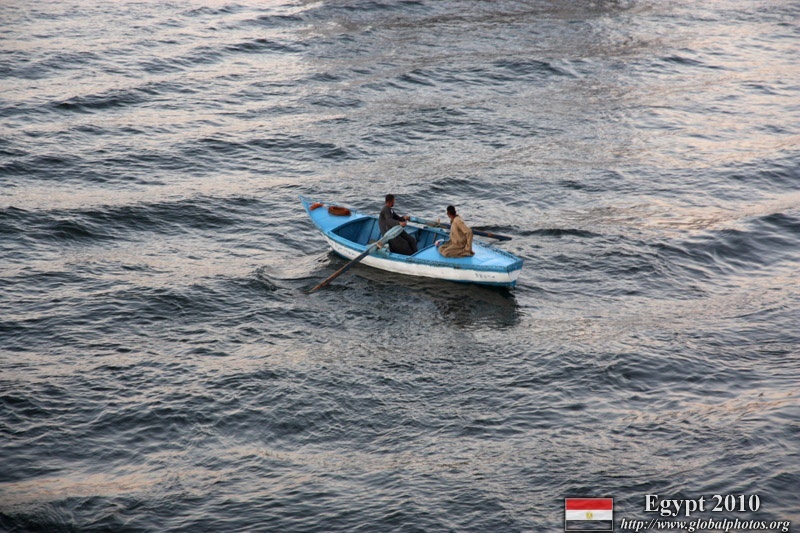 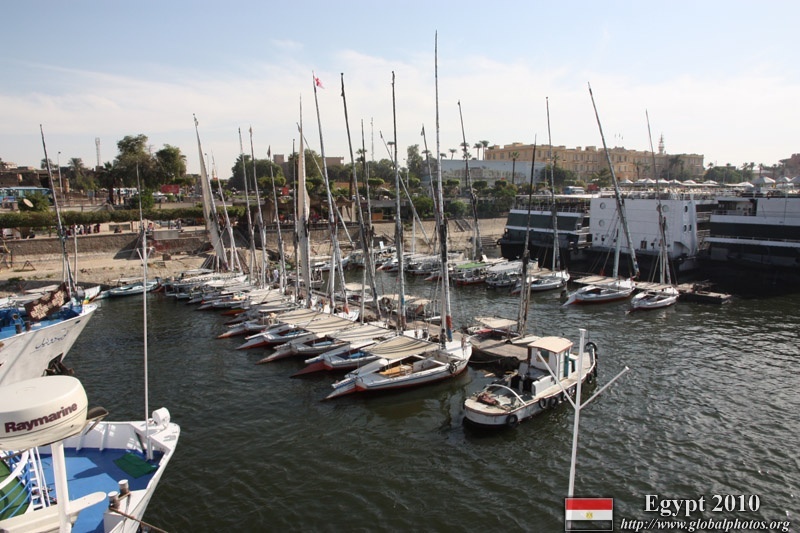 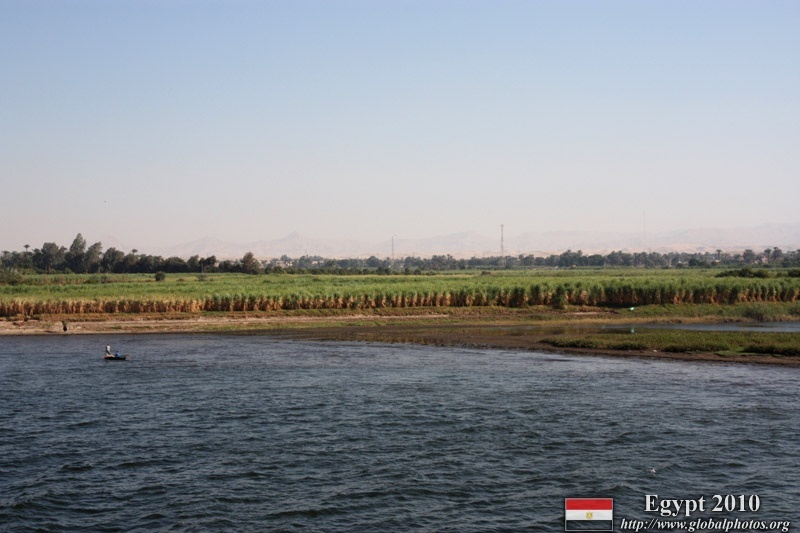 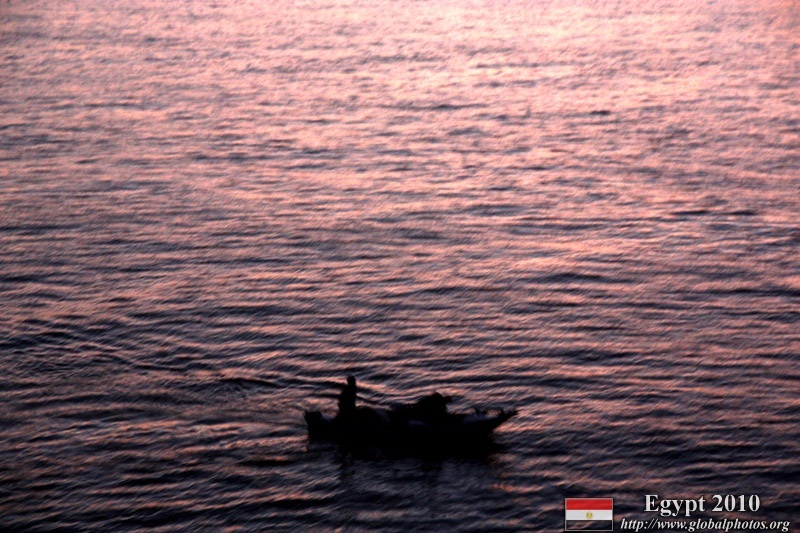 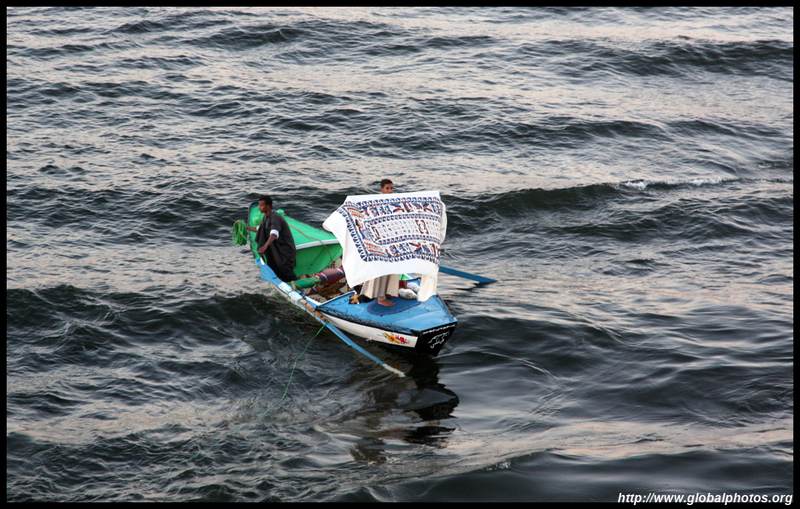 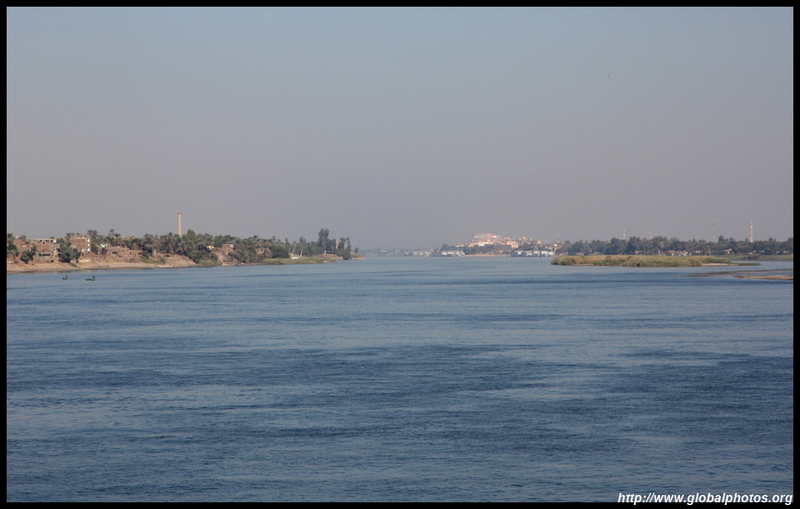 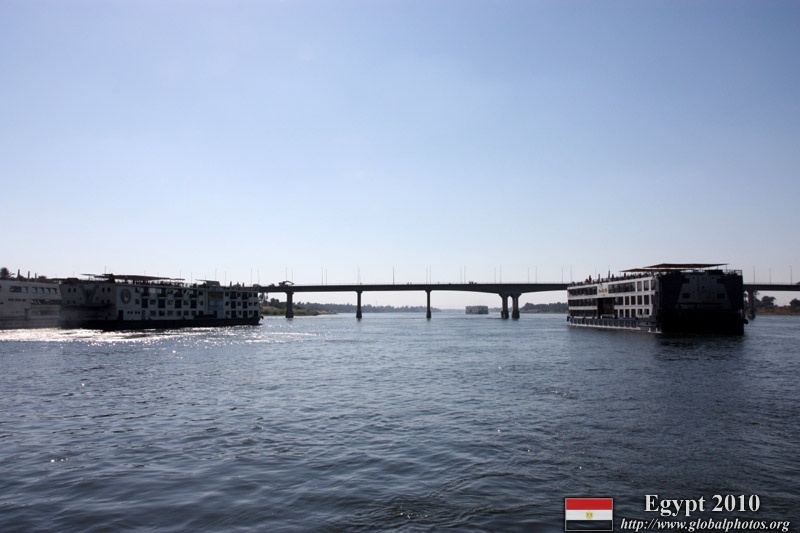 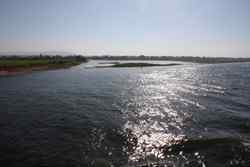 The Nile is actually a very wide waterway. 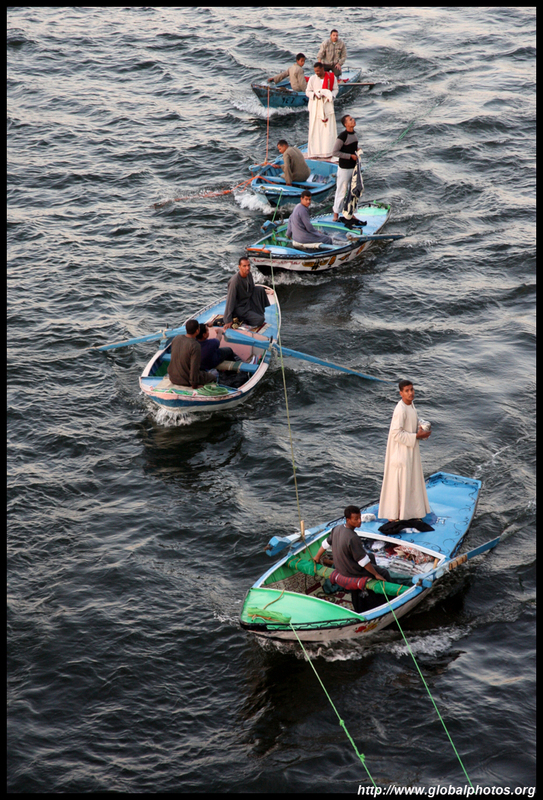 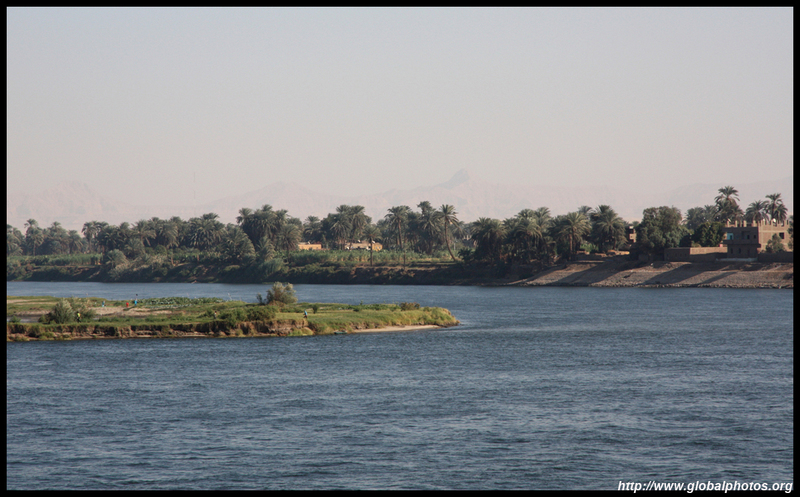 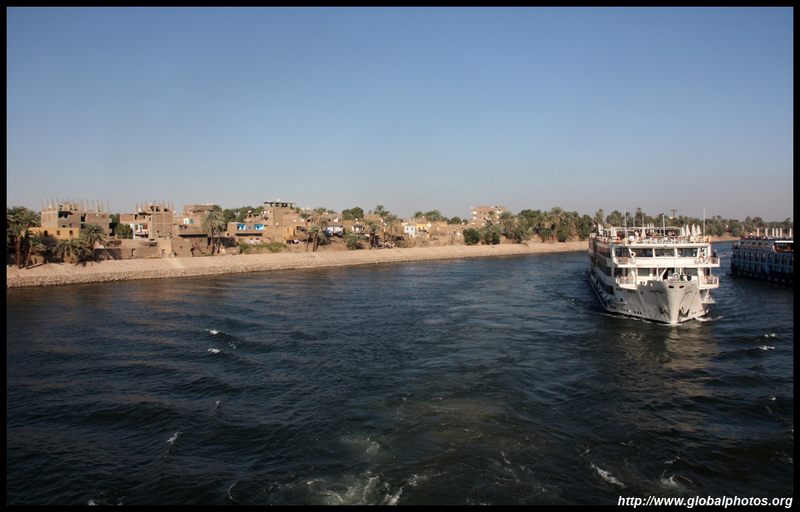 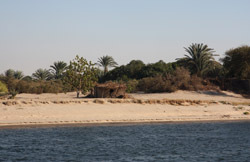 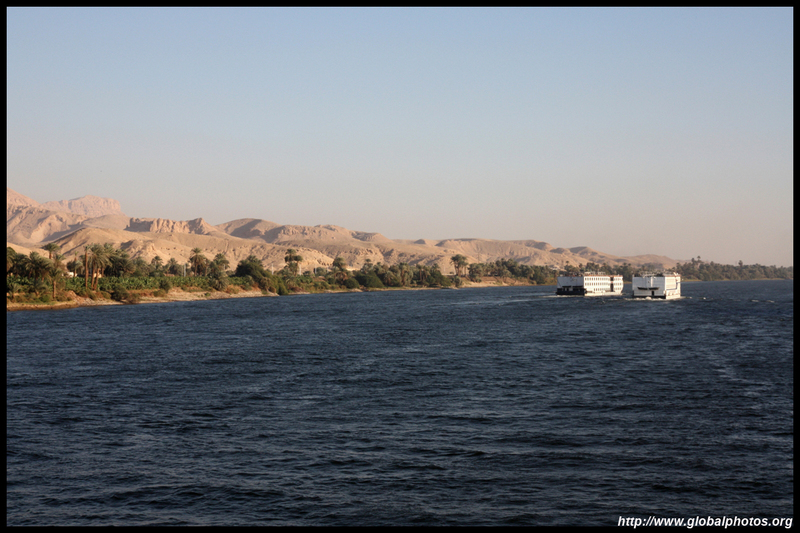 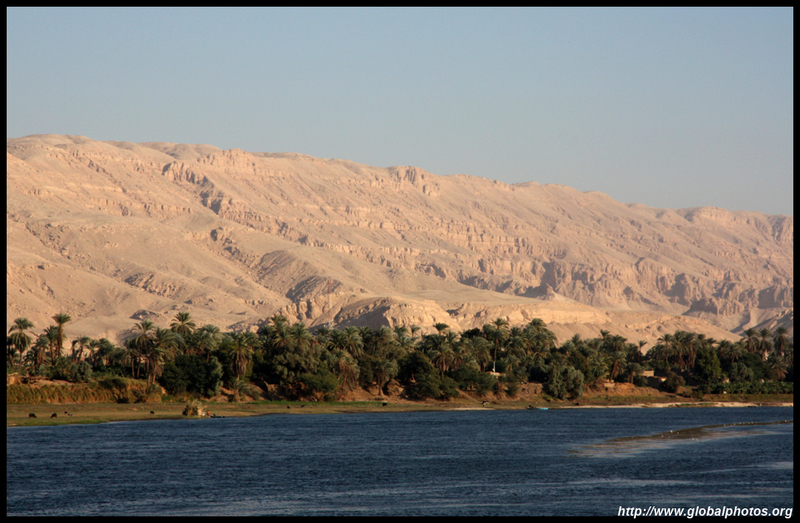 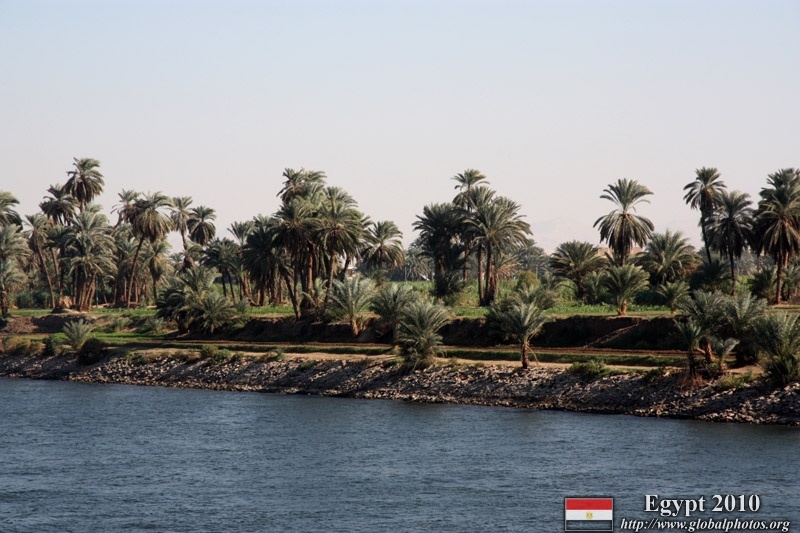 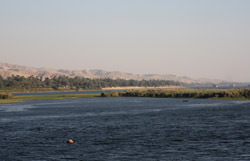 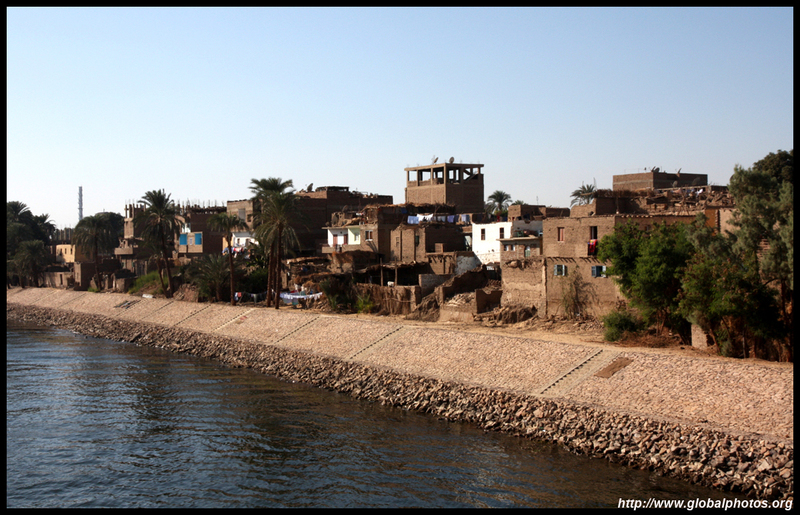 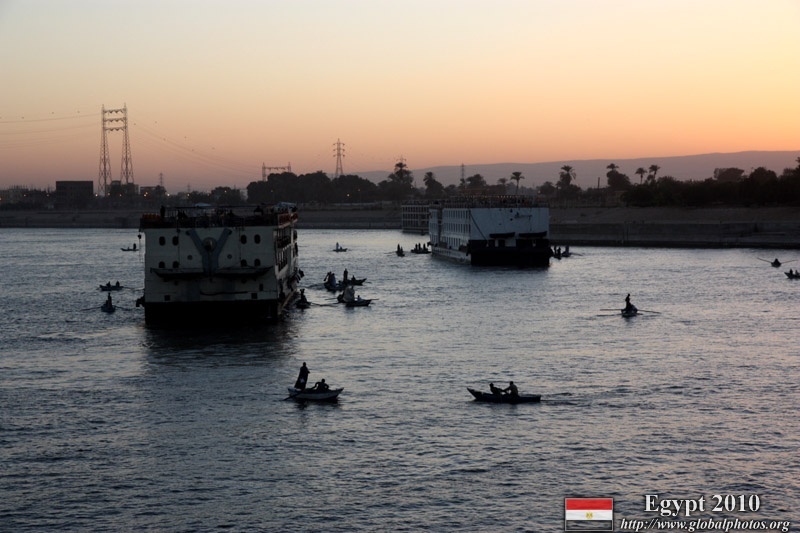 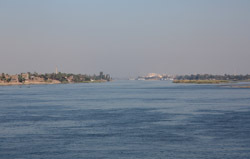 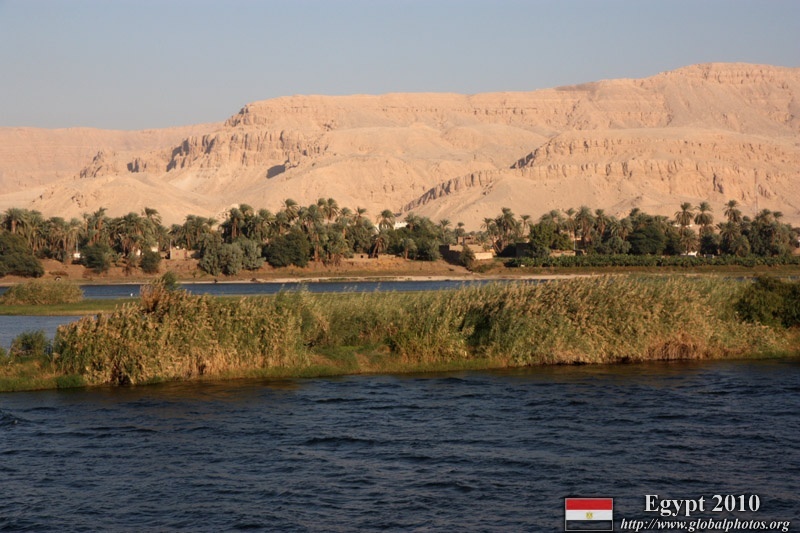 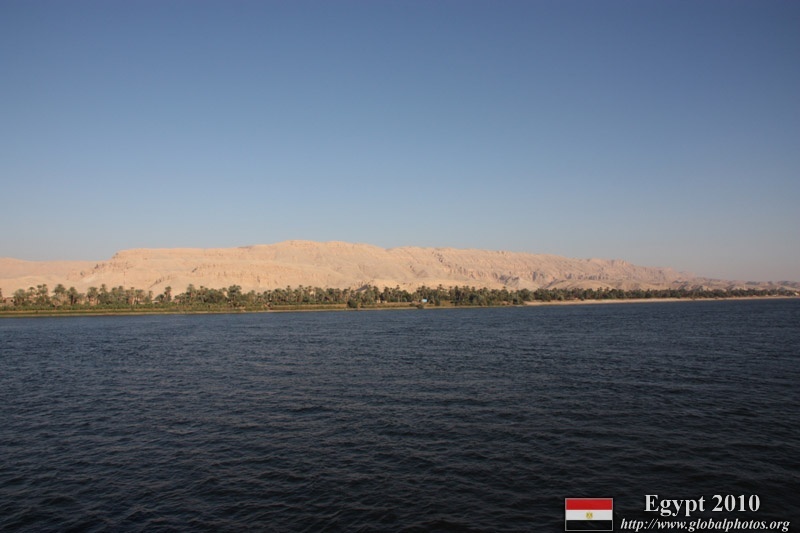 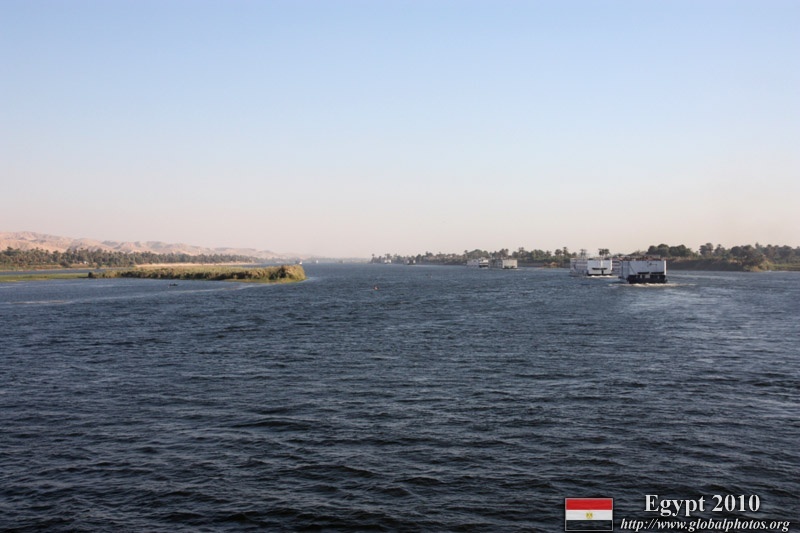 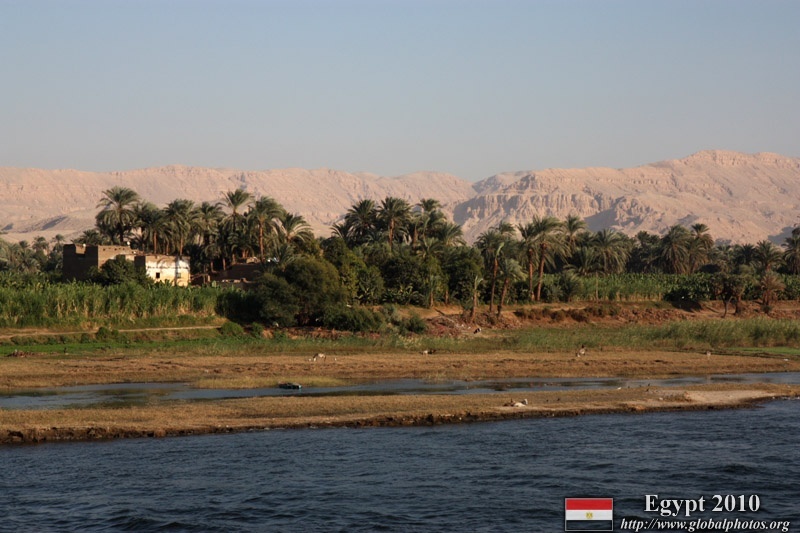 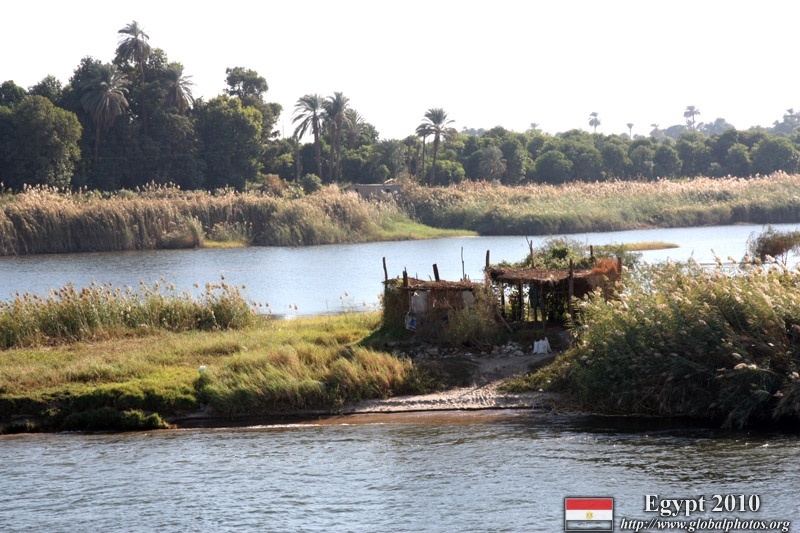 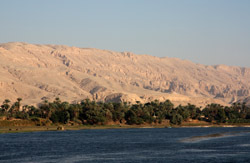 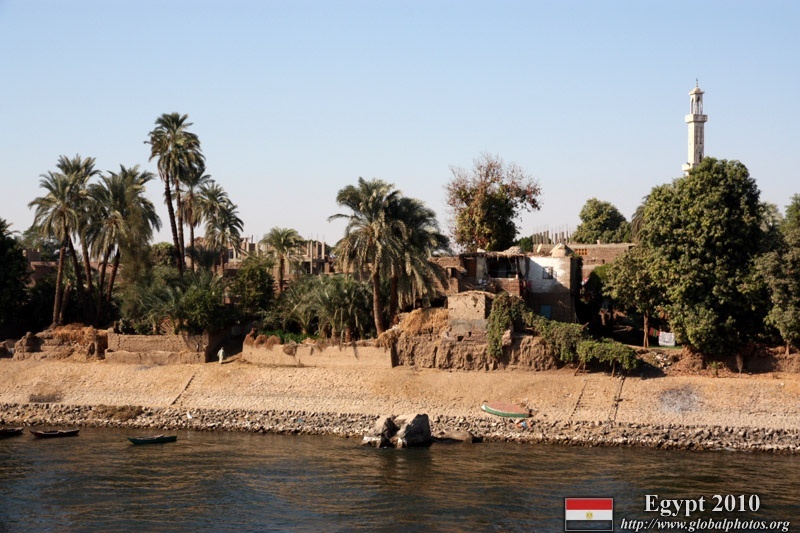 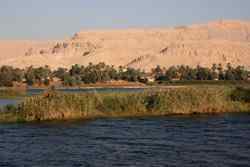 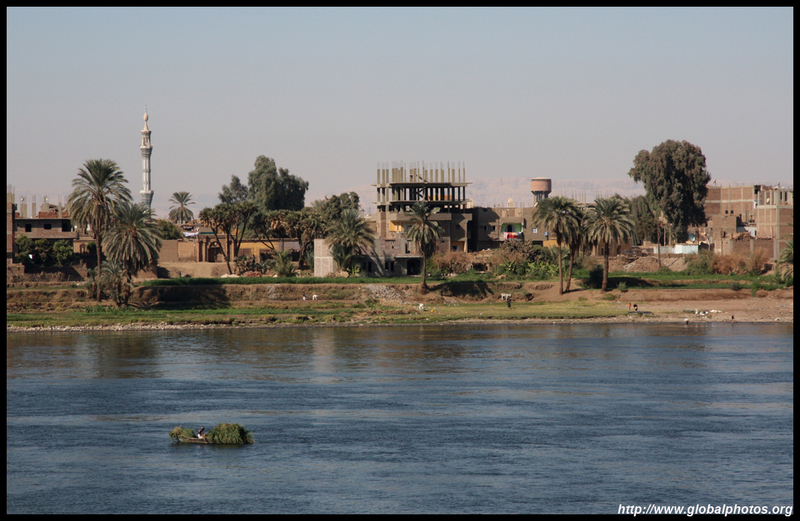 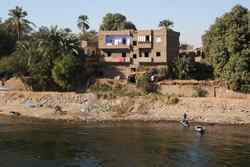 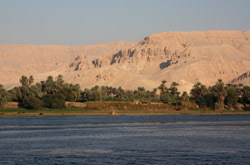 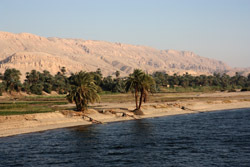 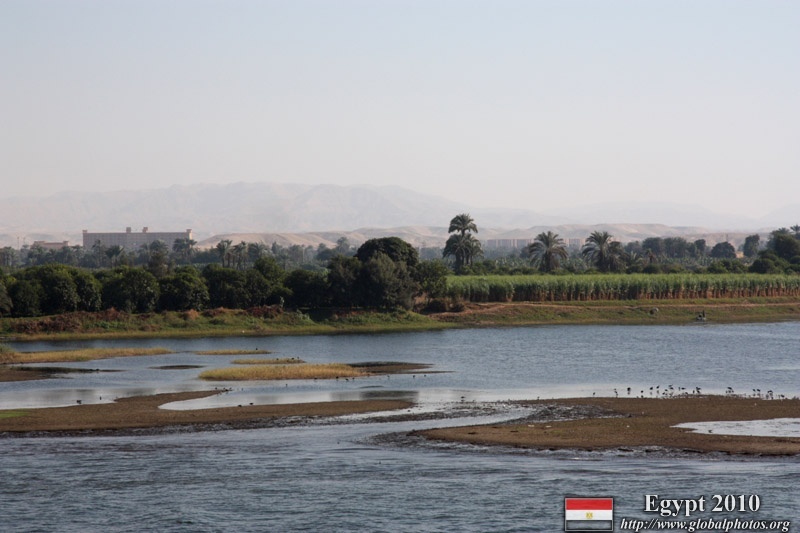 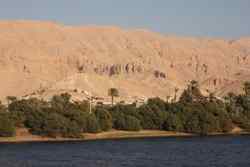 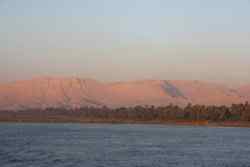 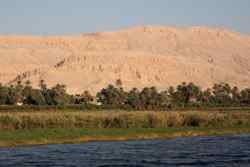 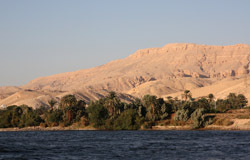 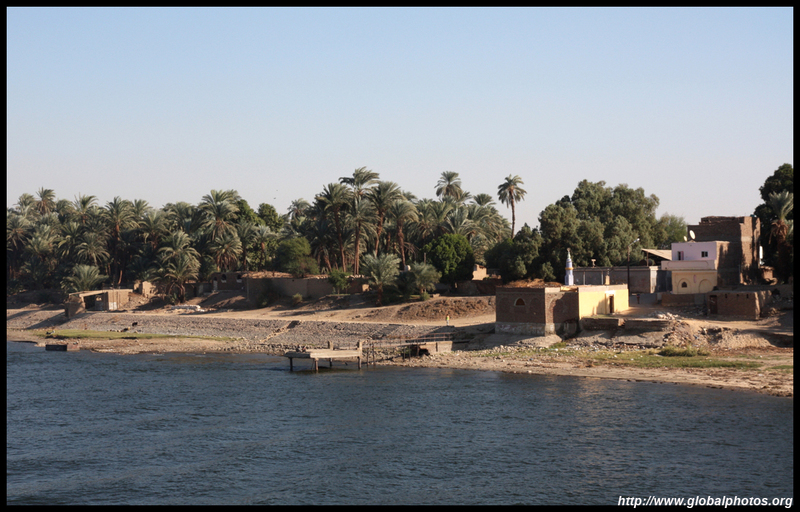 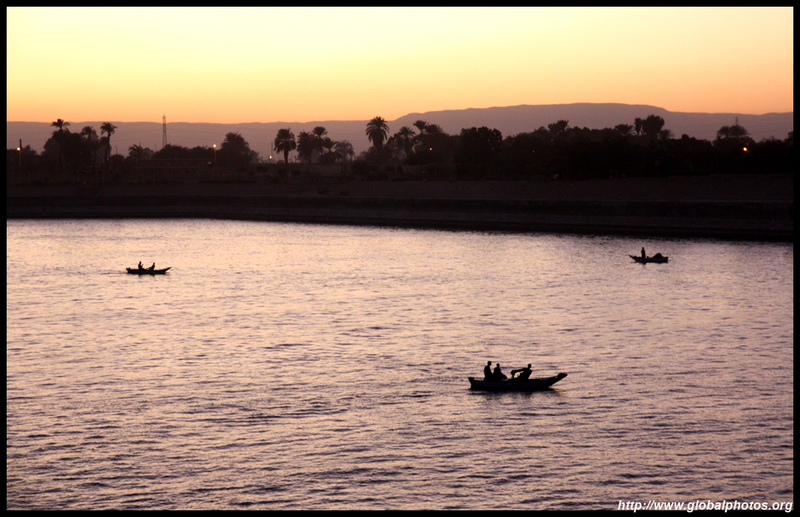 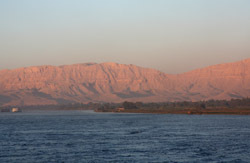 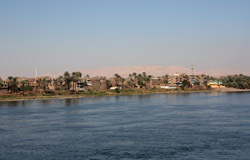 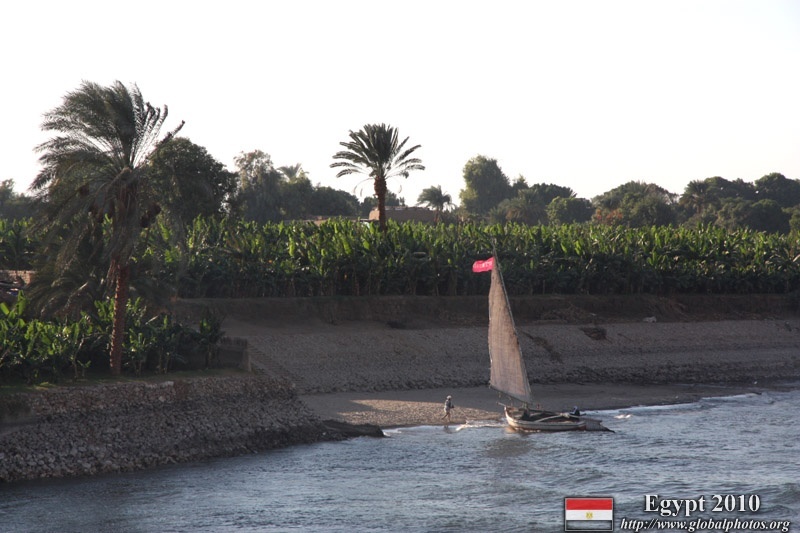 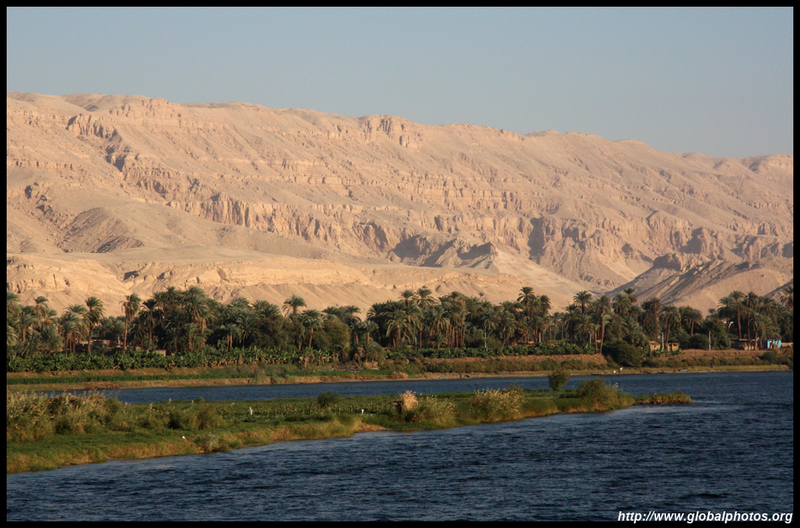 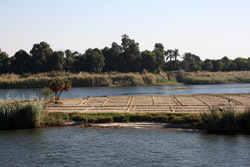 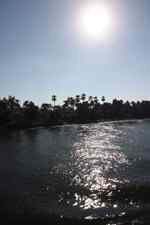 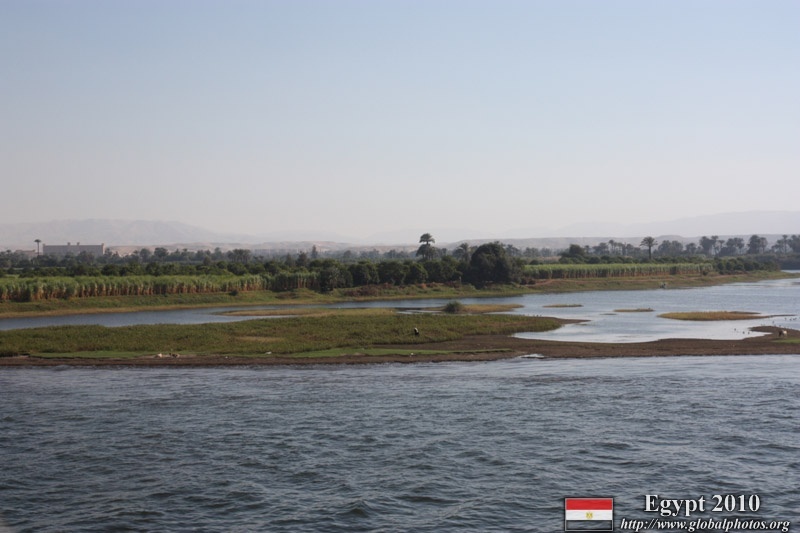 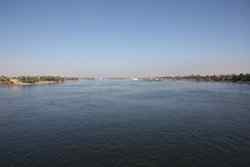 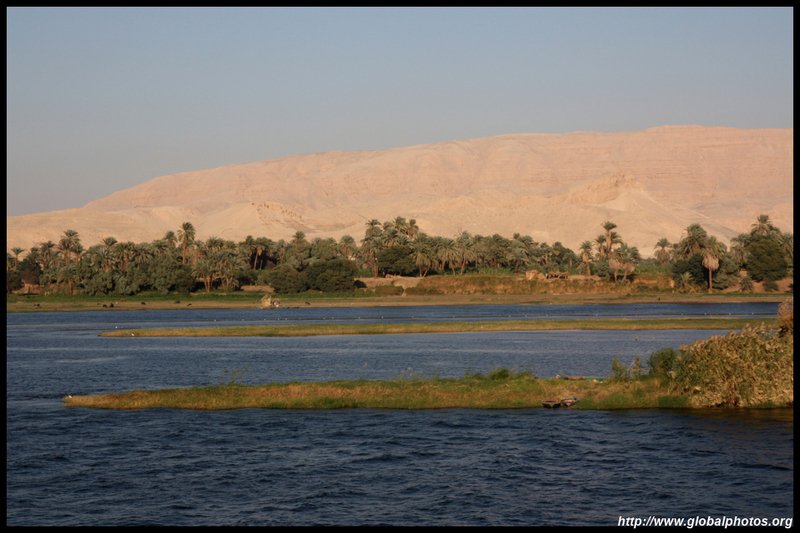 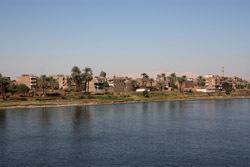 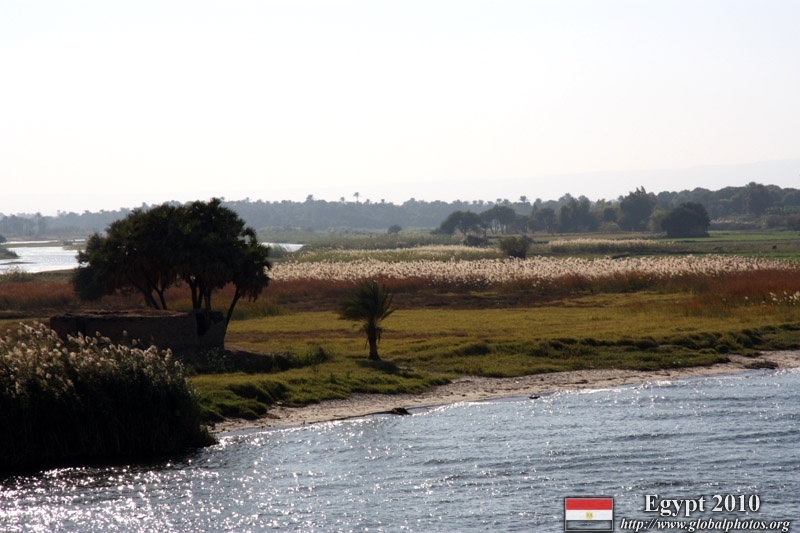 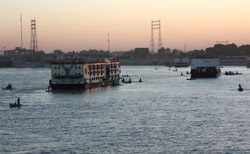 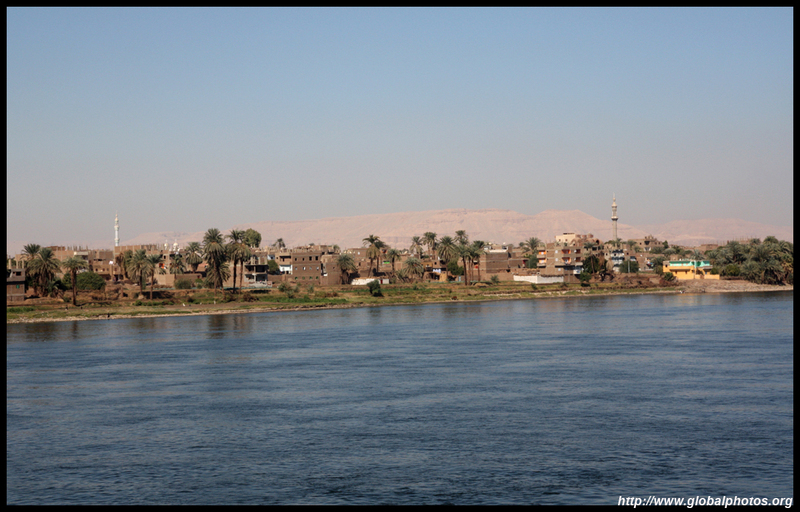 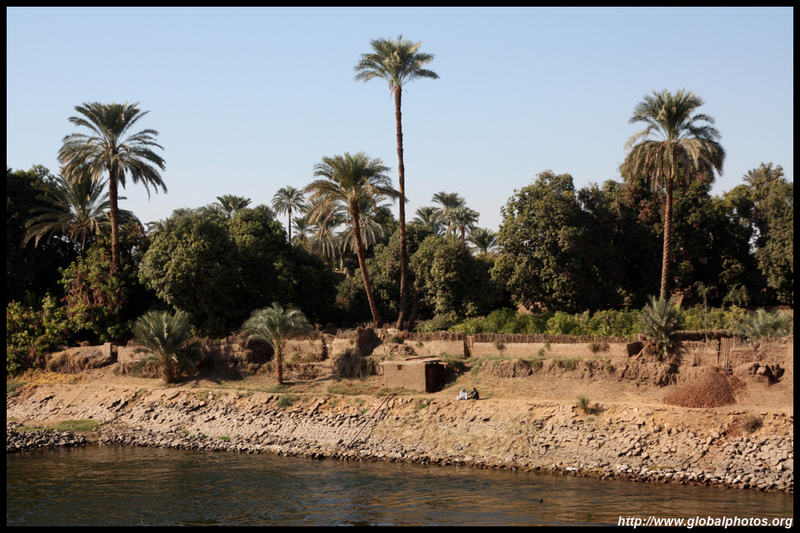 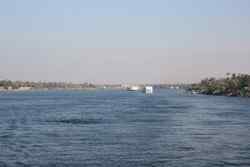 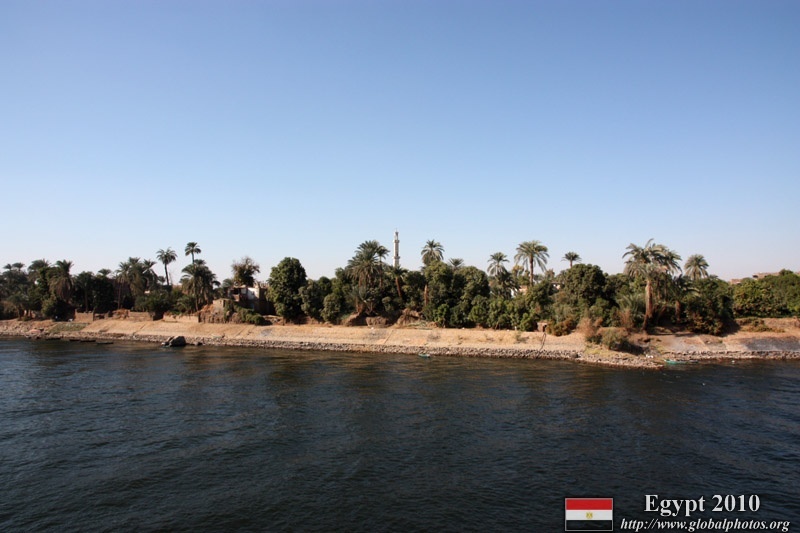 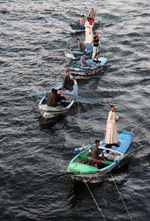 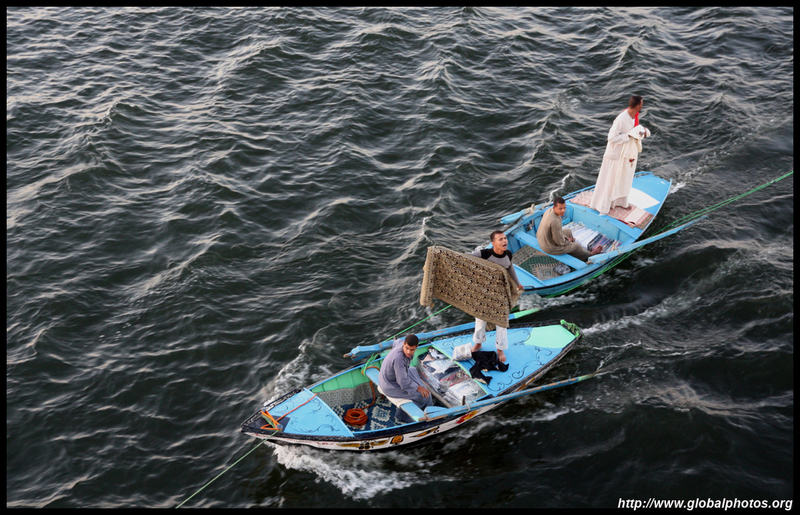 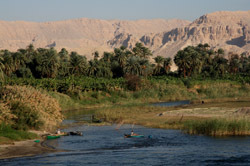 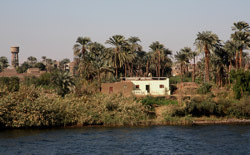 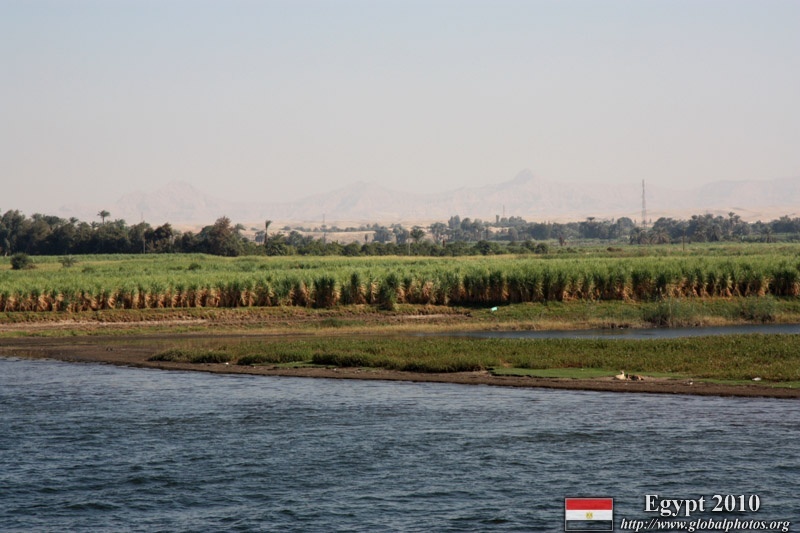 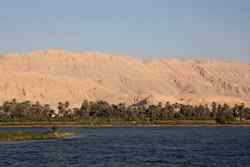 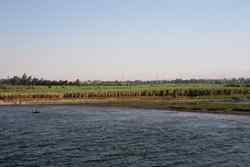 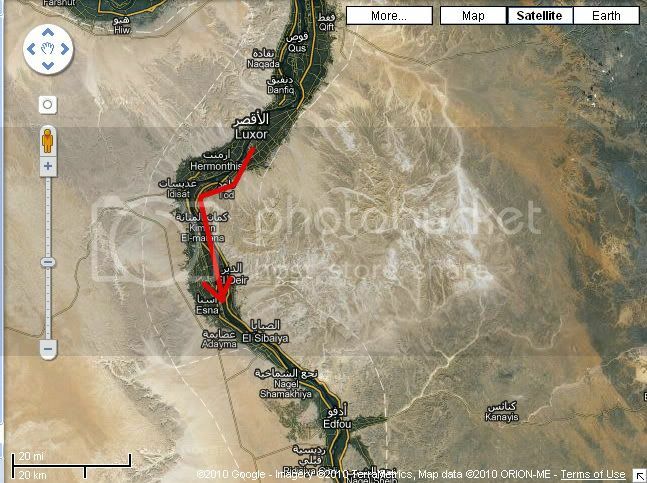 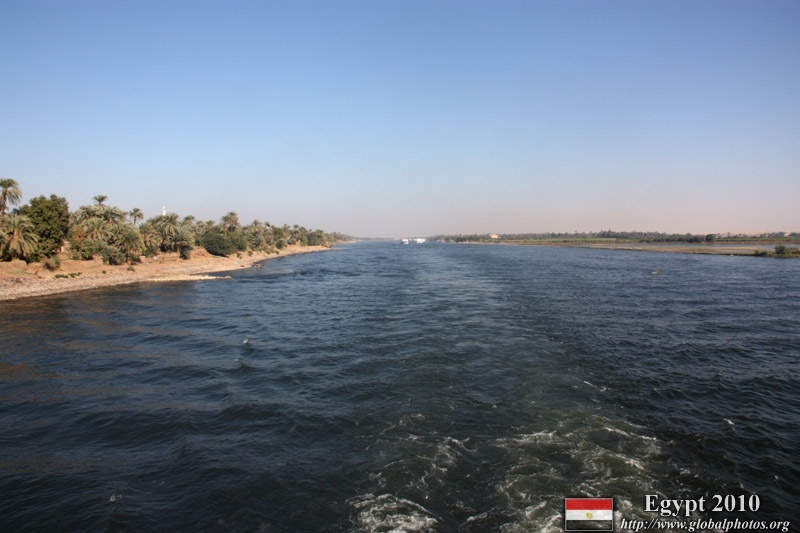 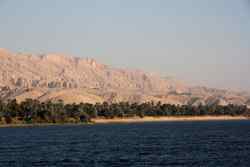 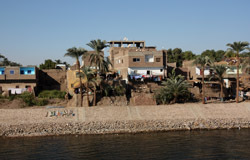 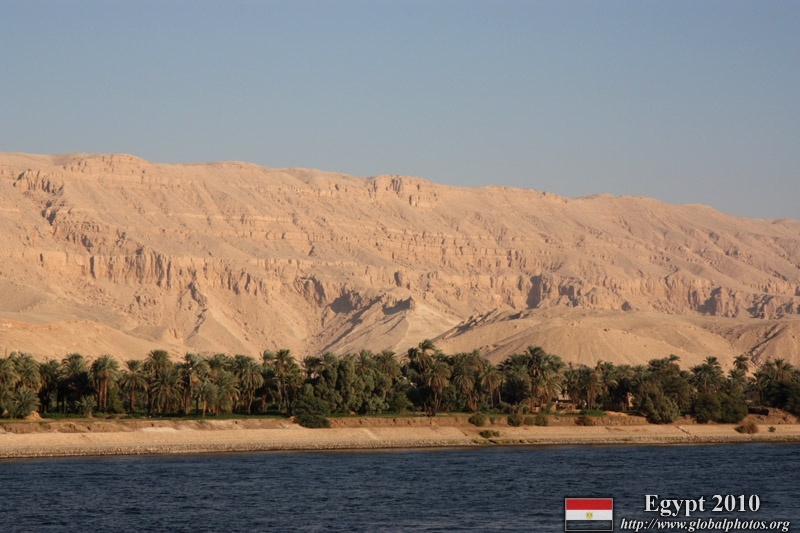 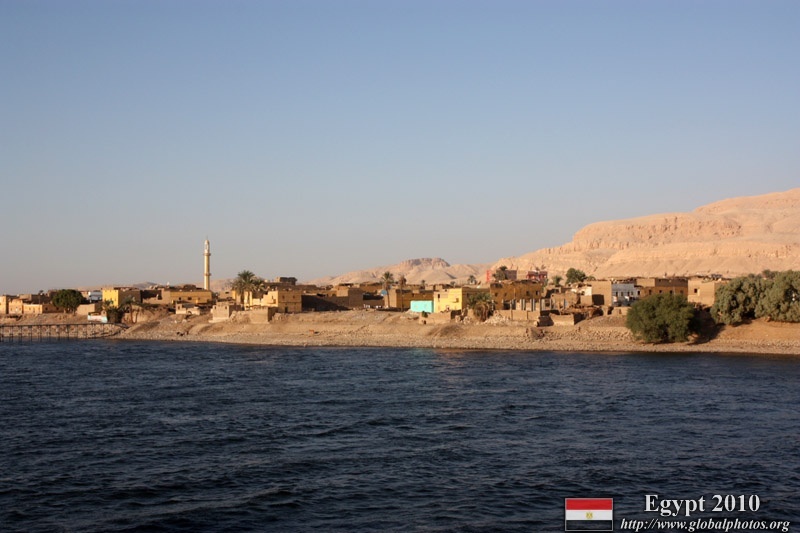 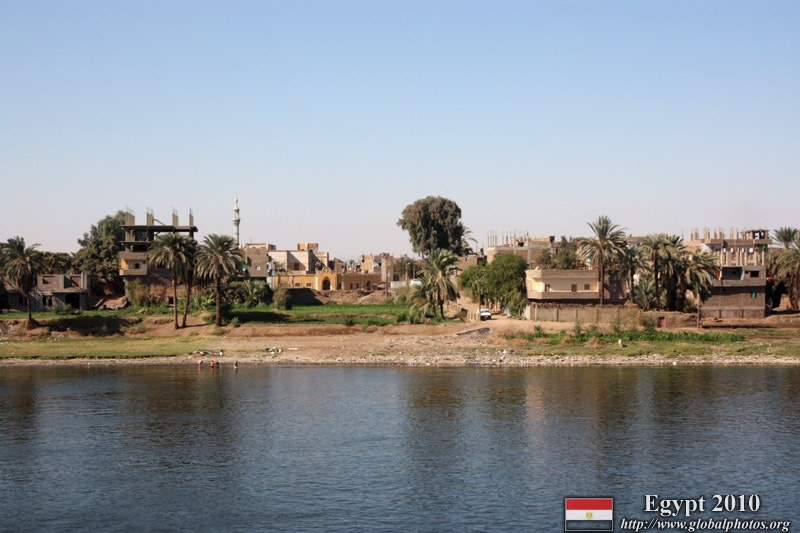 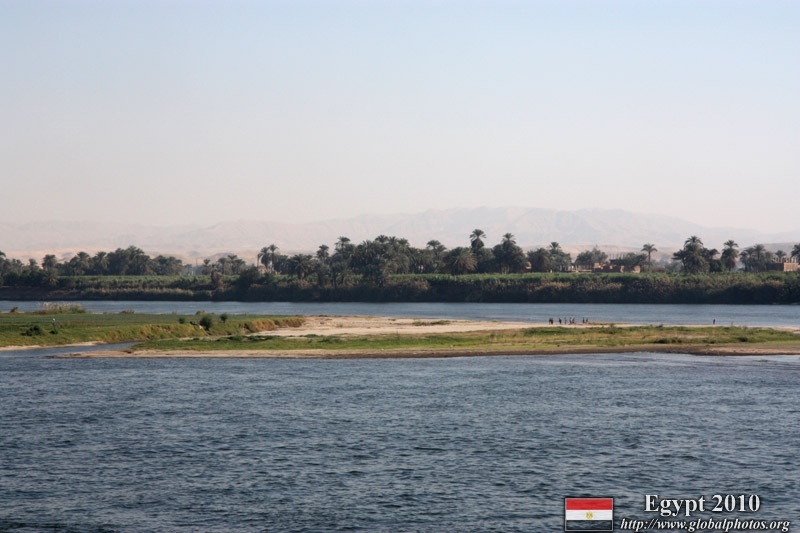 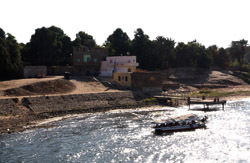 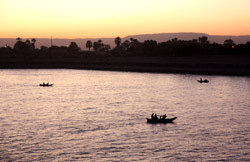 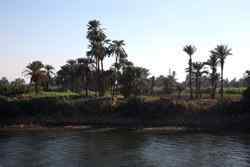 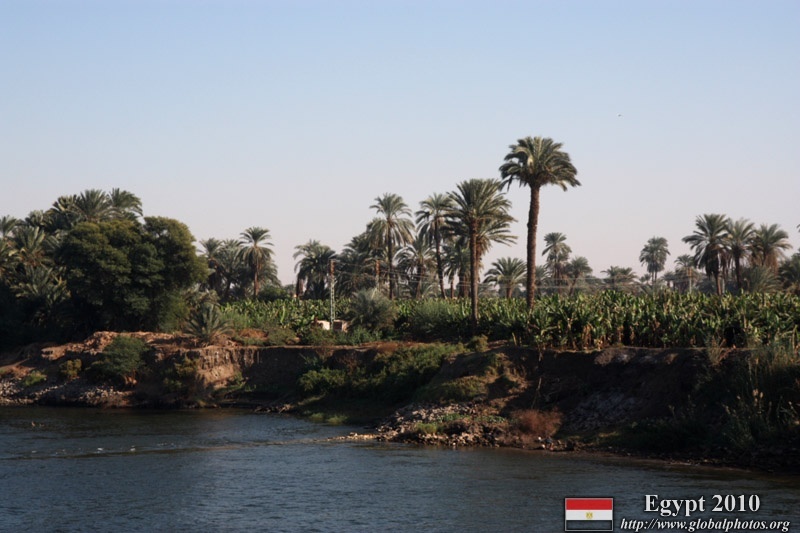 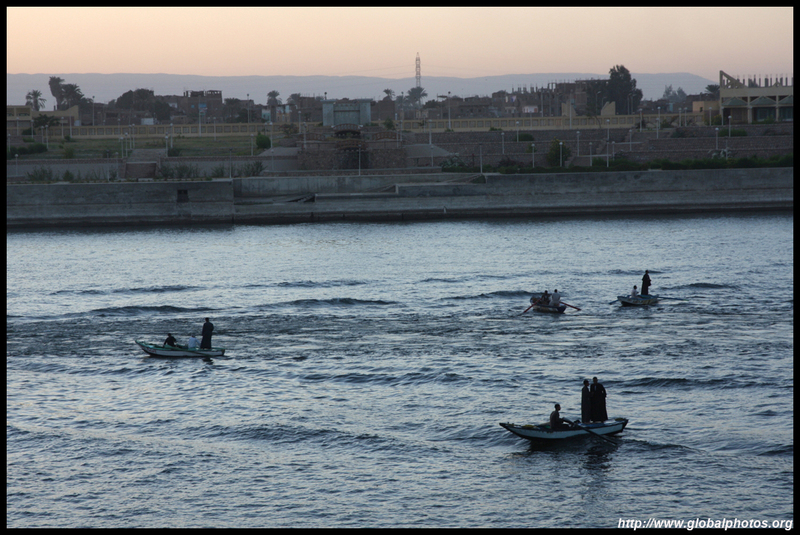 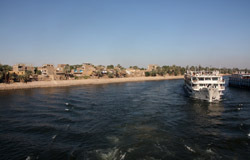 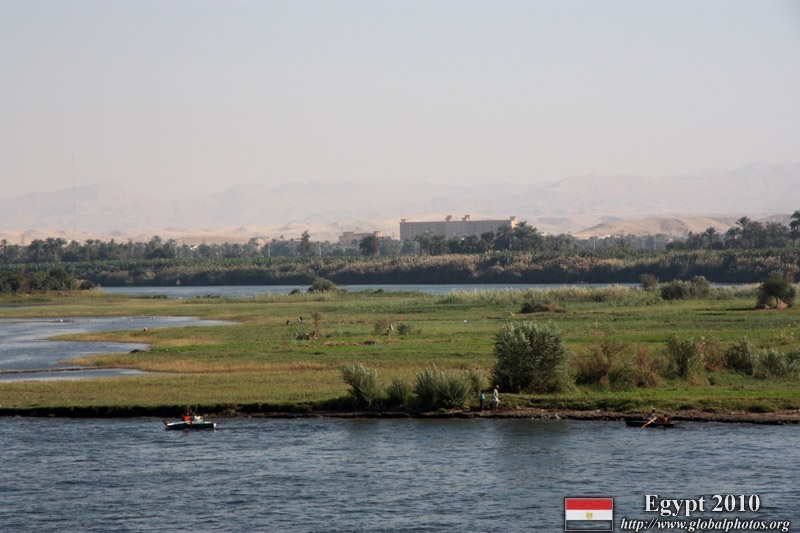 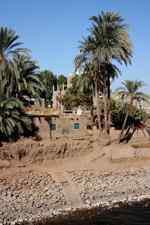 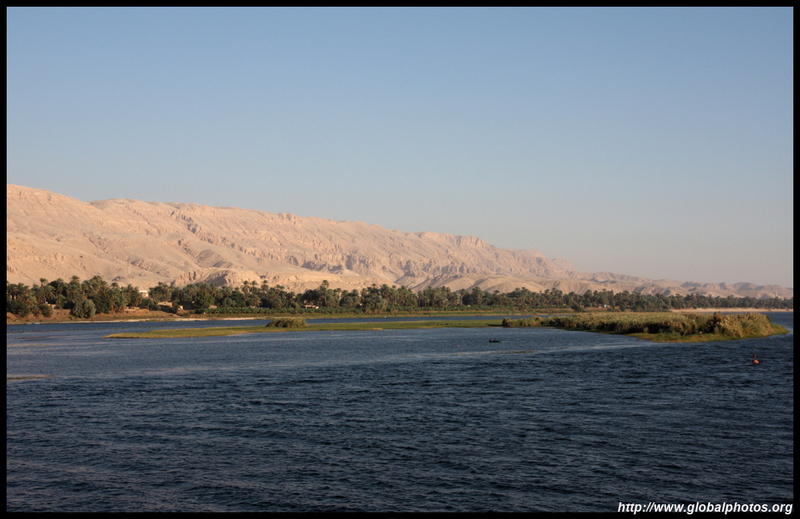 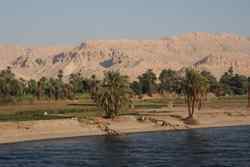 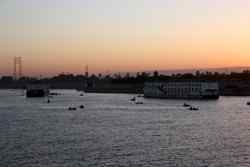 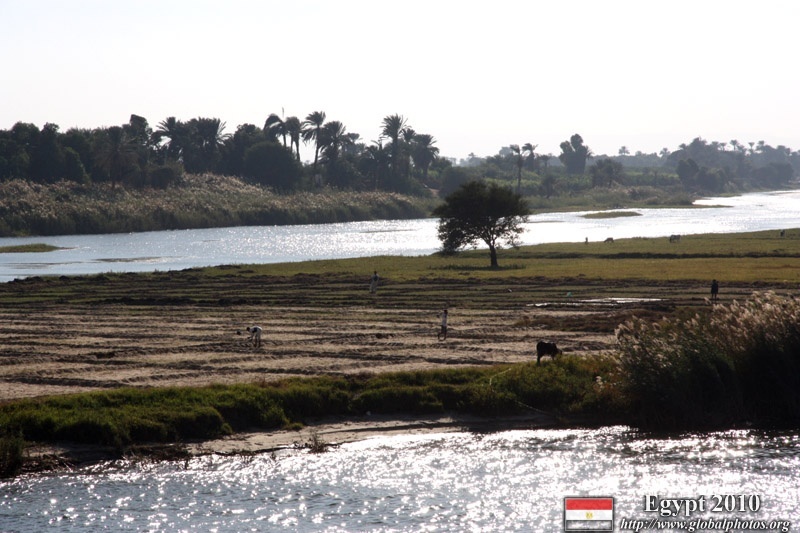 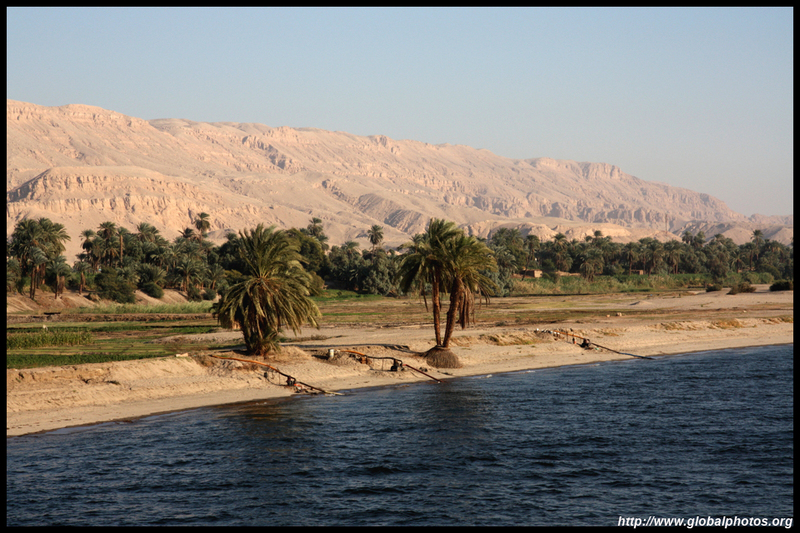 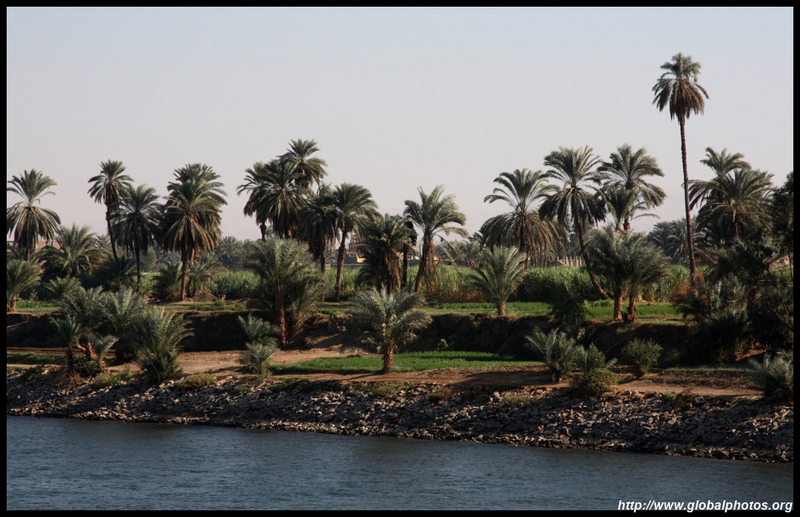 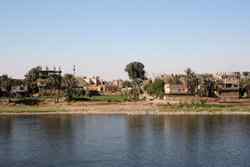 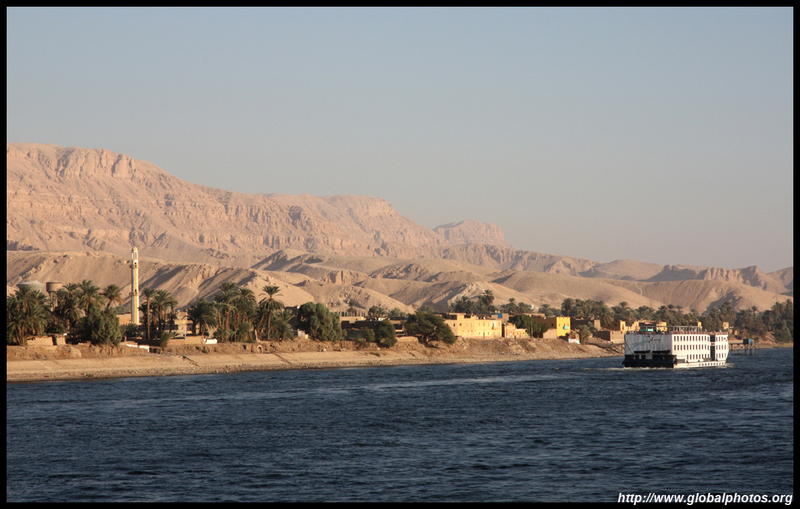 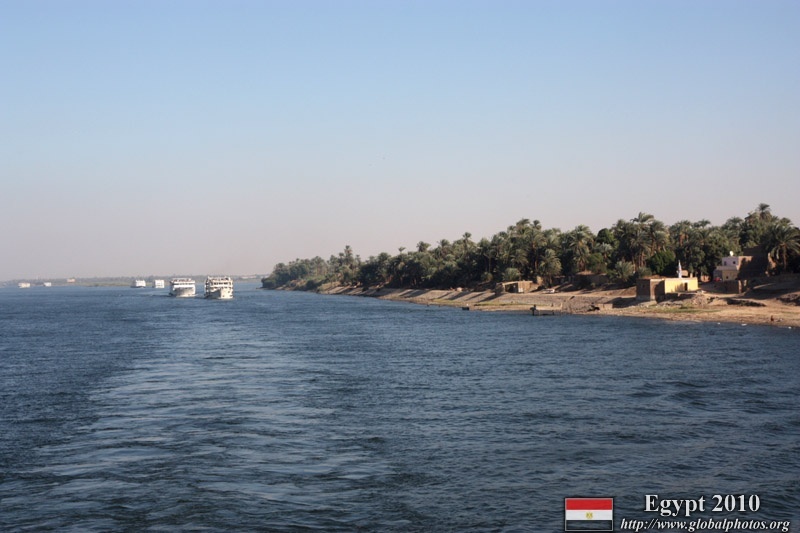 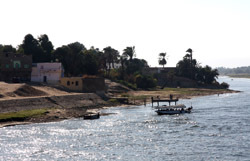 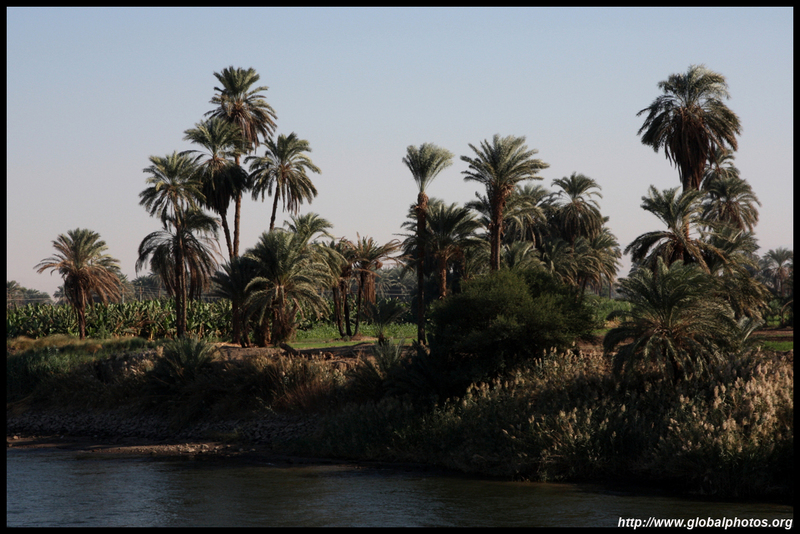 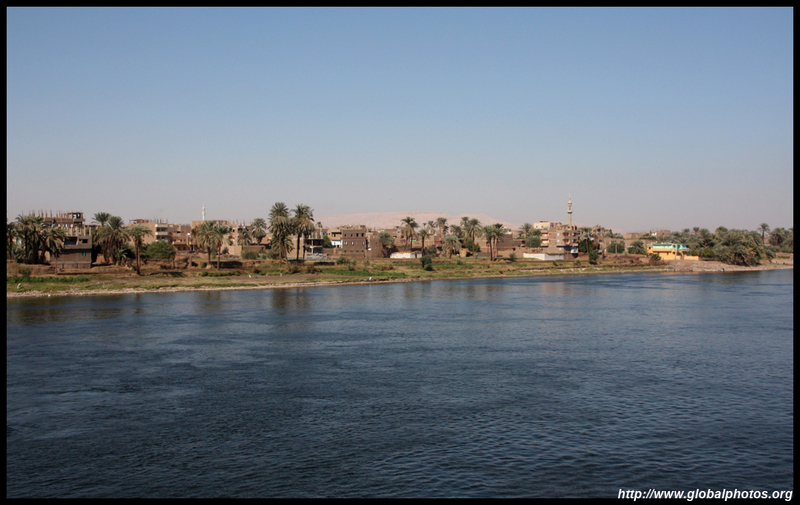 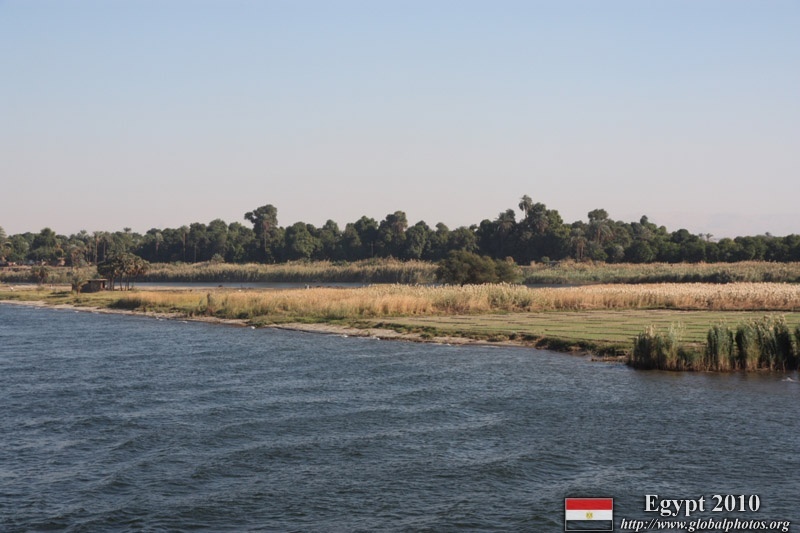 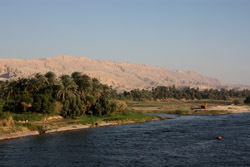 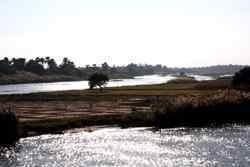 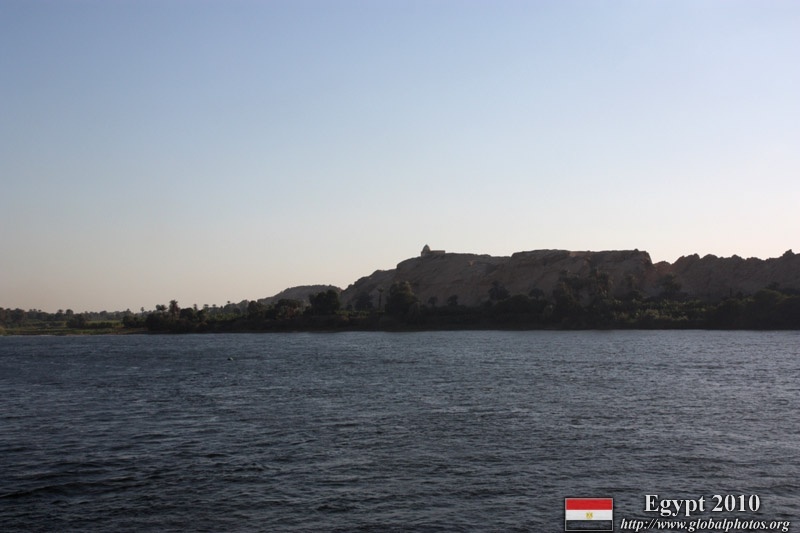 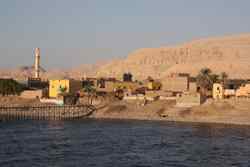 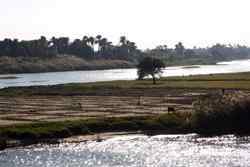 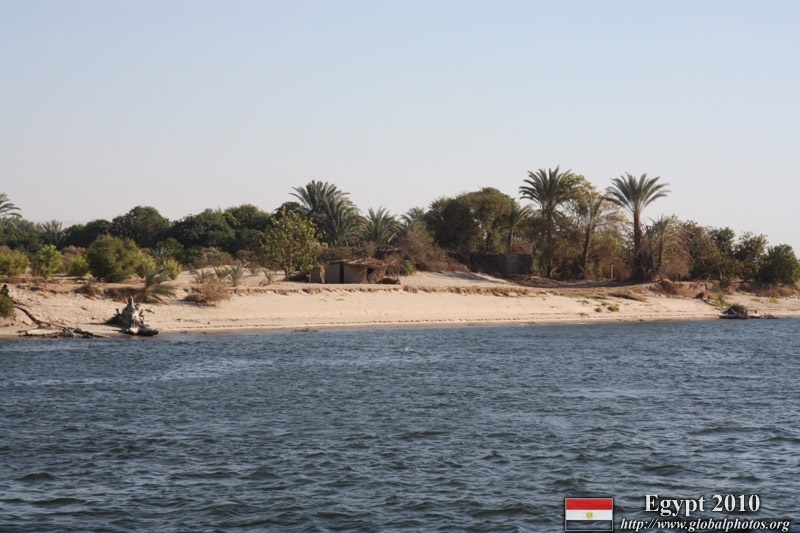 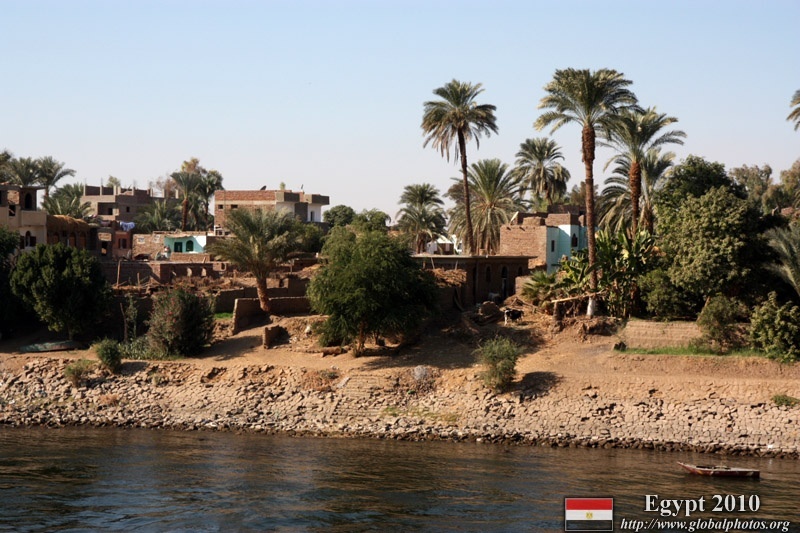 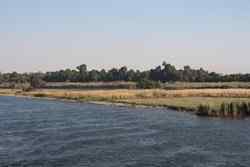 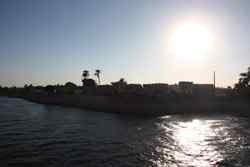 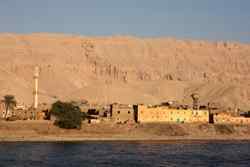 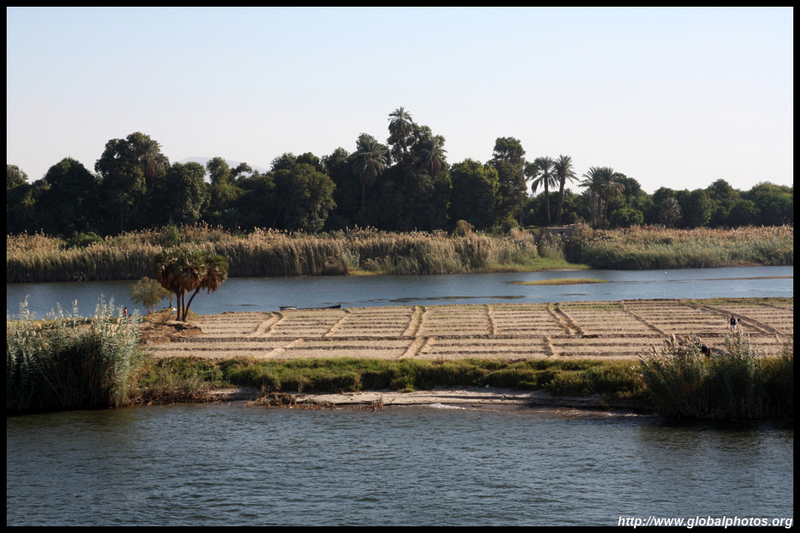 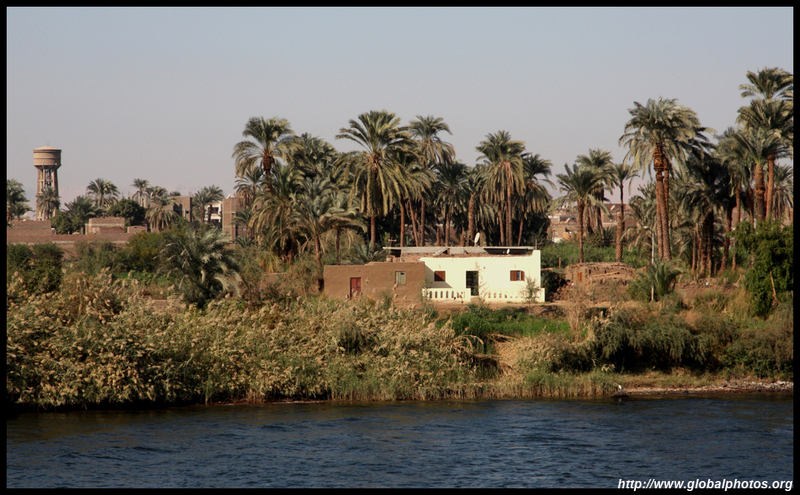 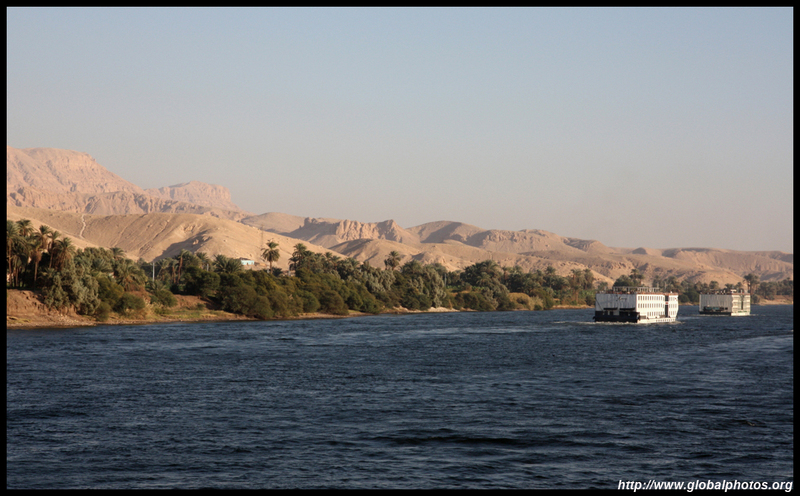 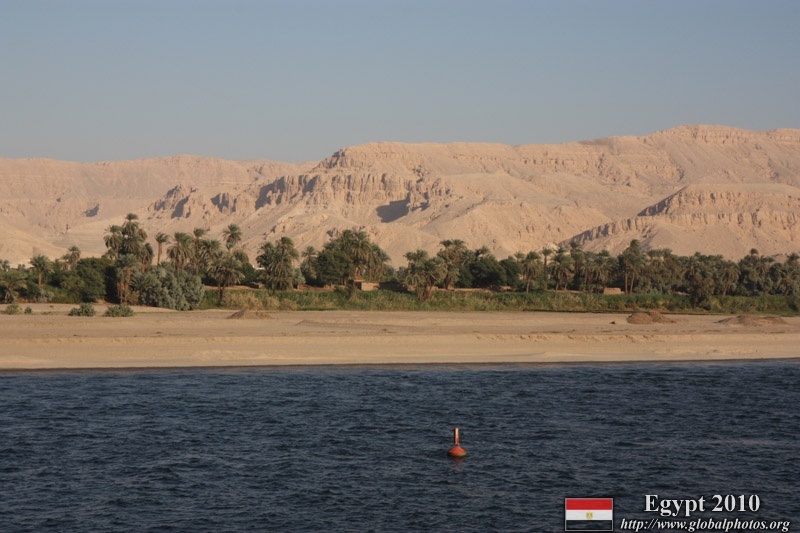 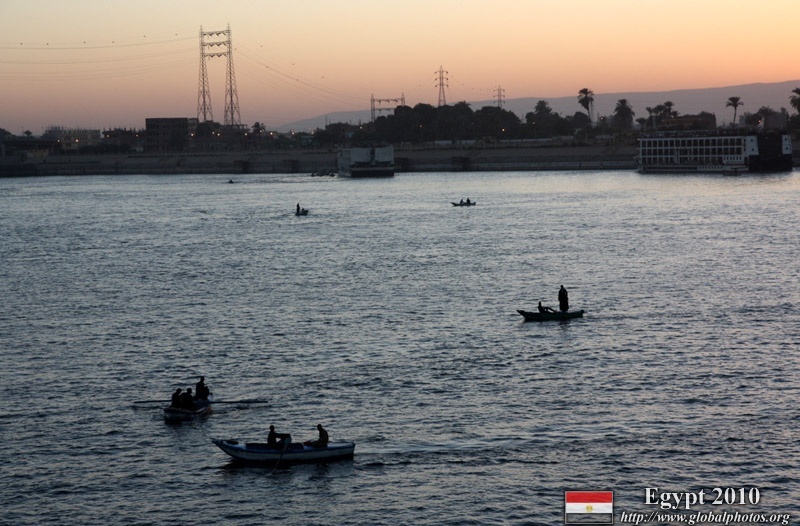 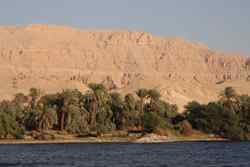 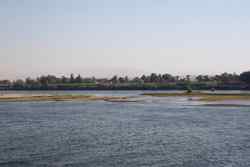 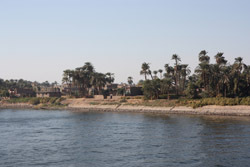 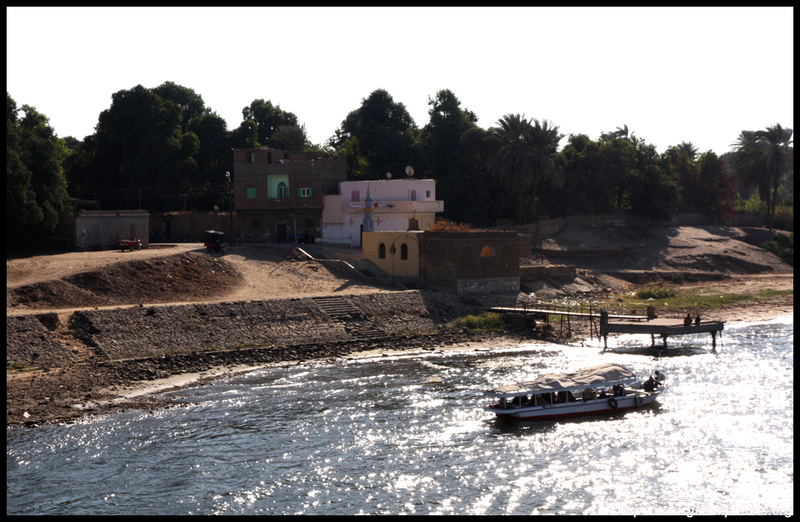 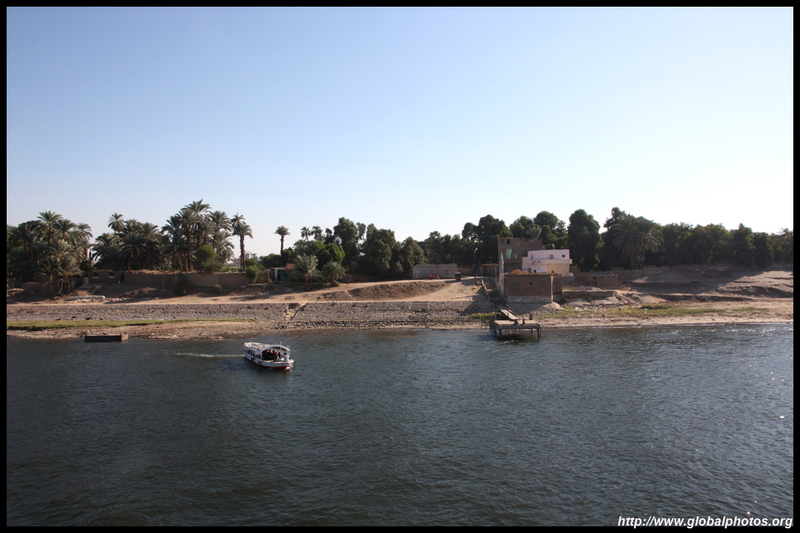 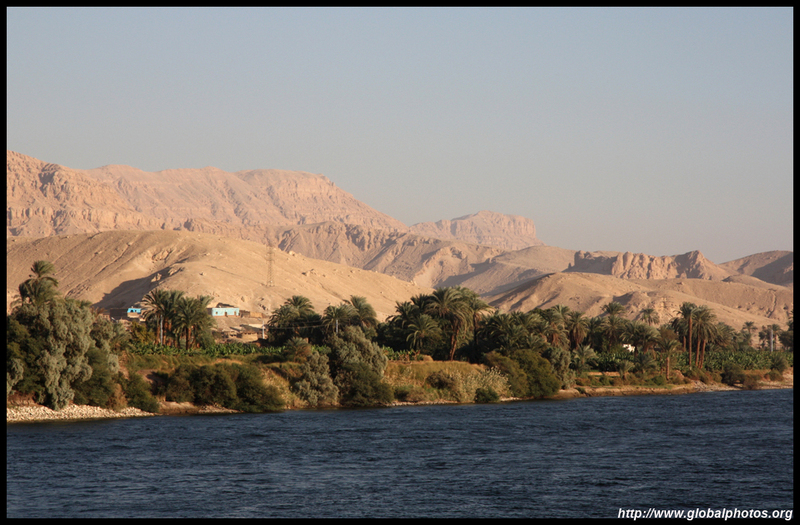 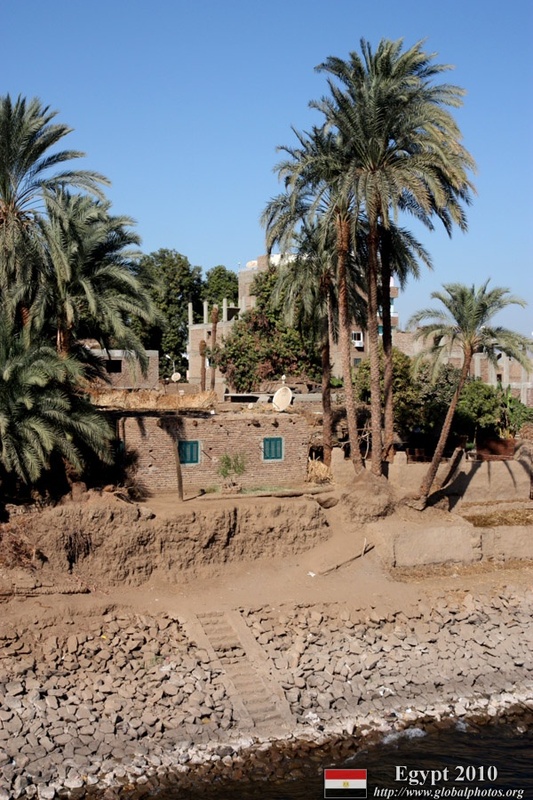 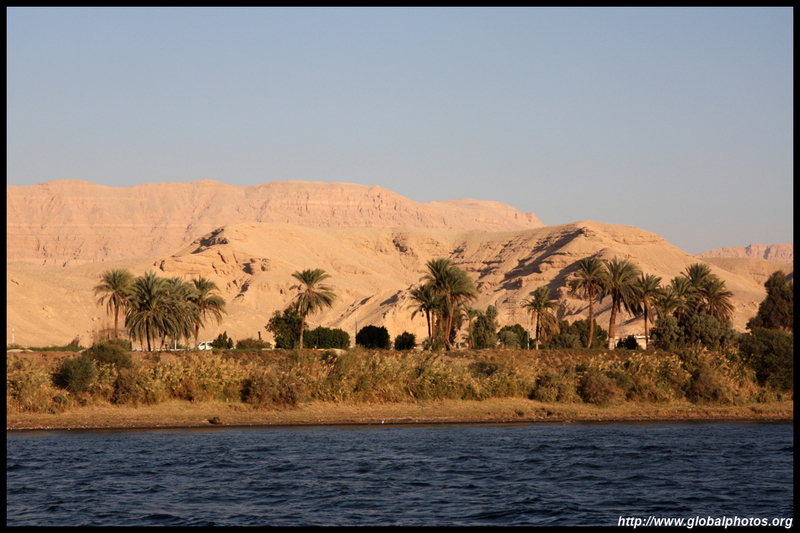 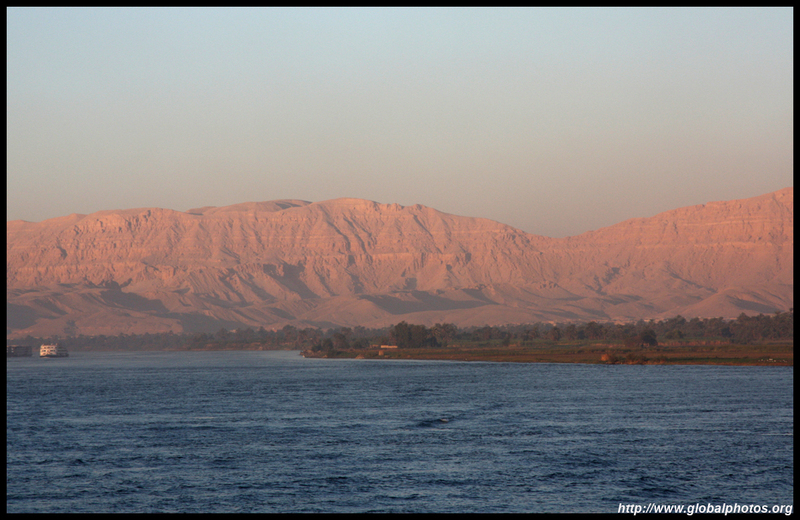 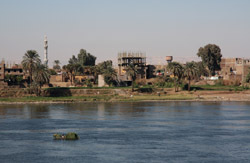 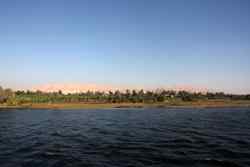 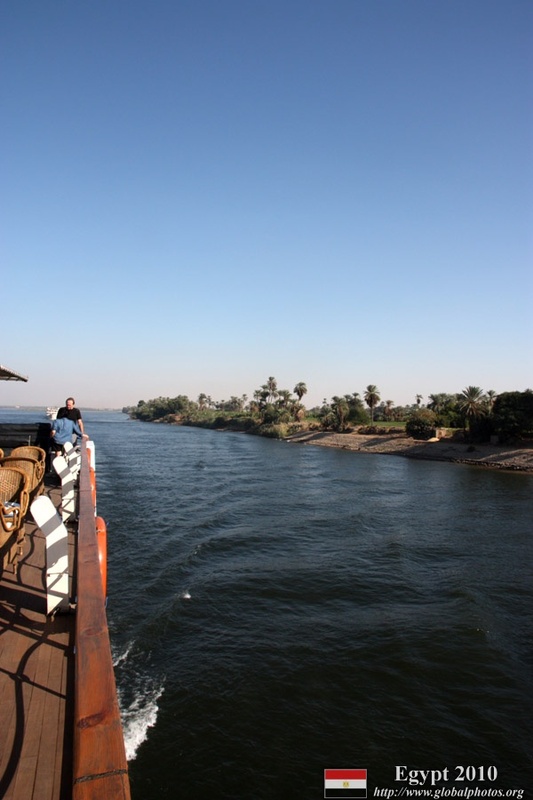 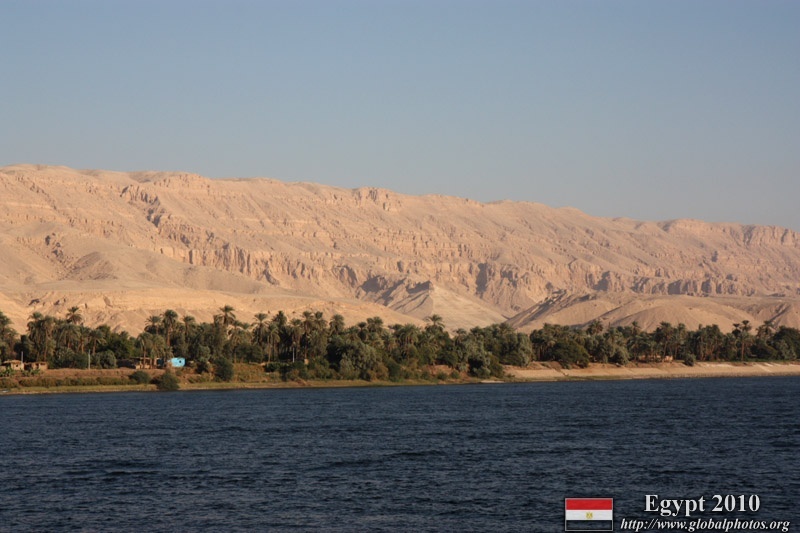 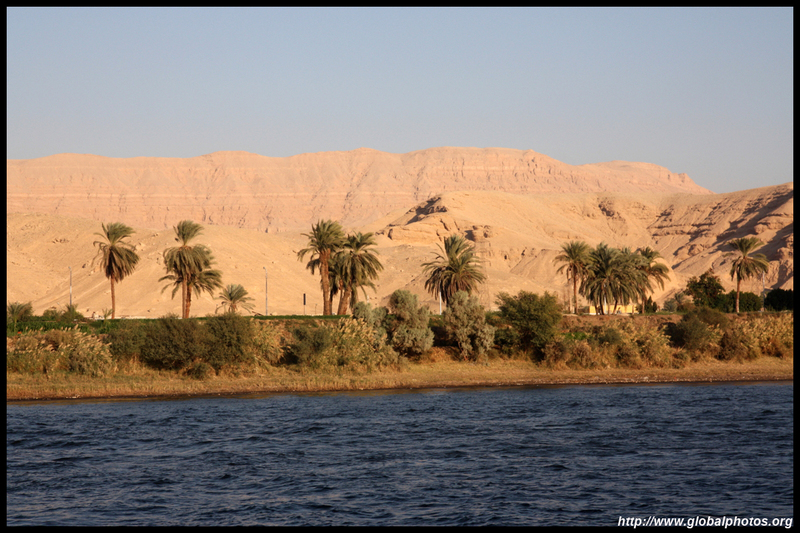 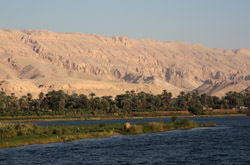 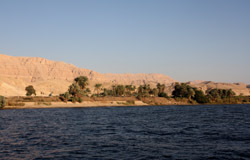 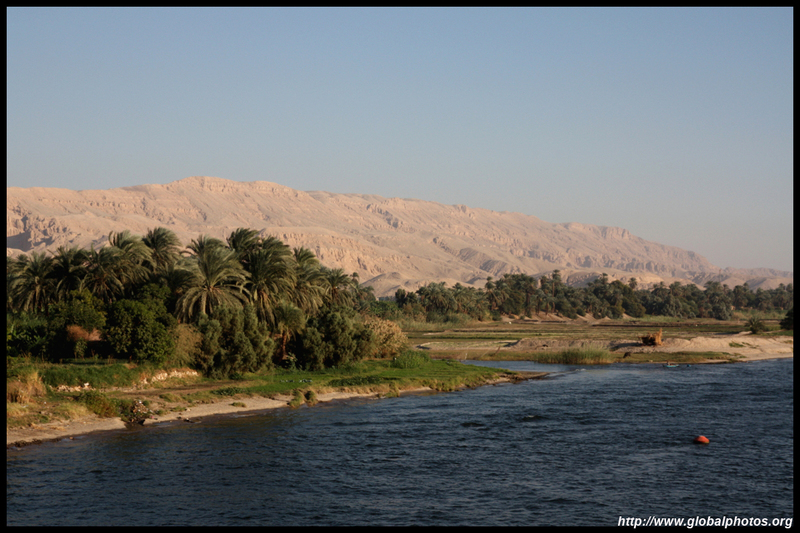 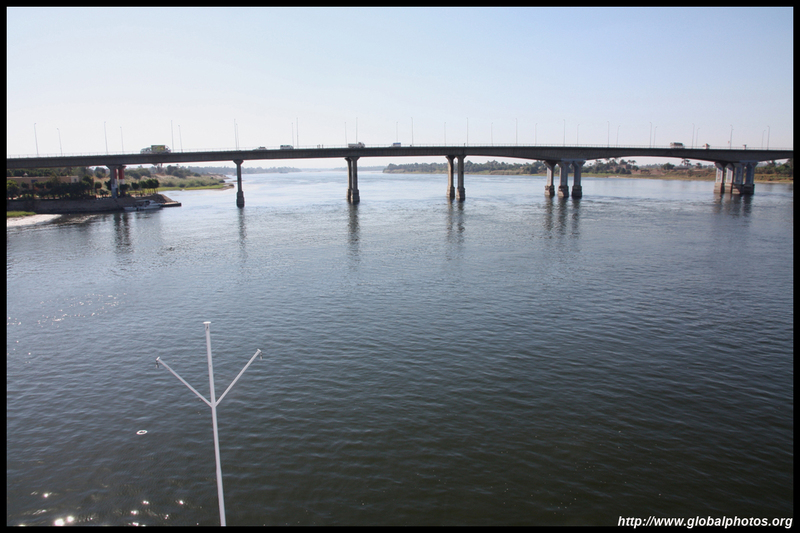 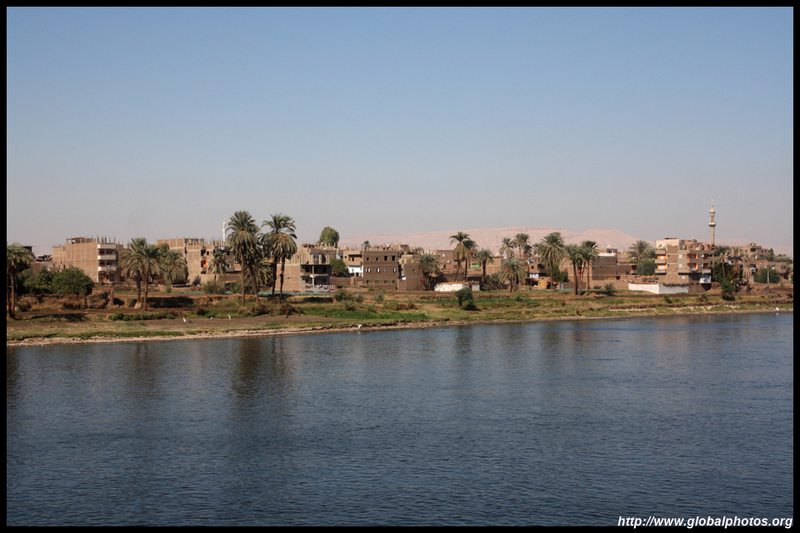 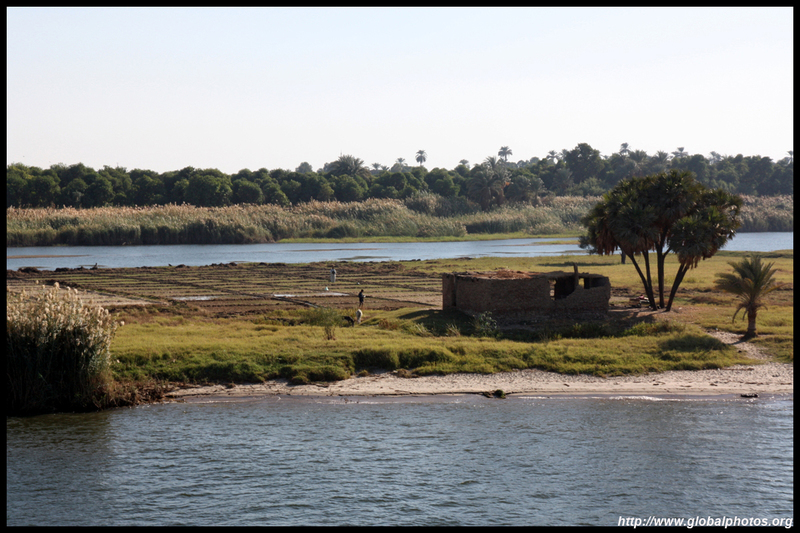 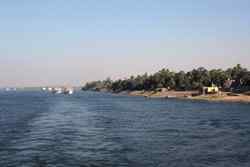 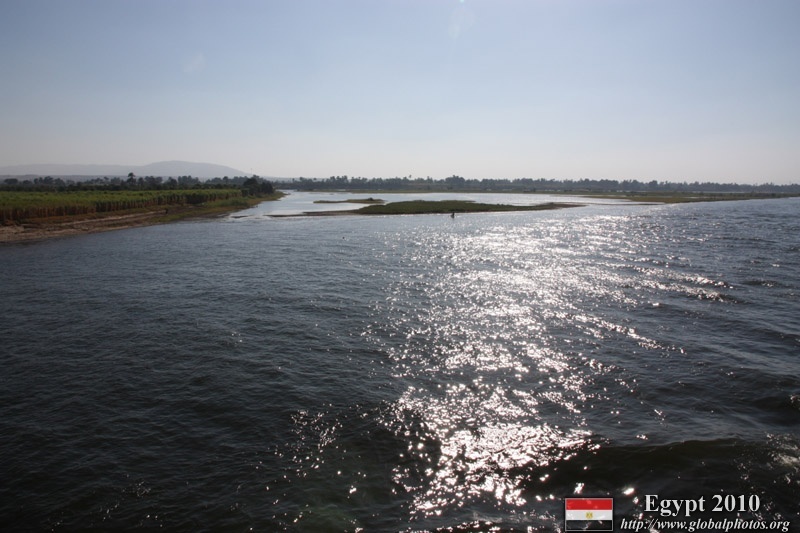 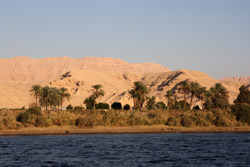 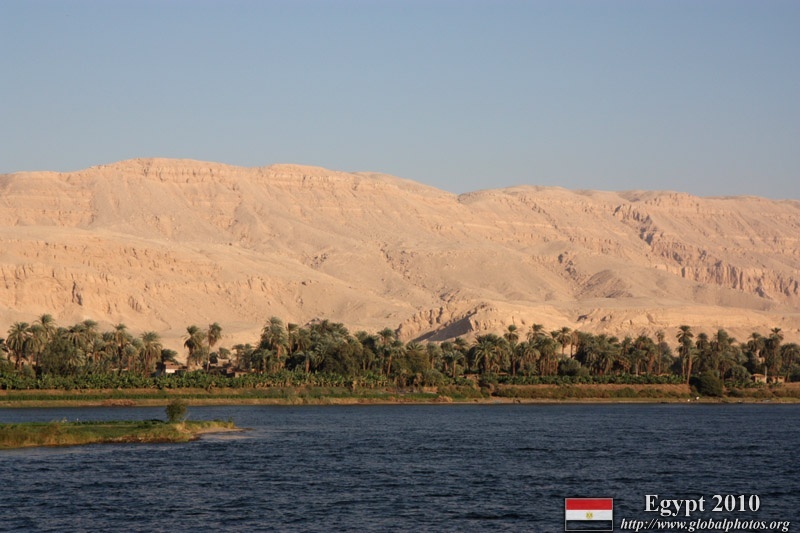 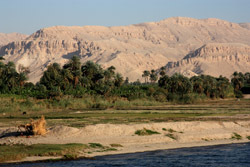 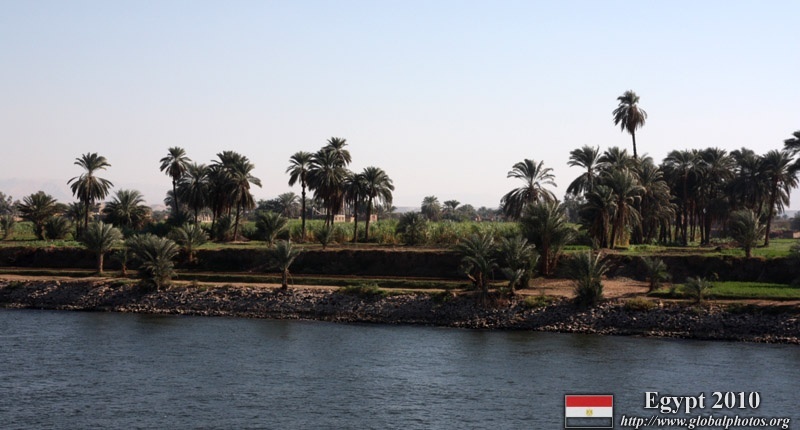 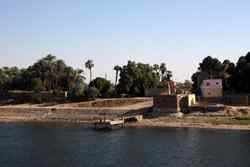 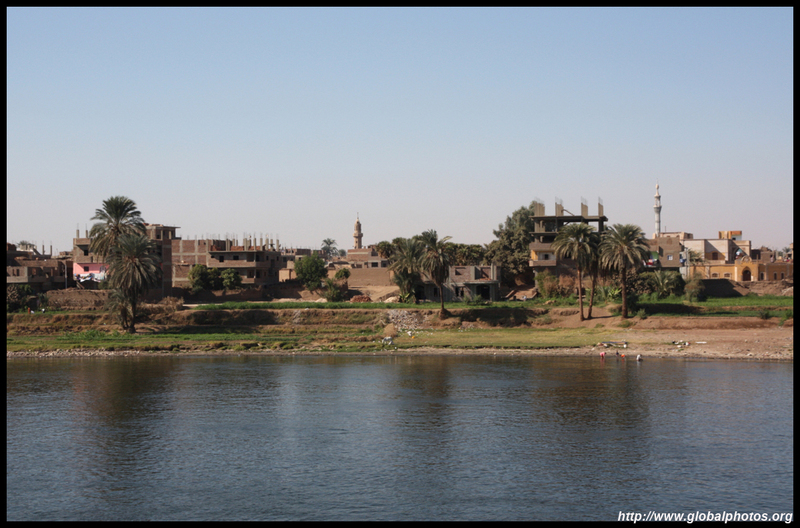 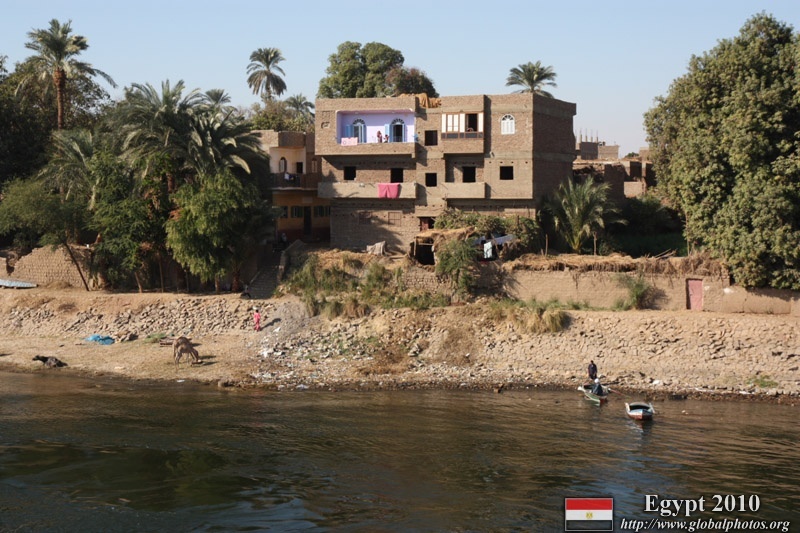 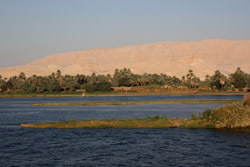 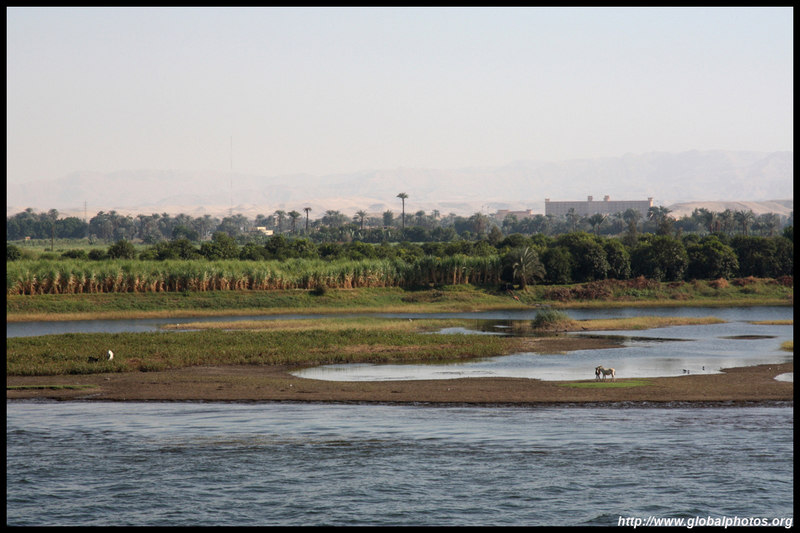 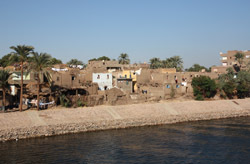 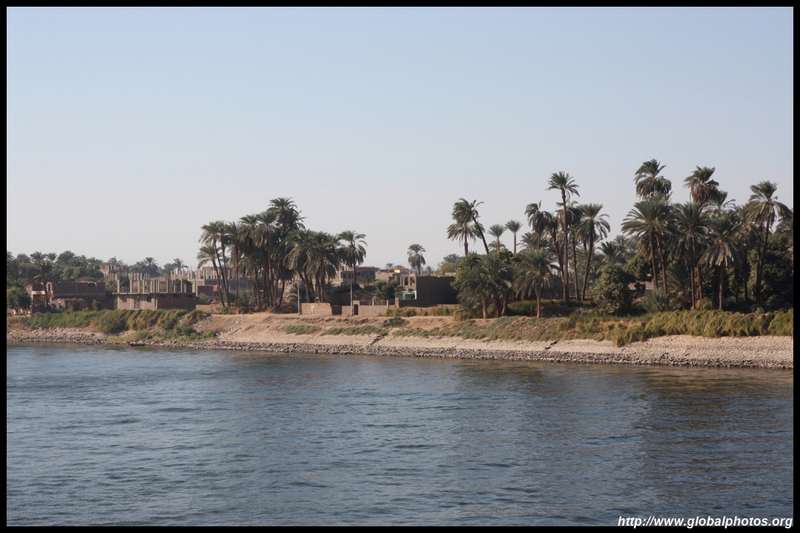 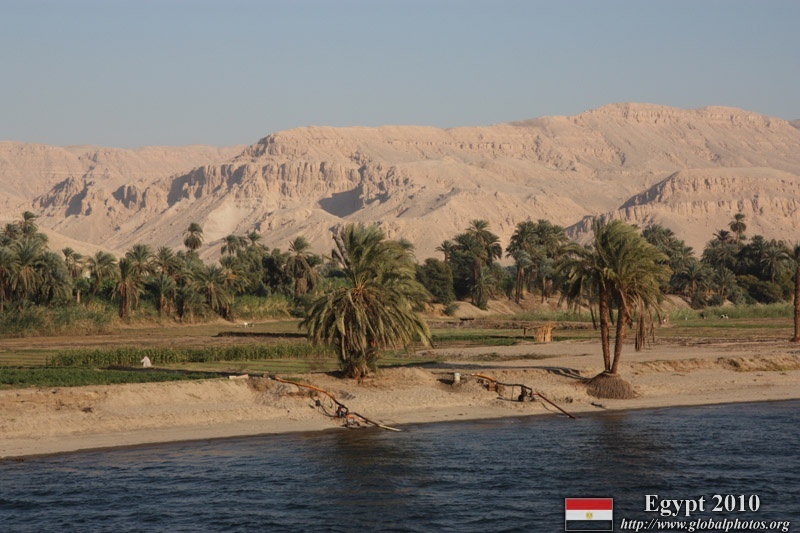 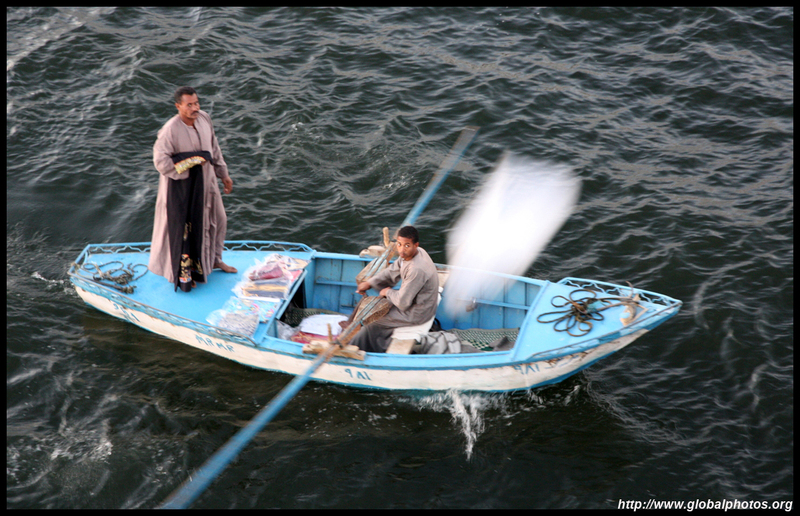 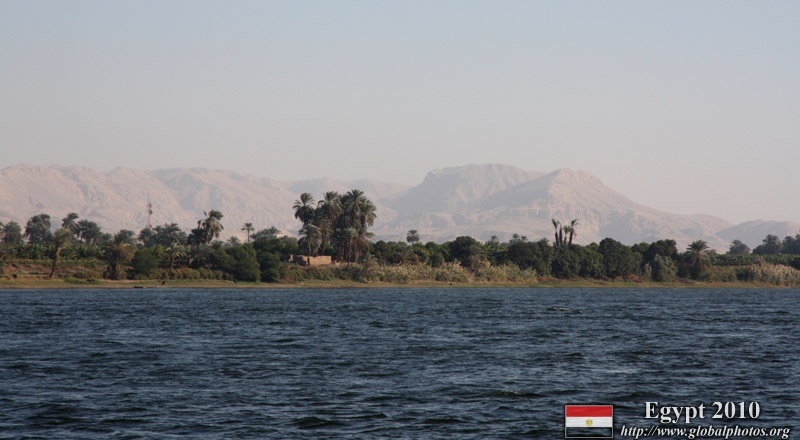 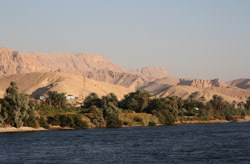 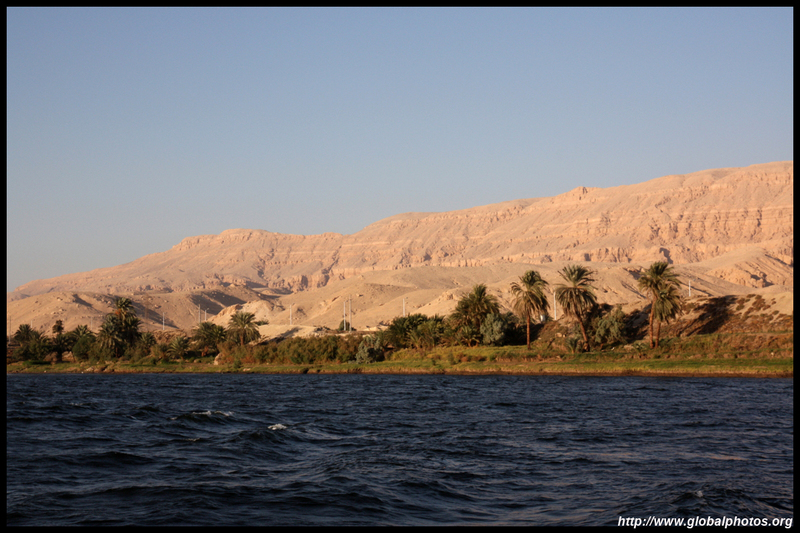 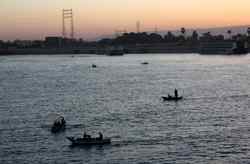 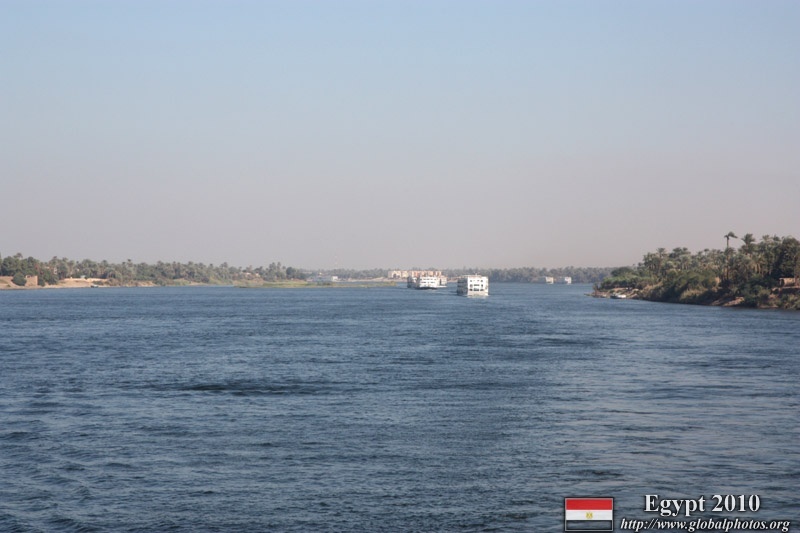 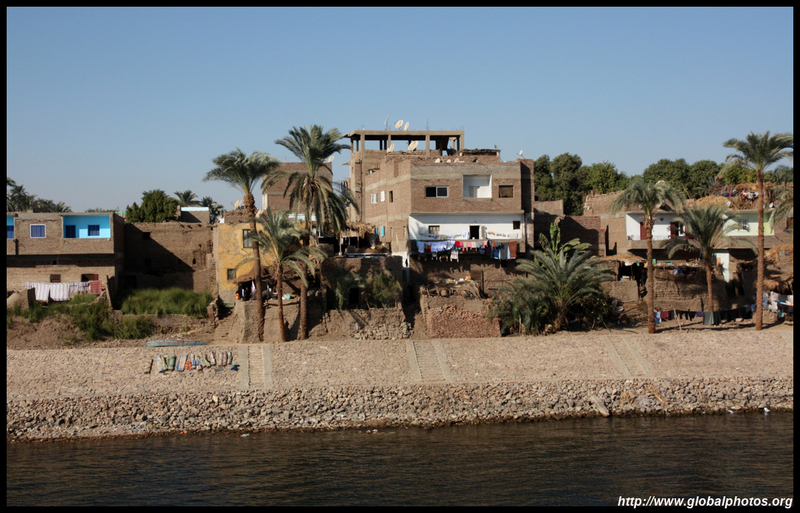 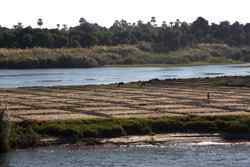 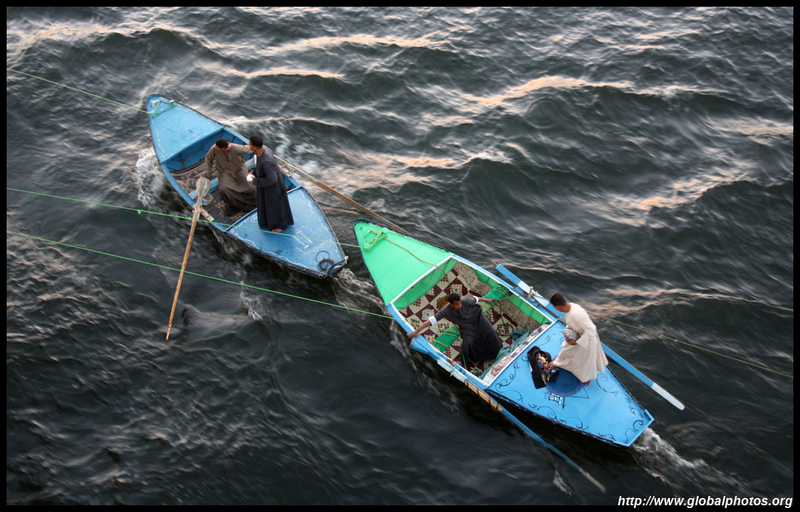 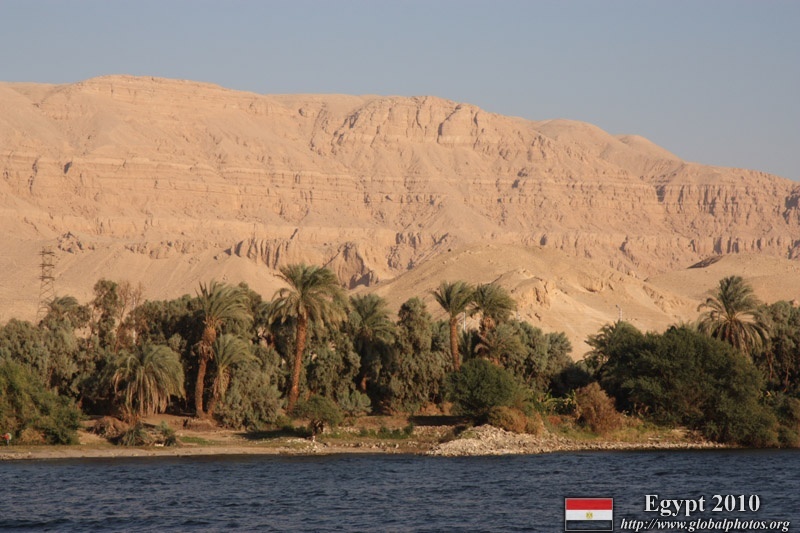 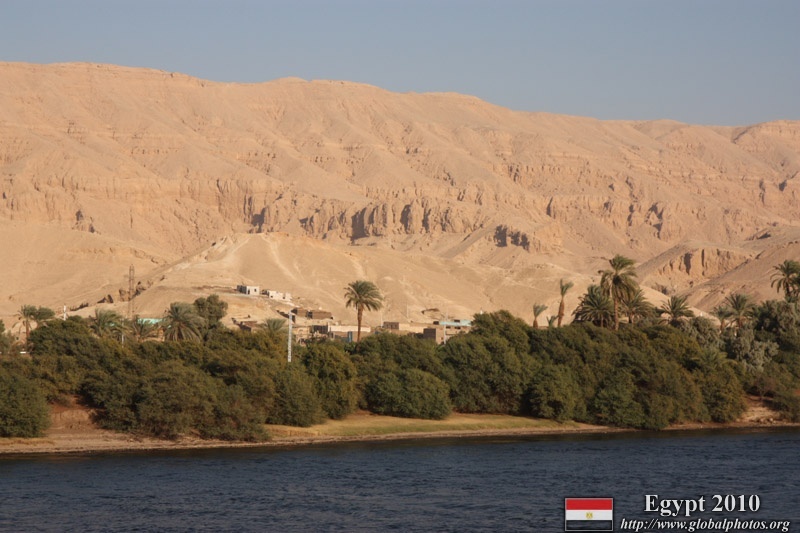 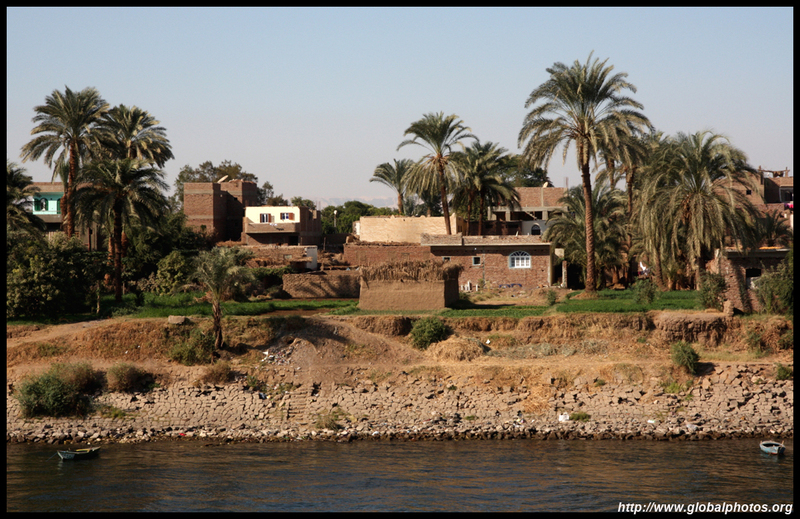 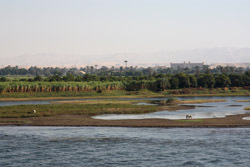 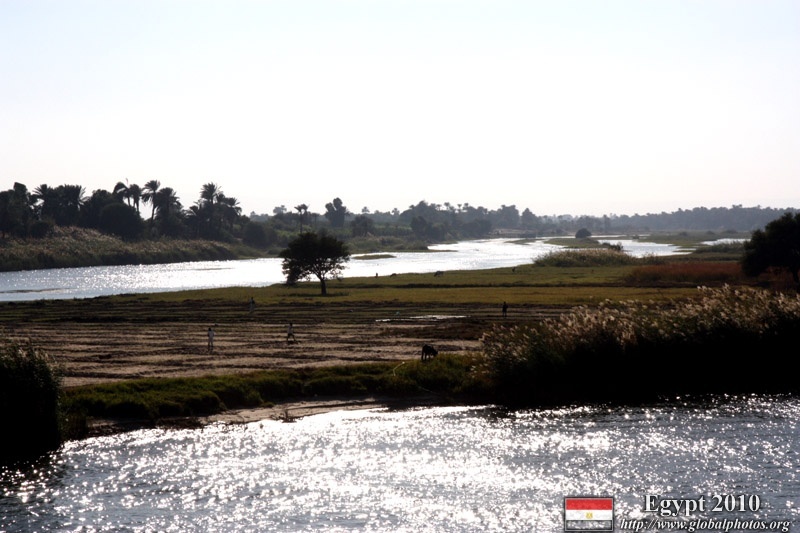 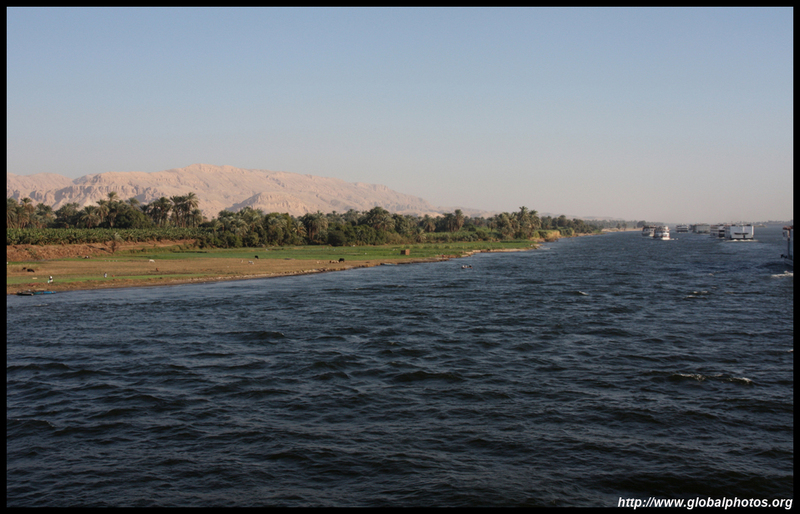 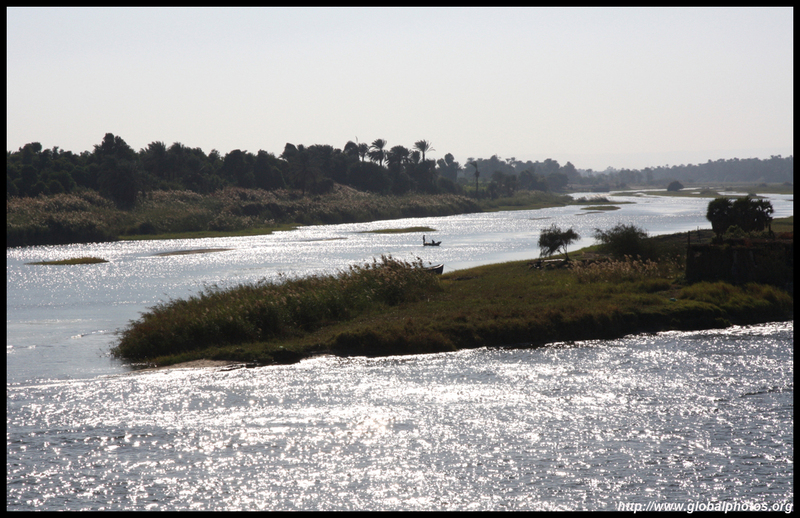 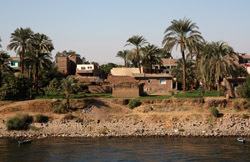 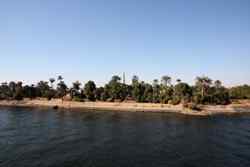 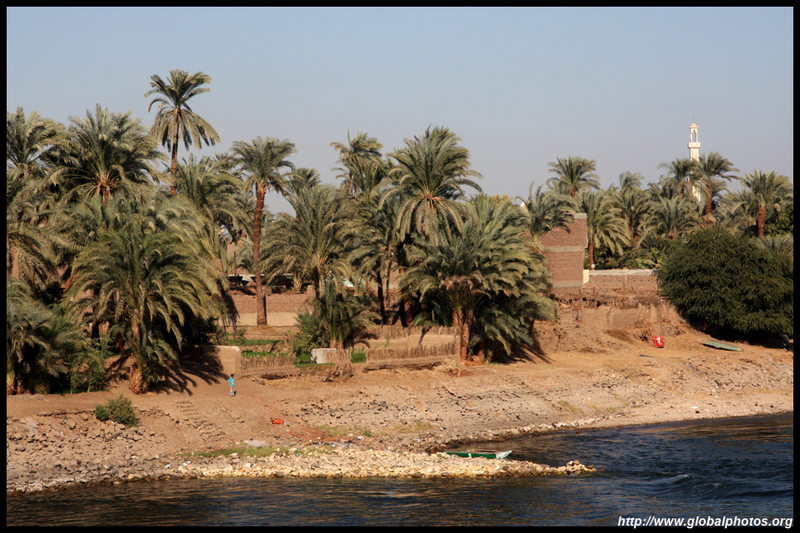 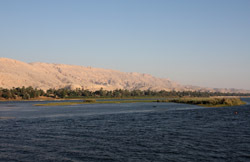 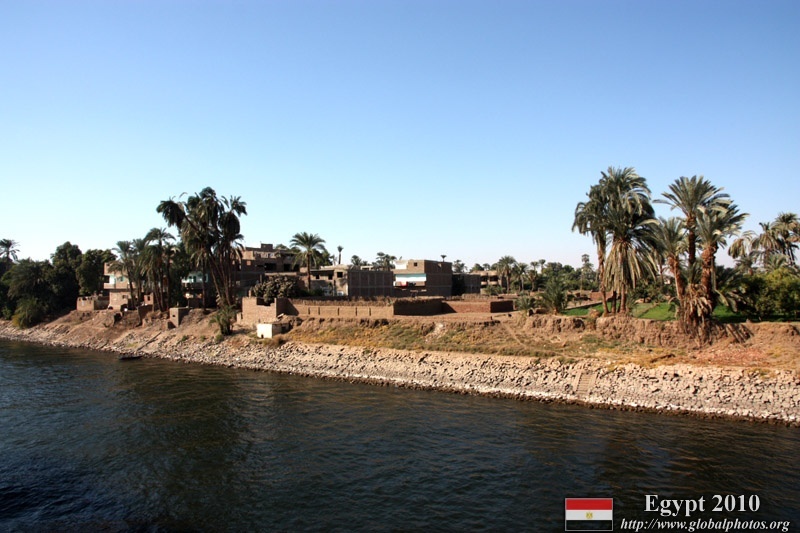 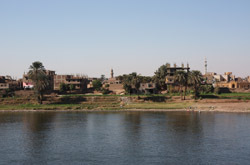 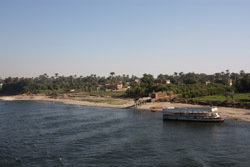 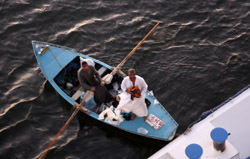 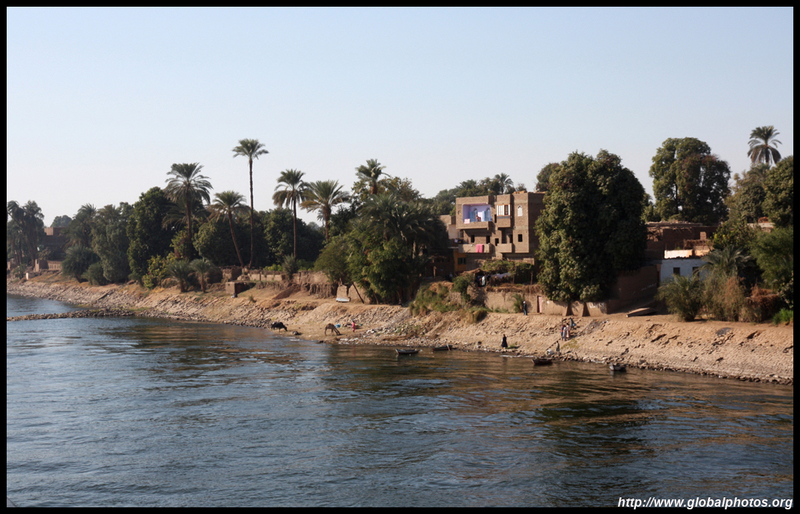 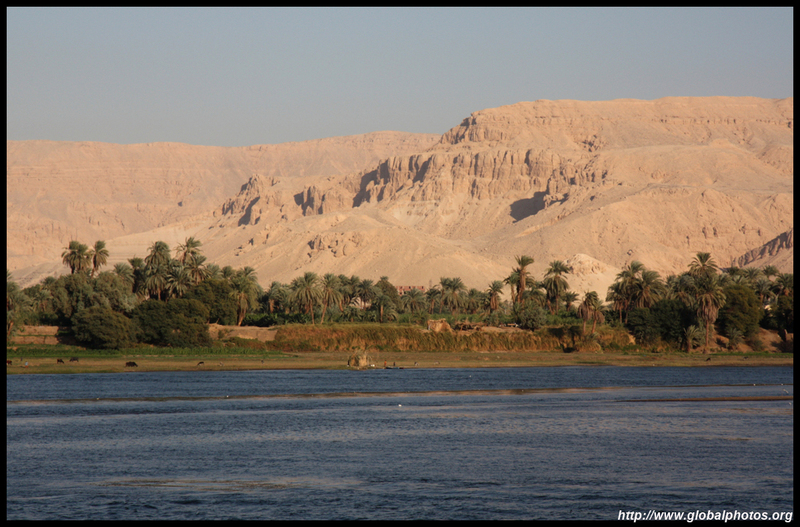 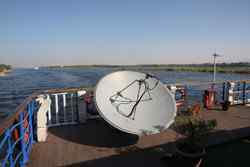 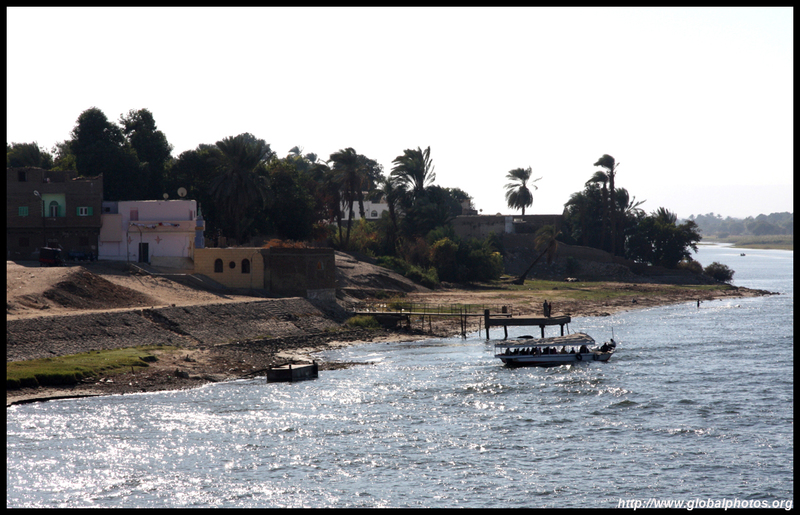 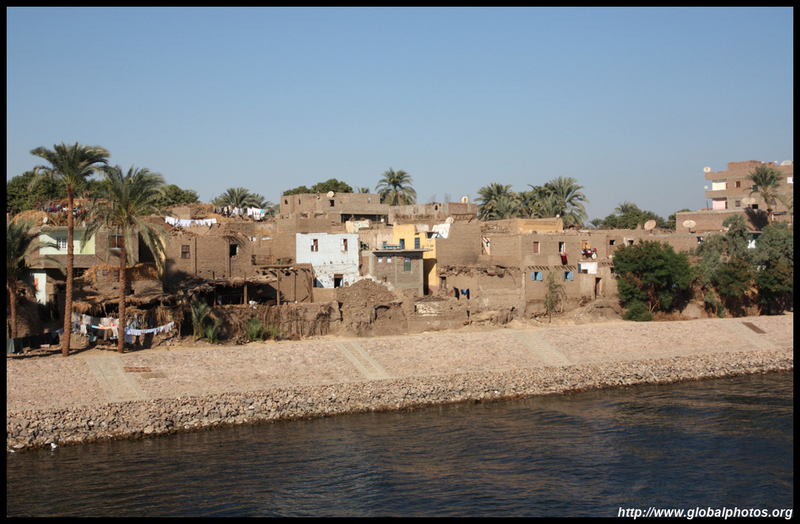 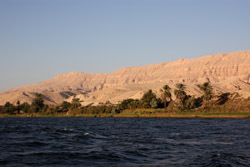 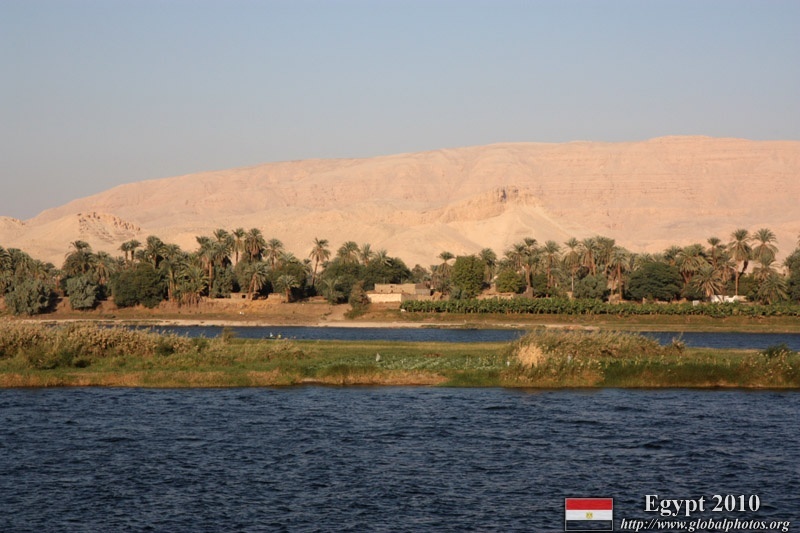 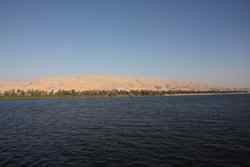 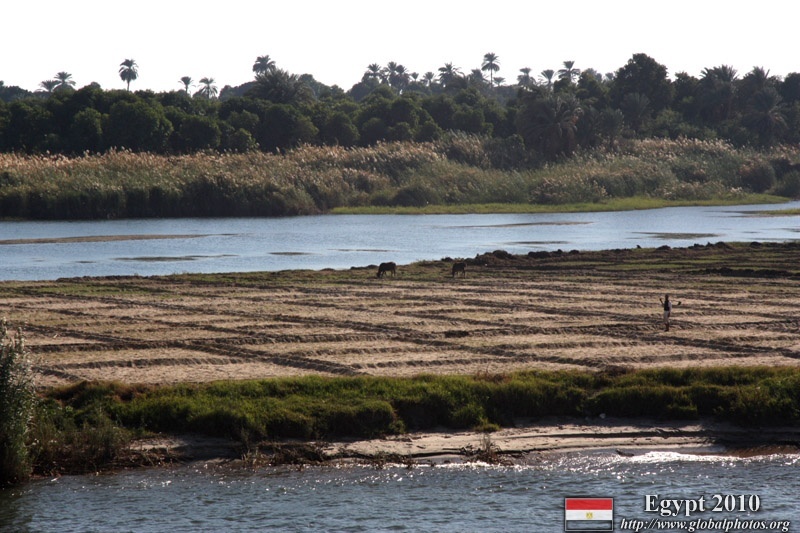 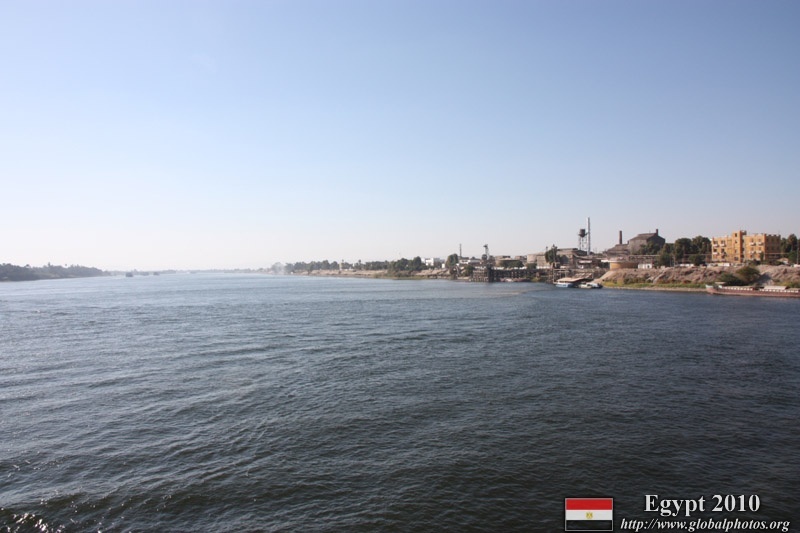 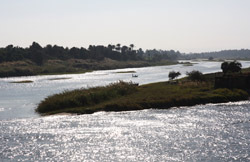 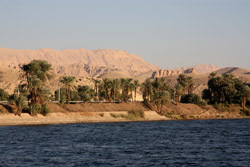 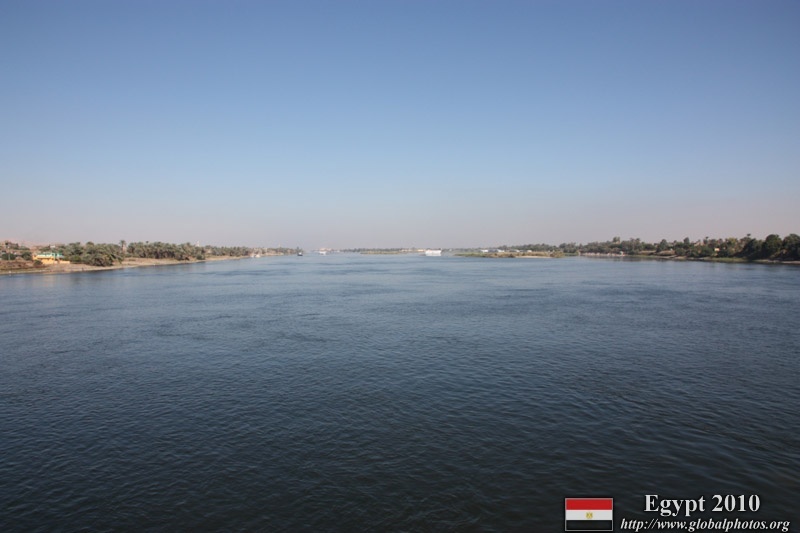 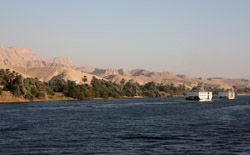 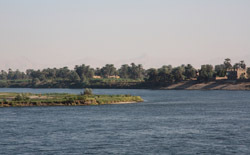 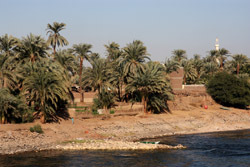 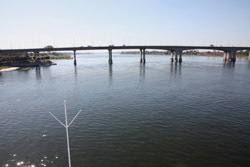 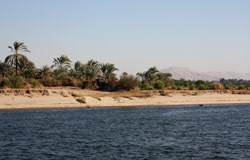 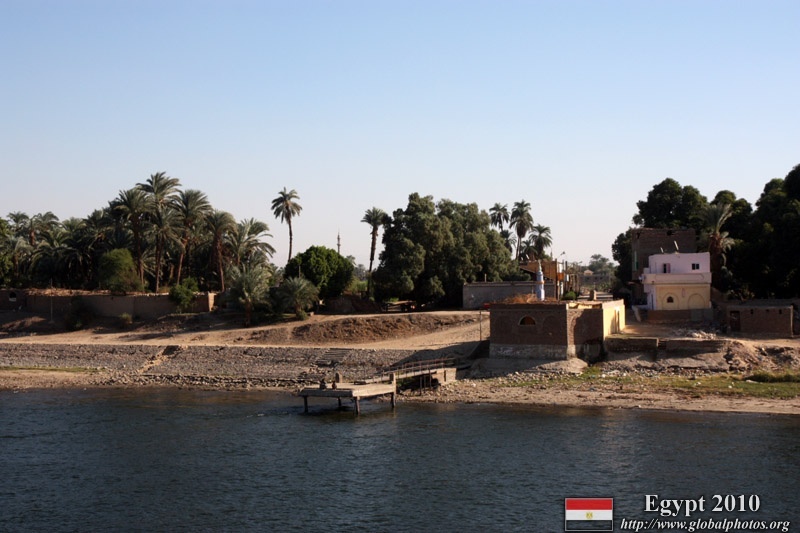 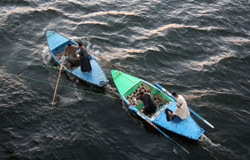 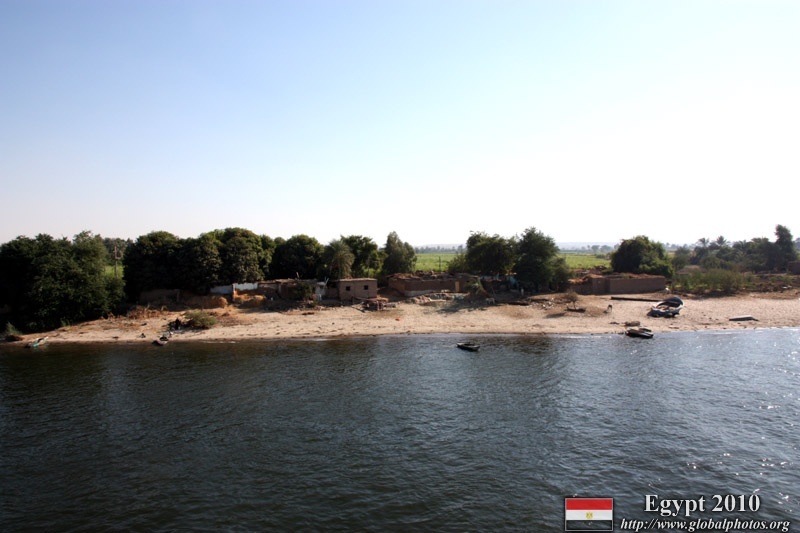 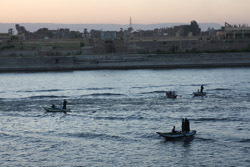 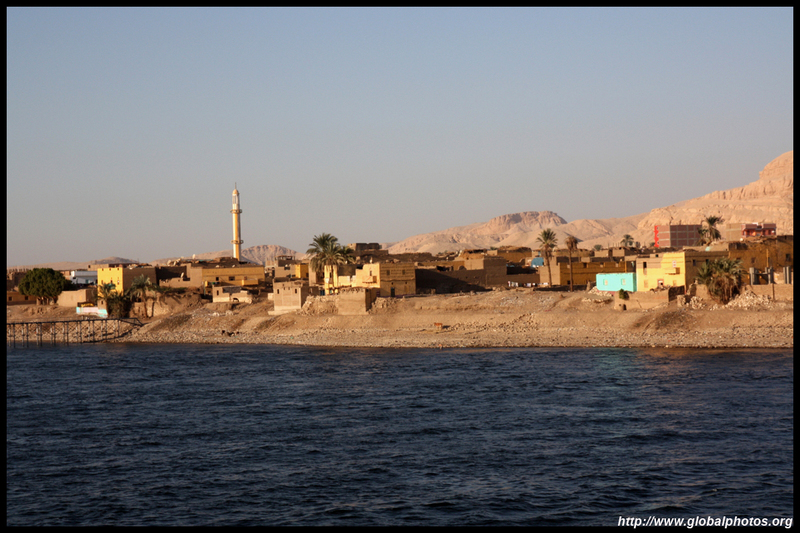 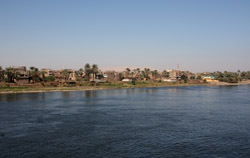 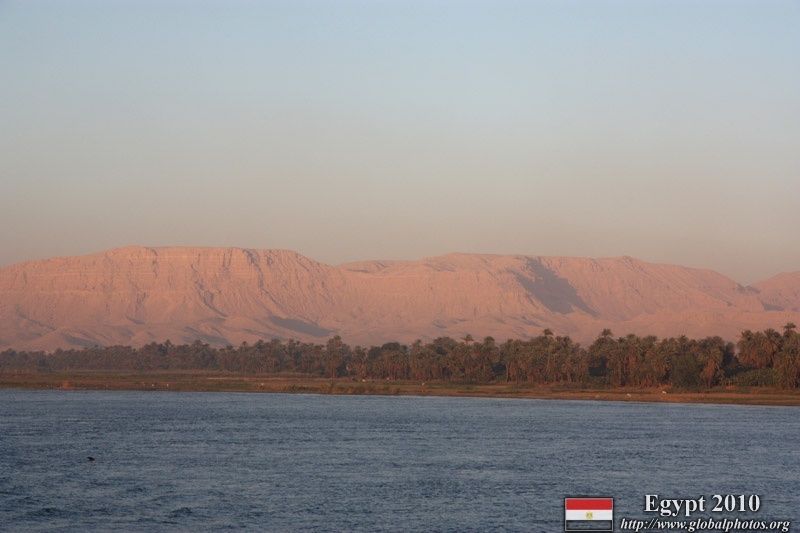 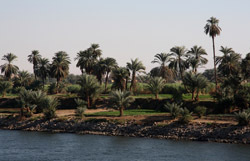 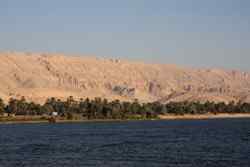 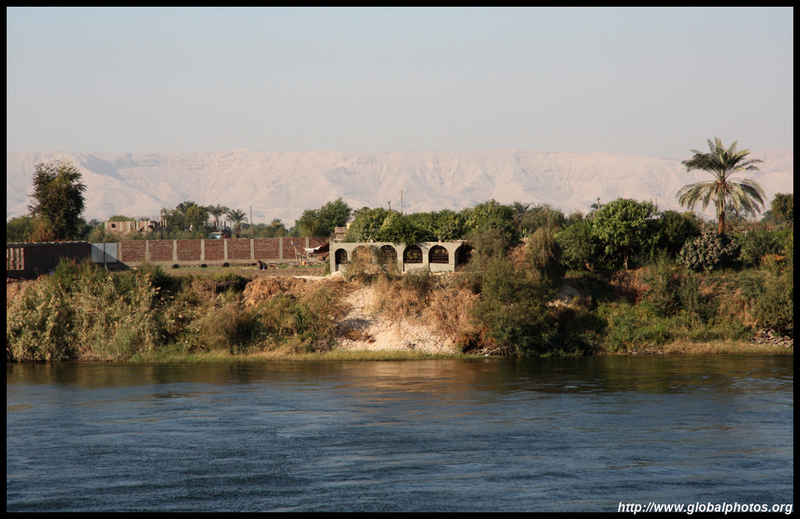 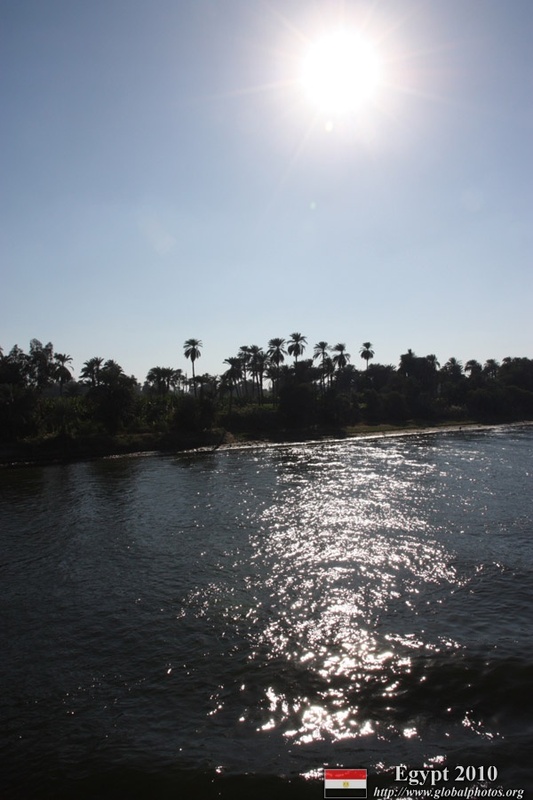 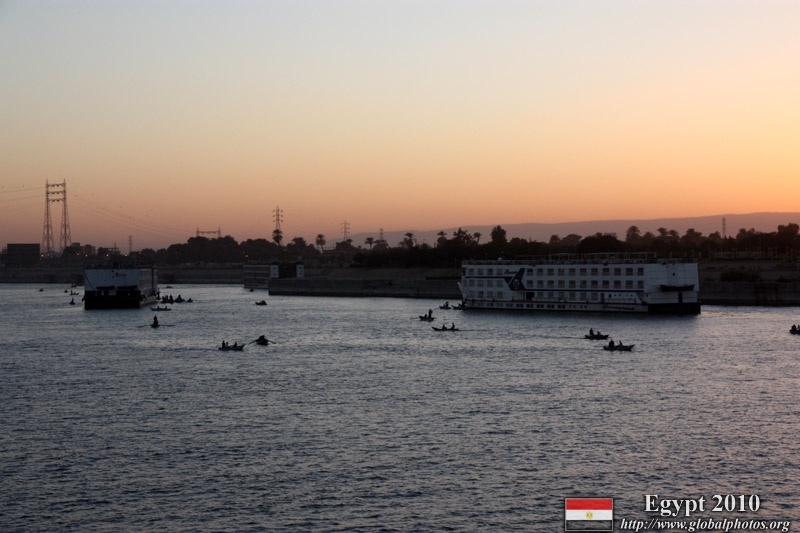 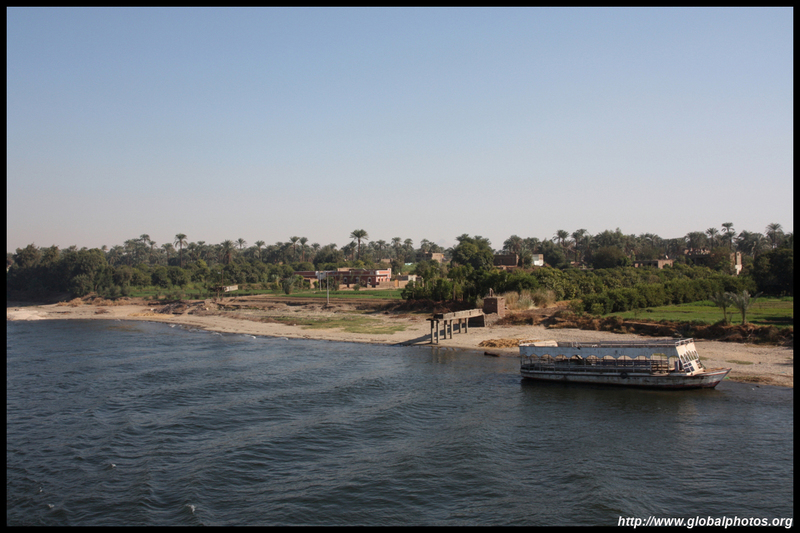 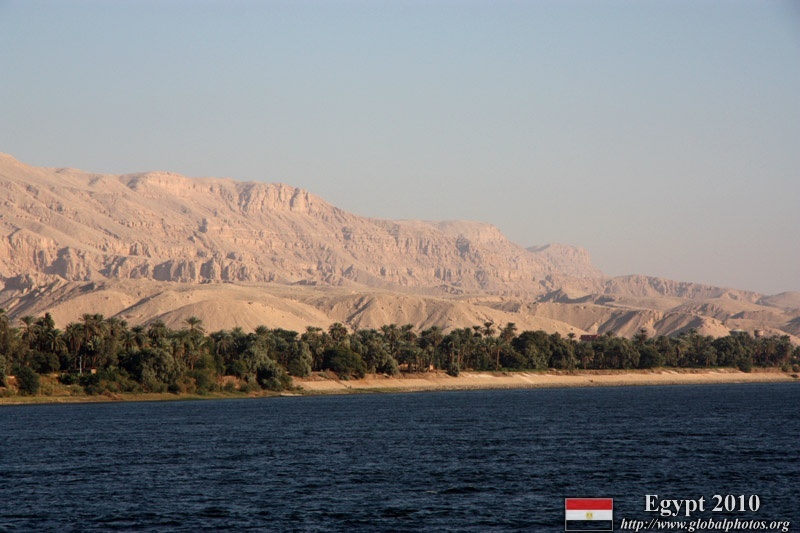 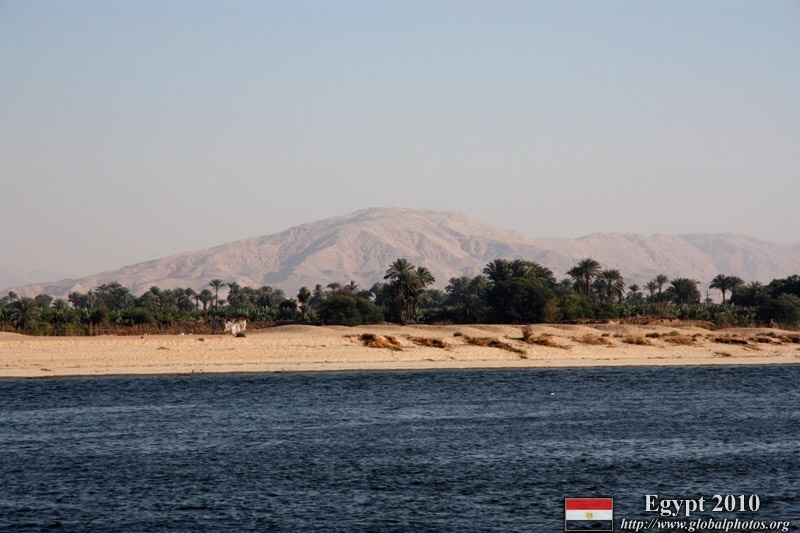 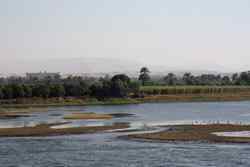 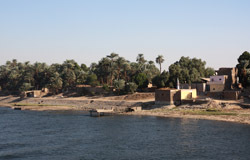 The convoy sails upstream towards Edfu. 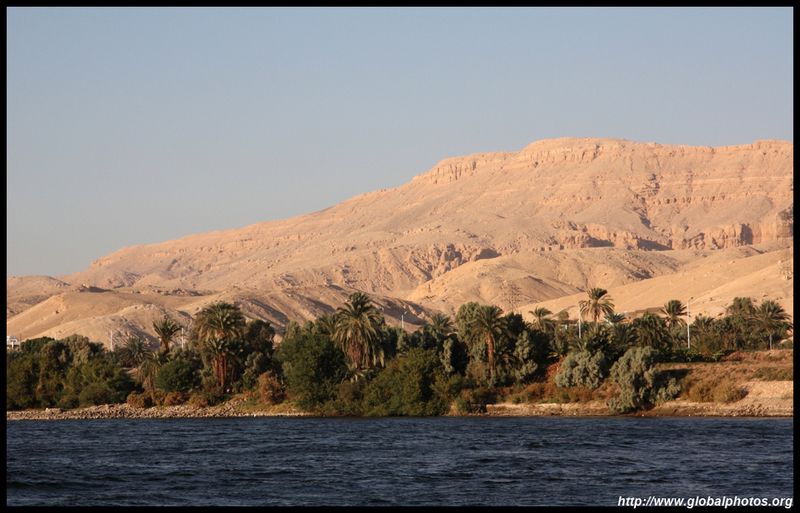 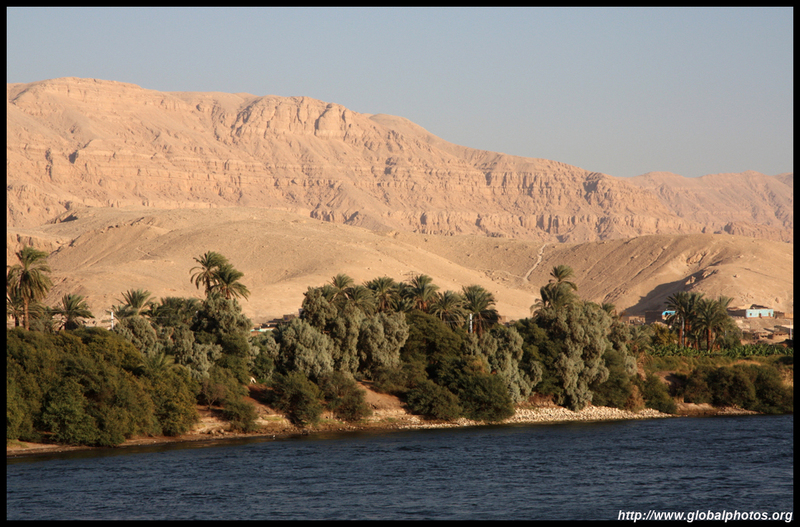 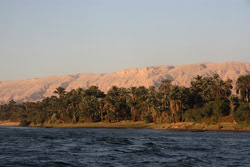 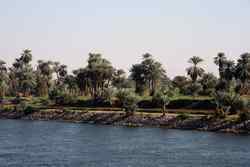 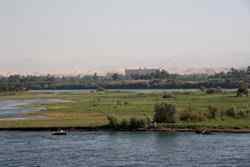 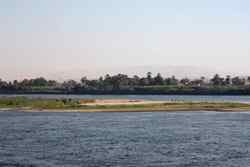 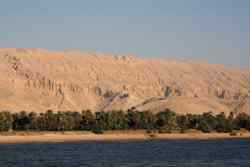 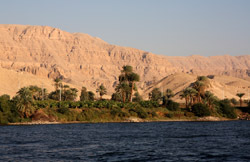 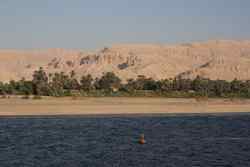 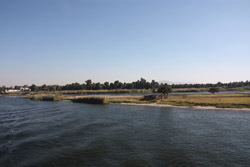 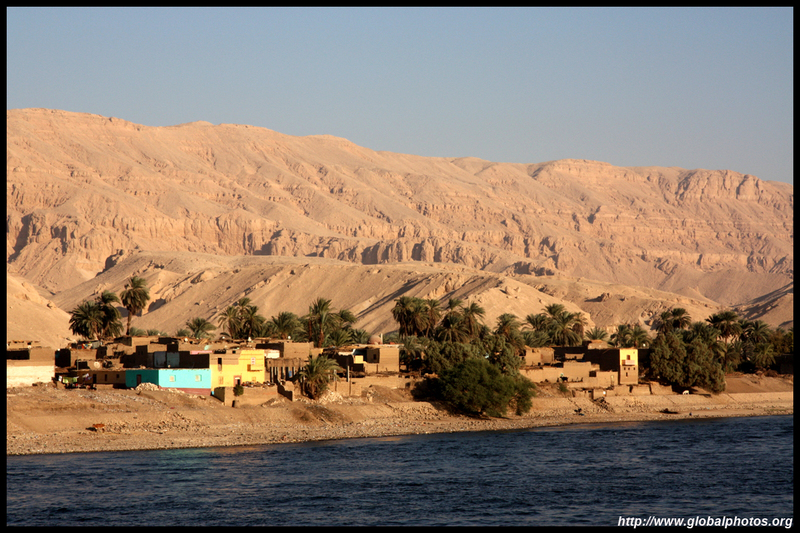 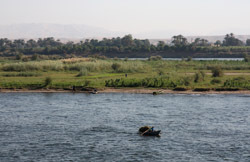 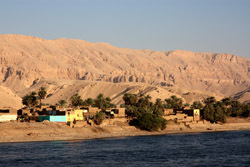 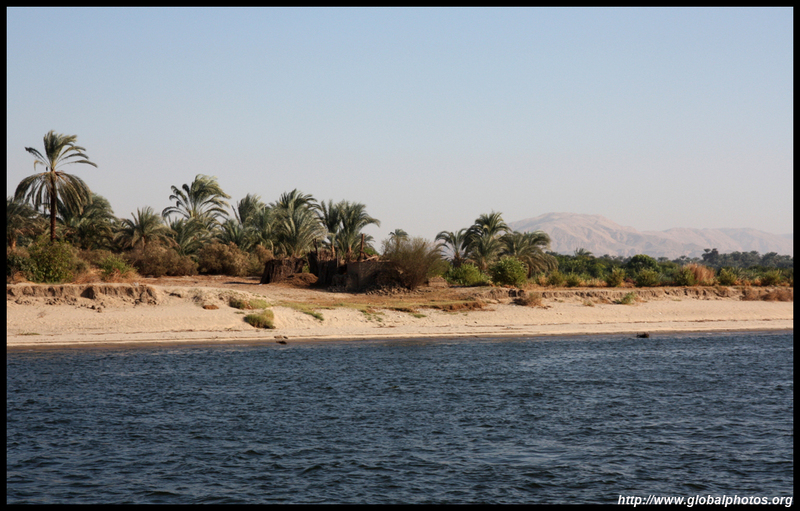 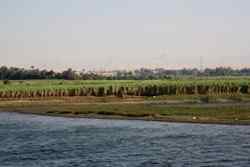 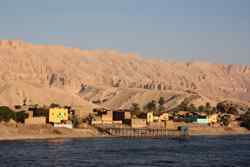 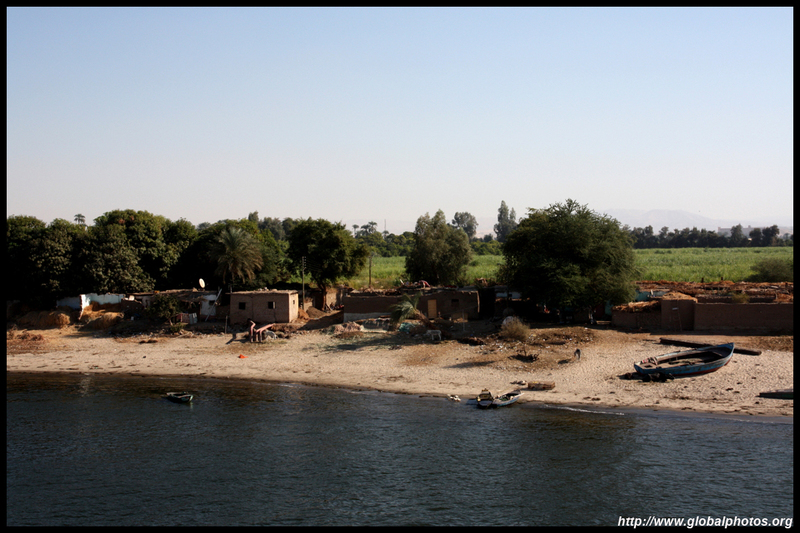 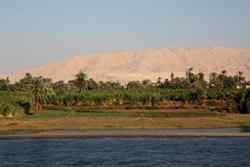 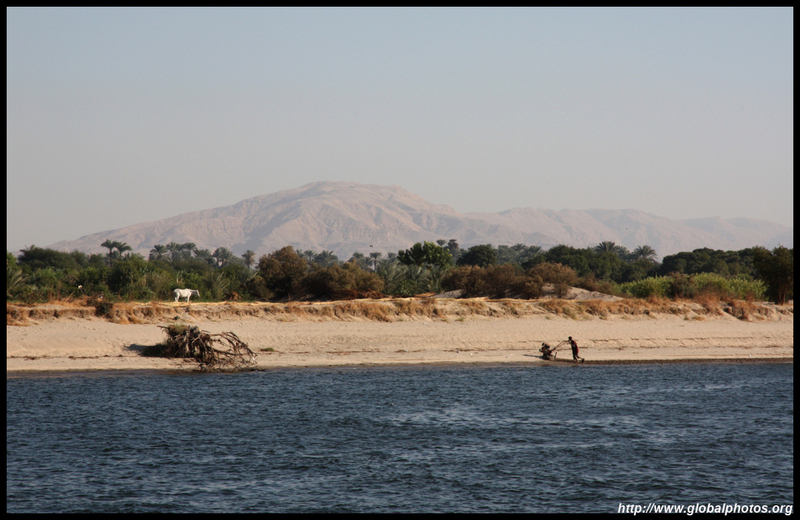 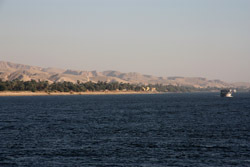 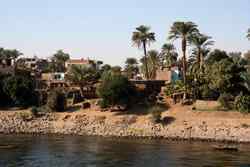 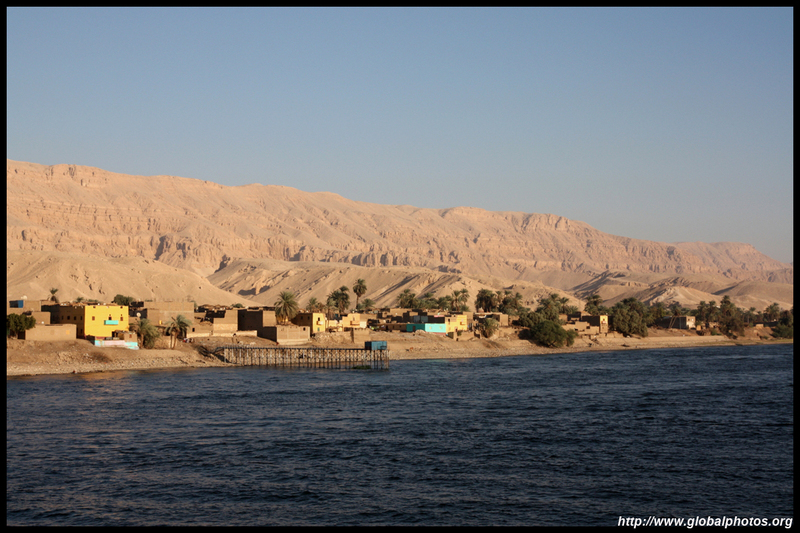 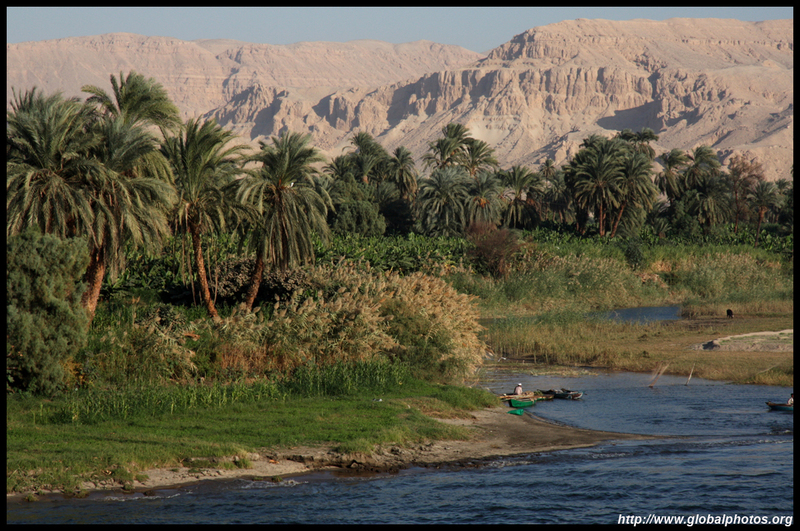 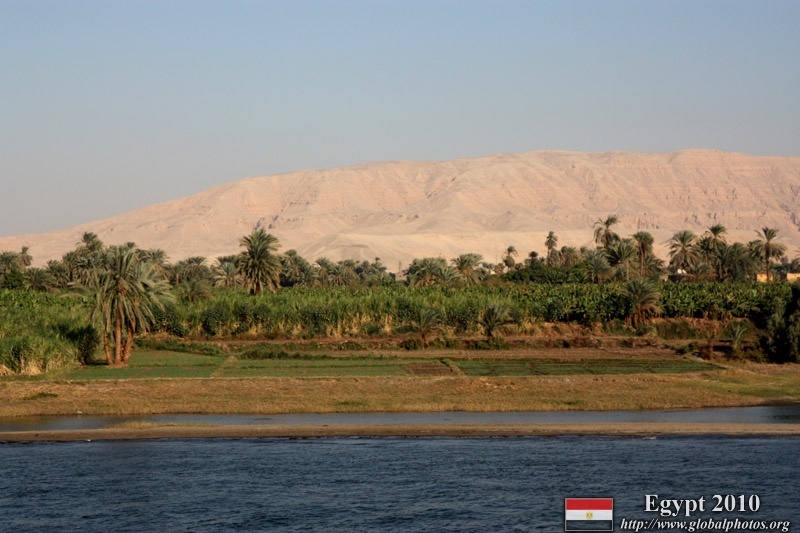 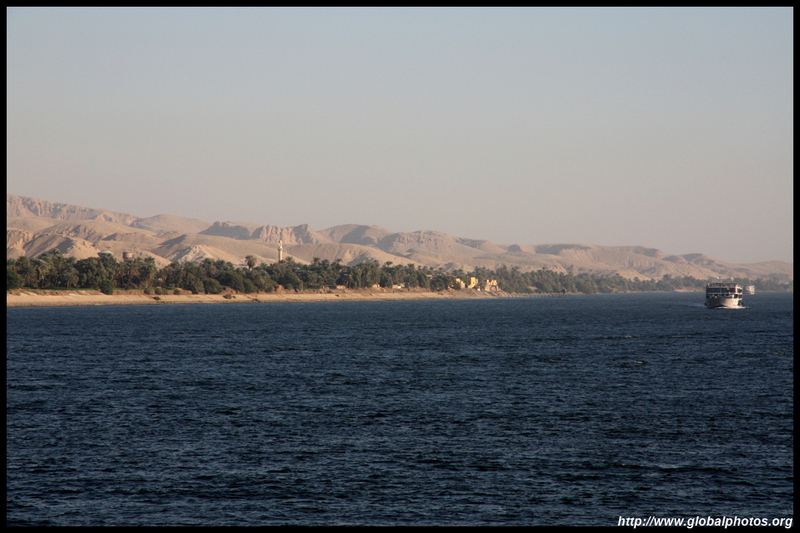 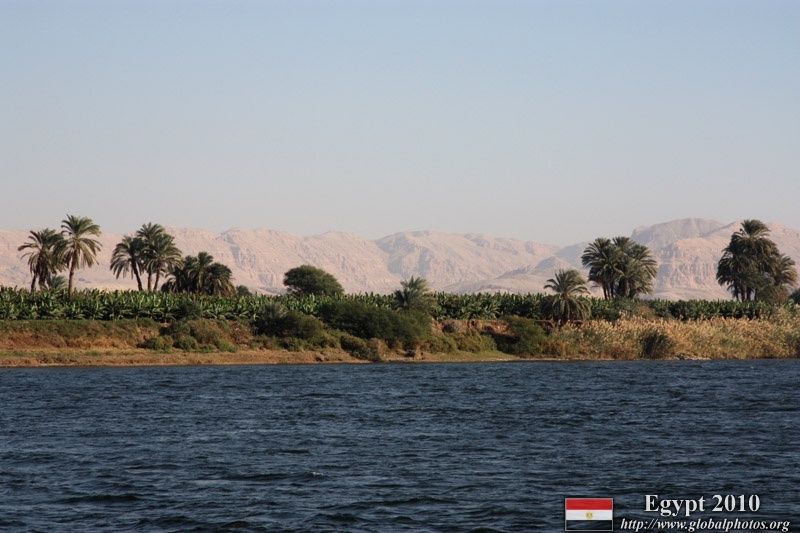 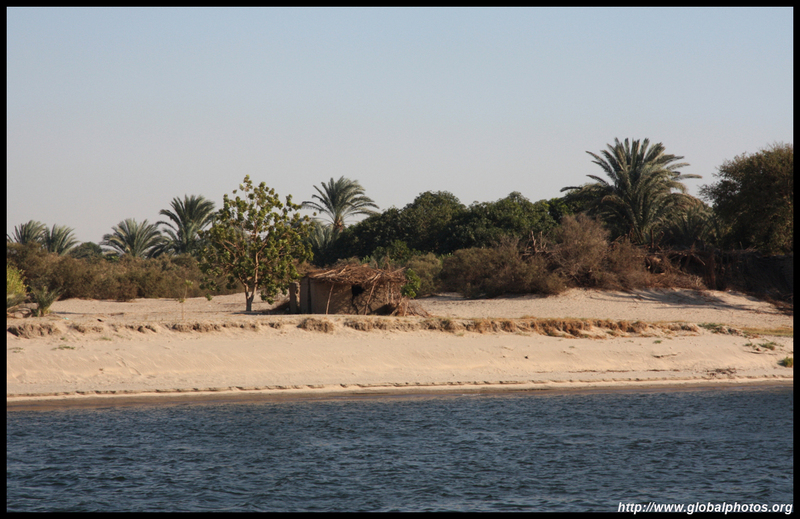 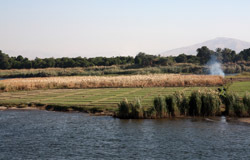 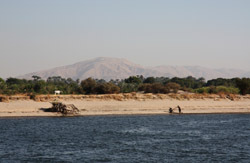 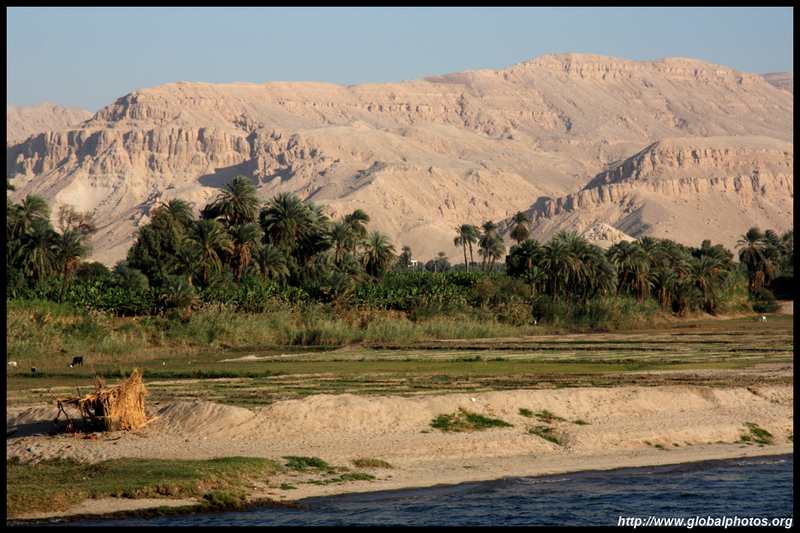 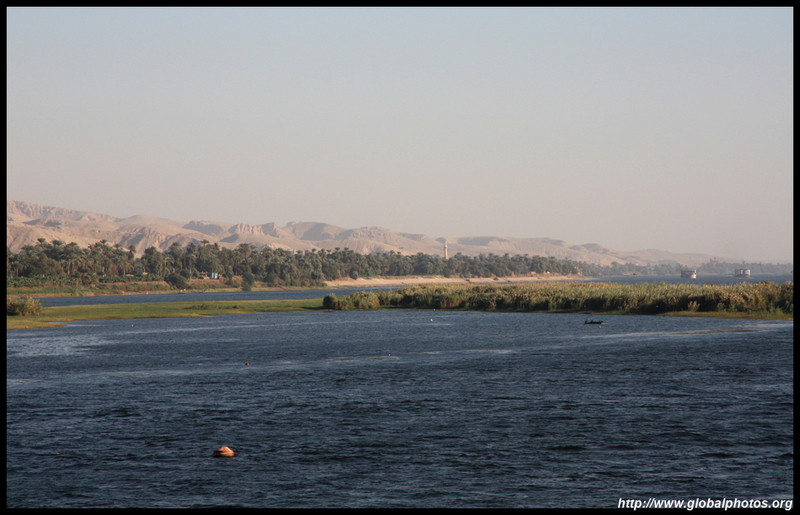 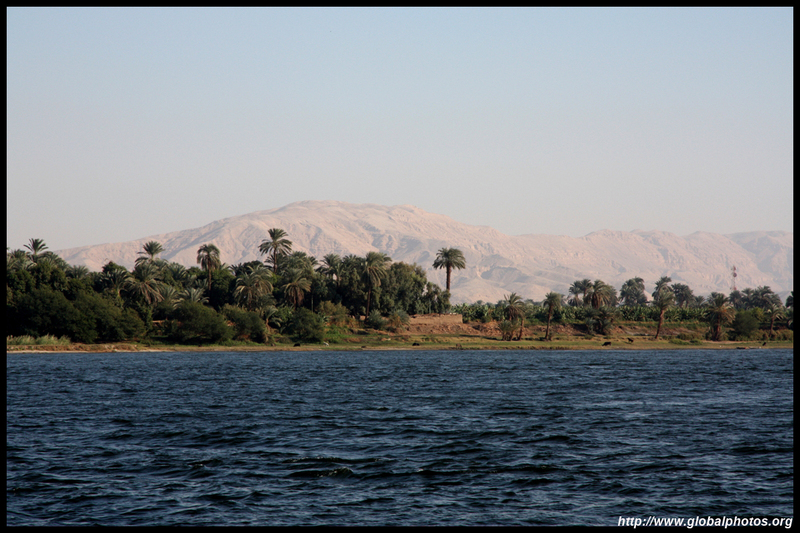 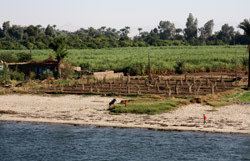 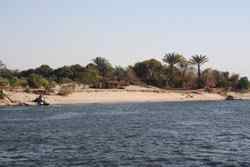 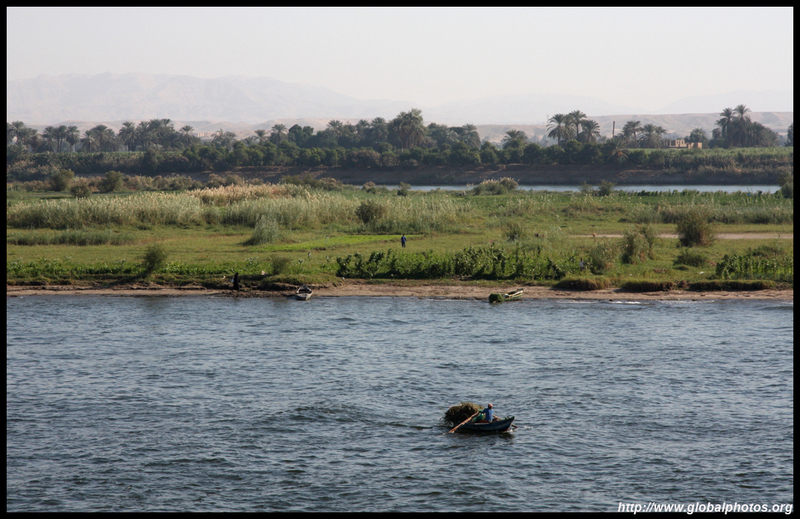 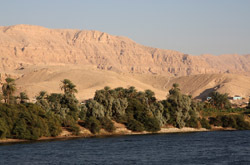 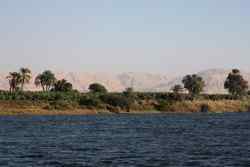 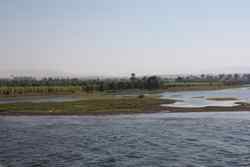 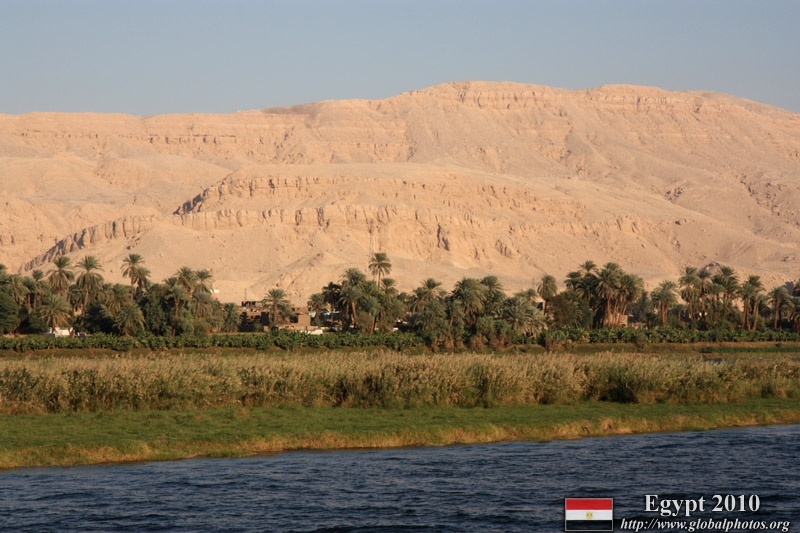 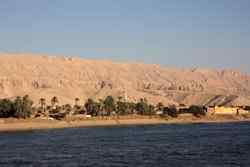 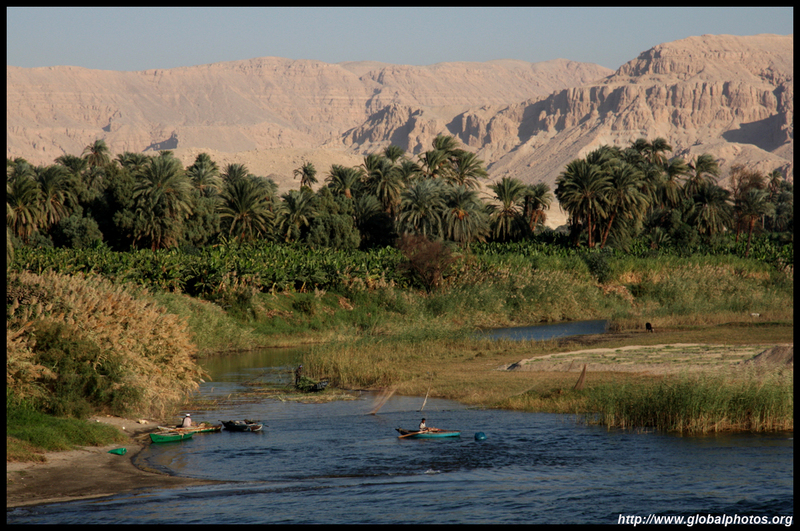 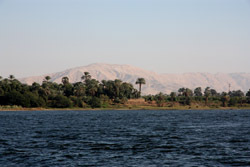 This is a land of contrasts - the Nile's very blue colour is offset by the green vegetation by the shore and the sandy yellow hills in the background. 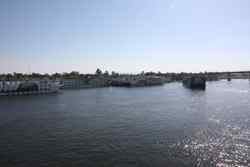 A series of small boats soon surrounded the cruise boats as we slowed and stopped by the lock. 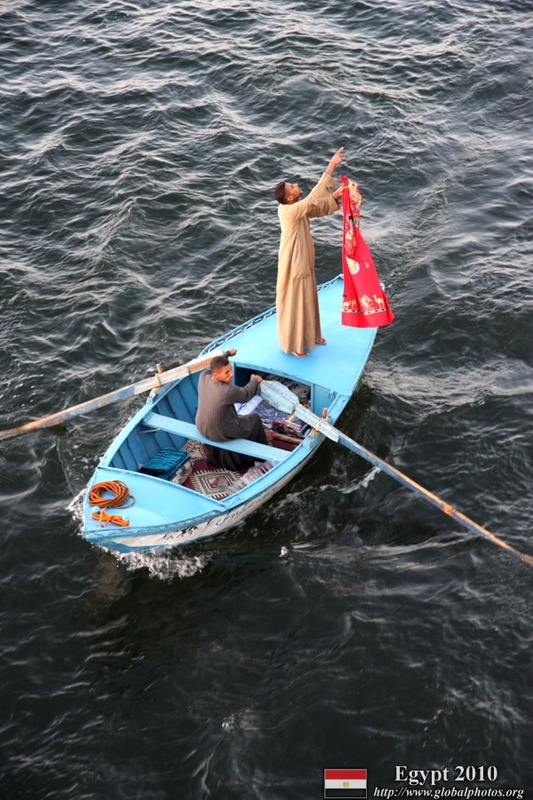 They were selling wares wrapped in plastic bags, which they would hurl onboard to interested tourists. 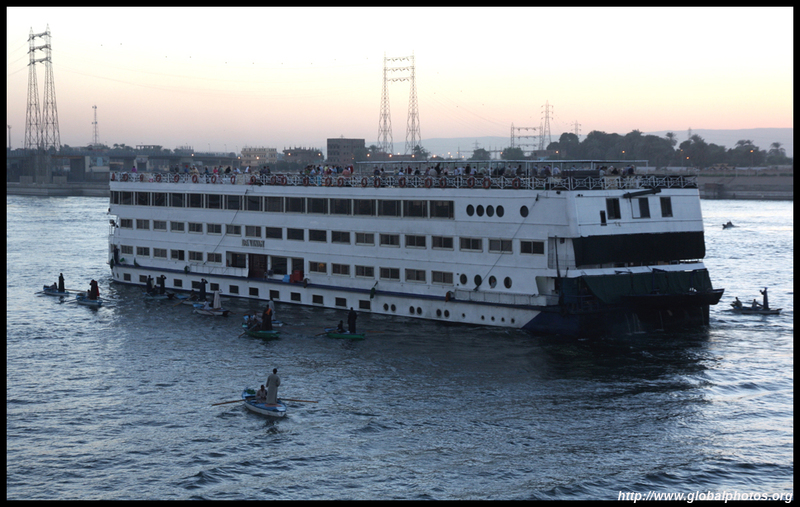 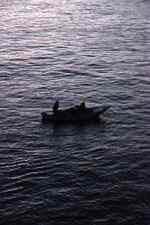 They even attached themselves to the cruise boat by rope to remain steady. 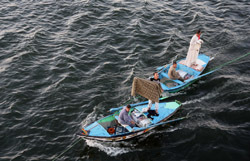 "One dollar, one dollar ..."
The hawkers on boats were relentless, with loud voices and good lungs to keep going for a long time. 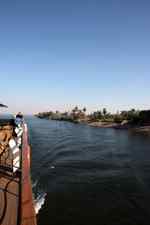 The wait to enter the locks took a very long time, and about 2 hours after we arrived, we finally passed.